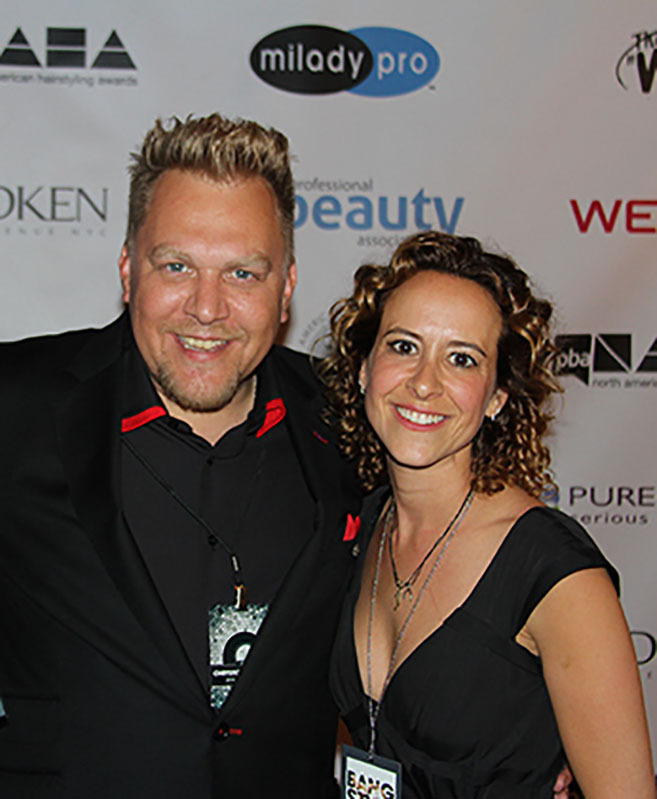 The Matrix Artistic Director comes home with an armful of well-deserved awards. 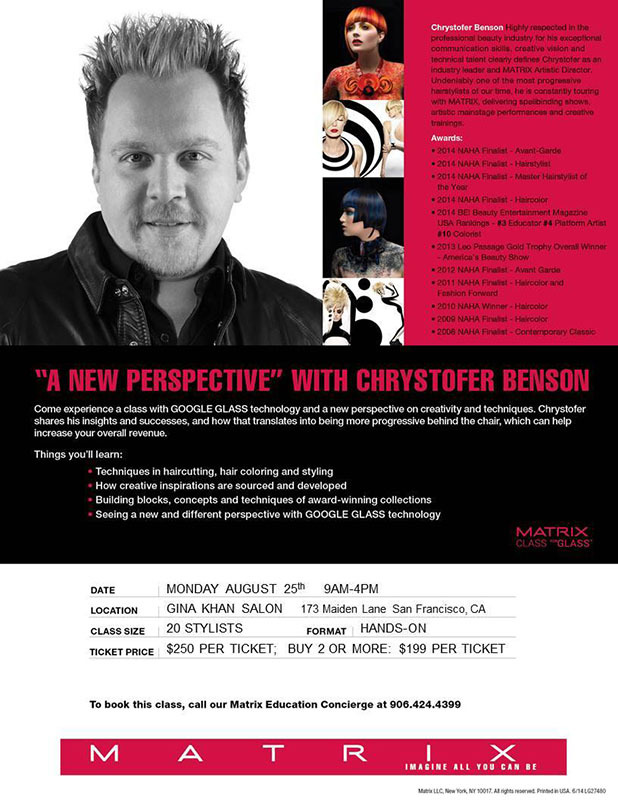 This year at America’s Beauty Show, Matrix Artistic Director Chrystofer Benson’s abundant skills, talent, and visions seemed to dominate the field as he wowed crowds with his futuristic black and white creation on stage. 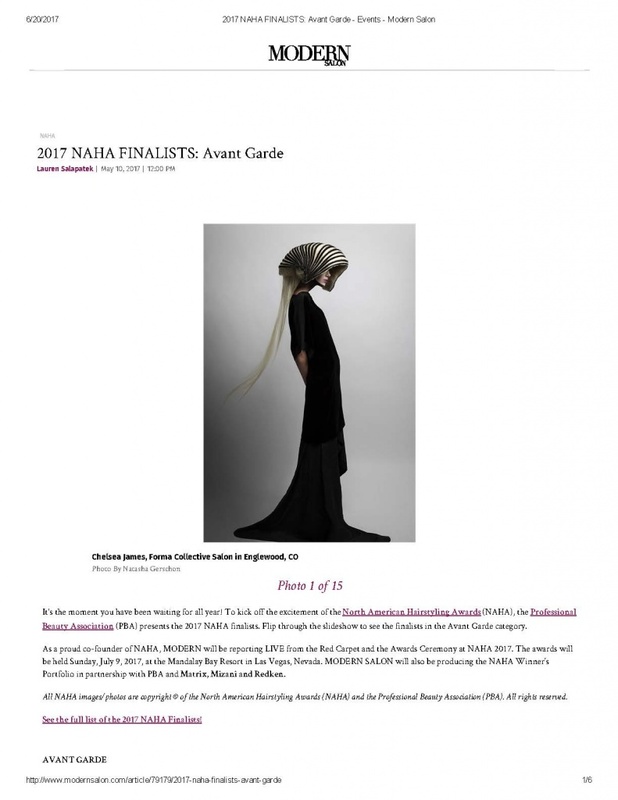 But he also took the Stars Photo and Fashion Competition by storm sweeping away top prizes in three of the seven professional categories. 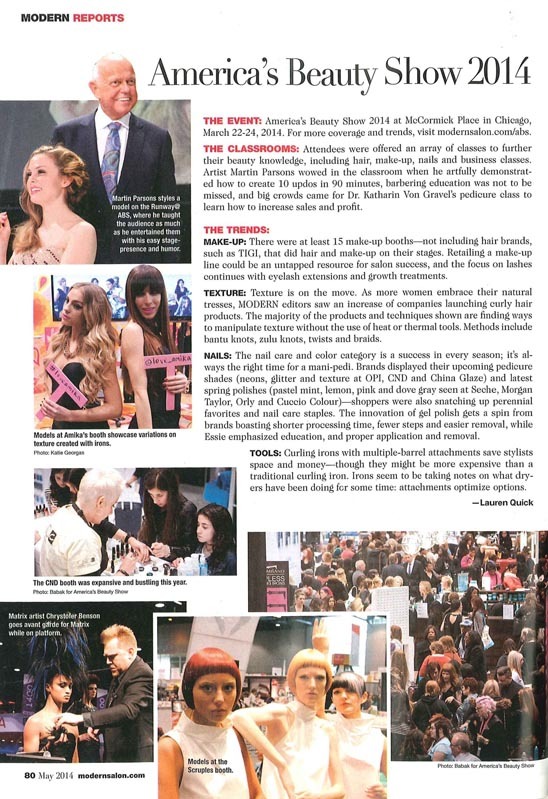 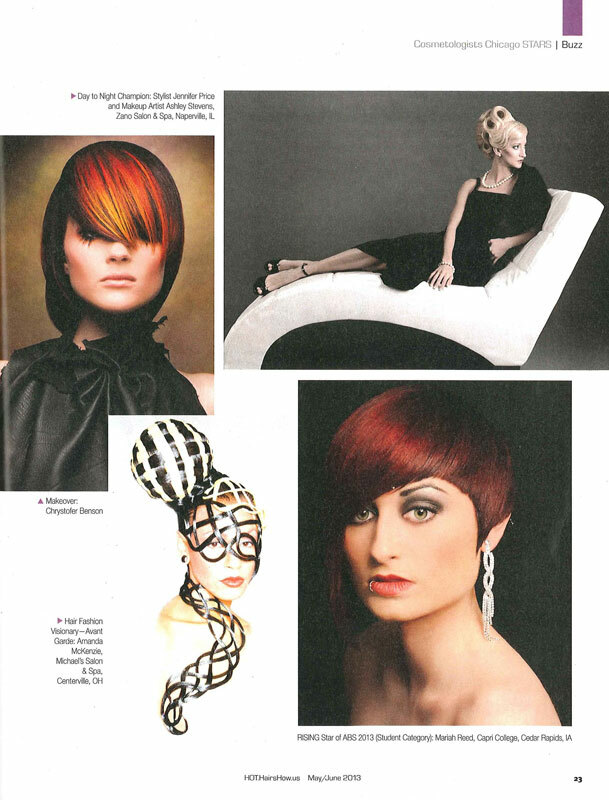 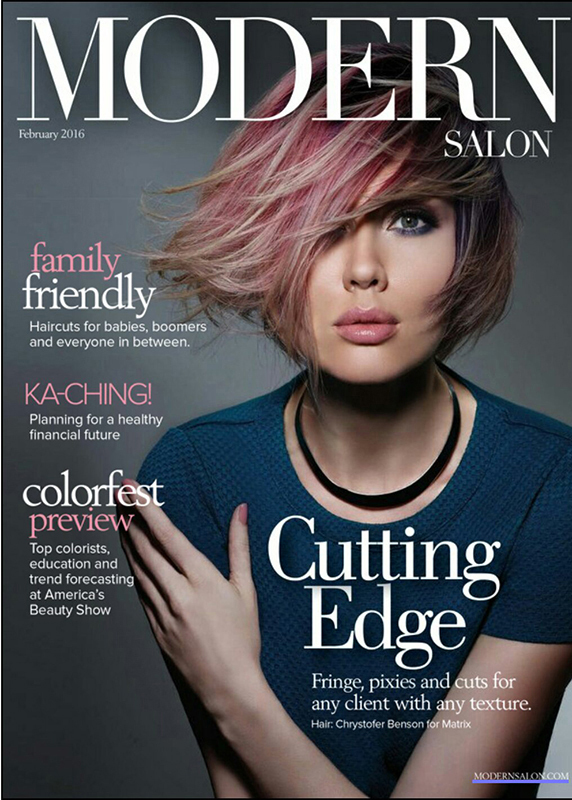 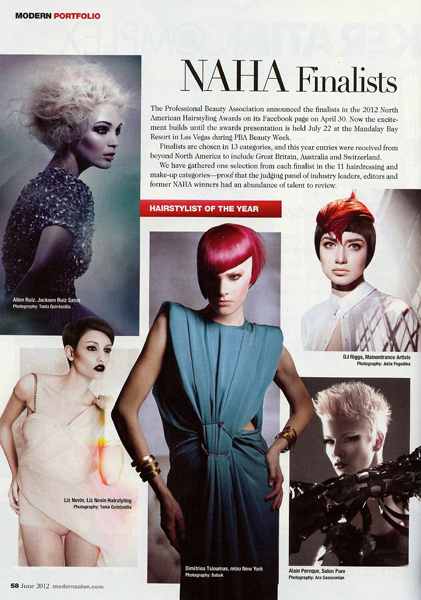 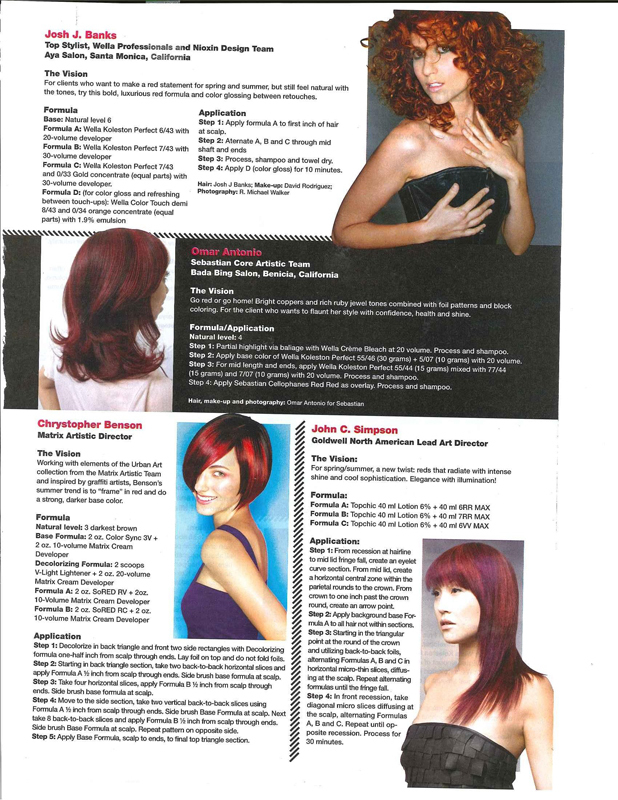 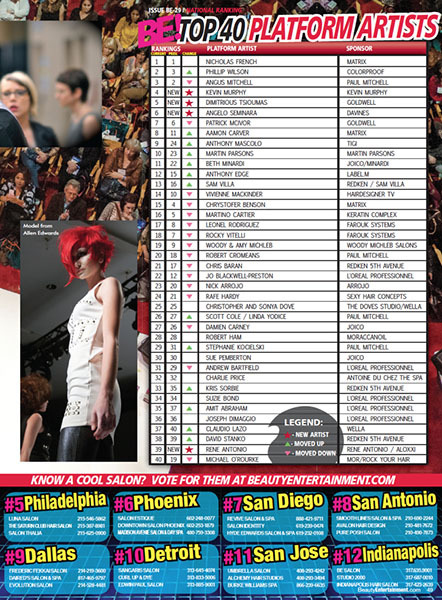 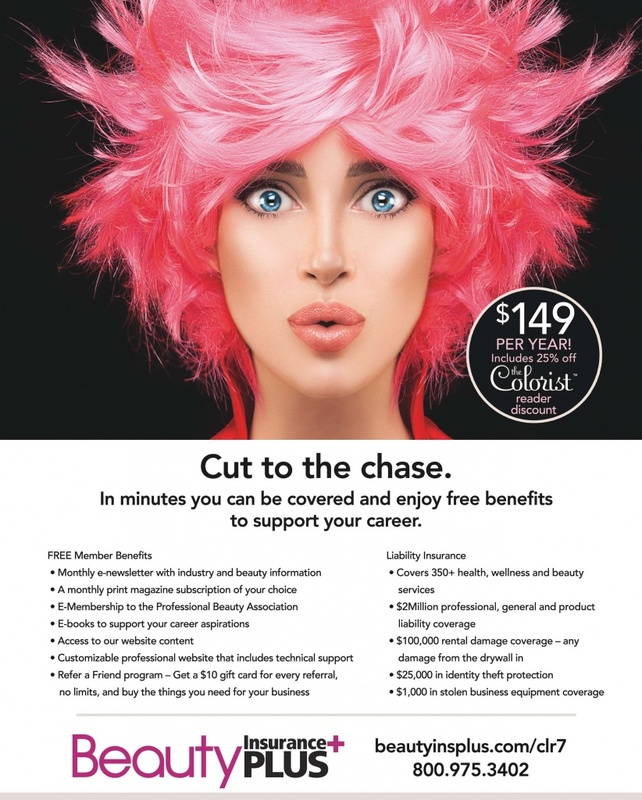 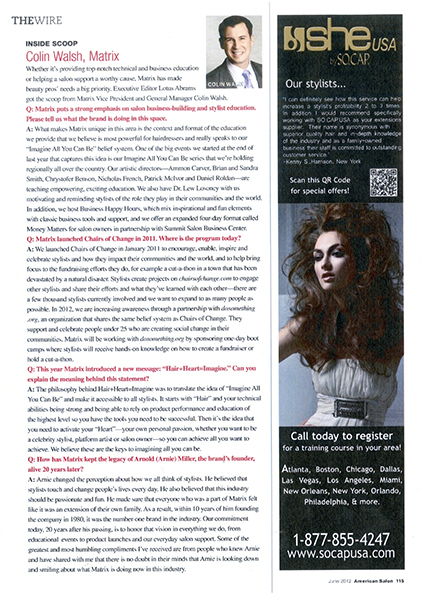 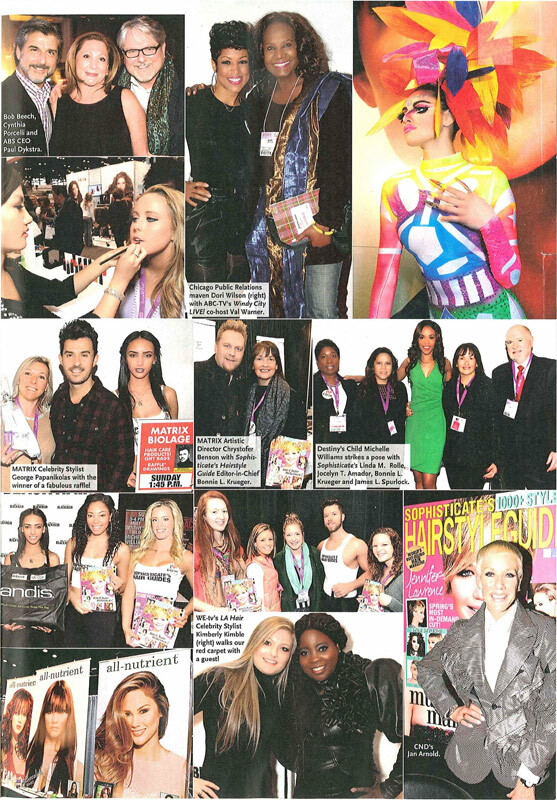 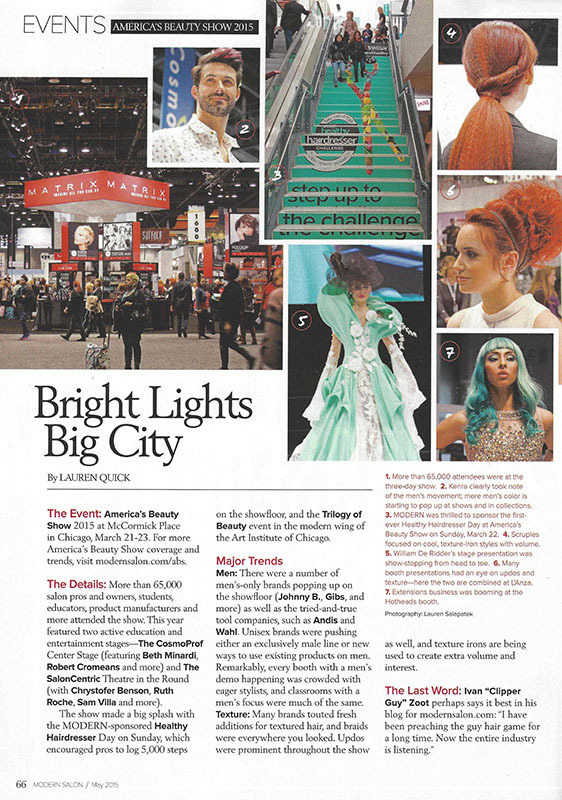 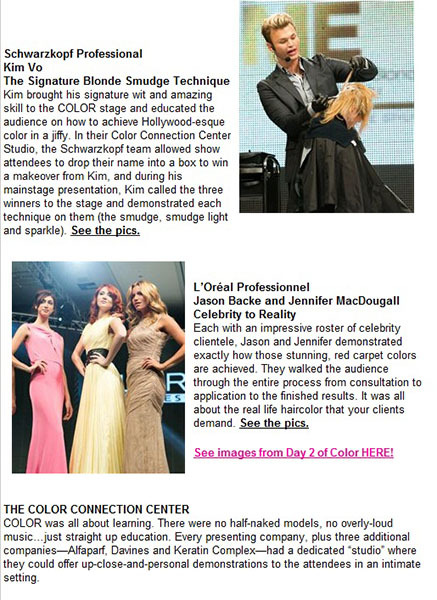 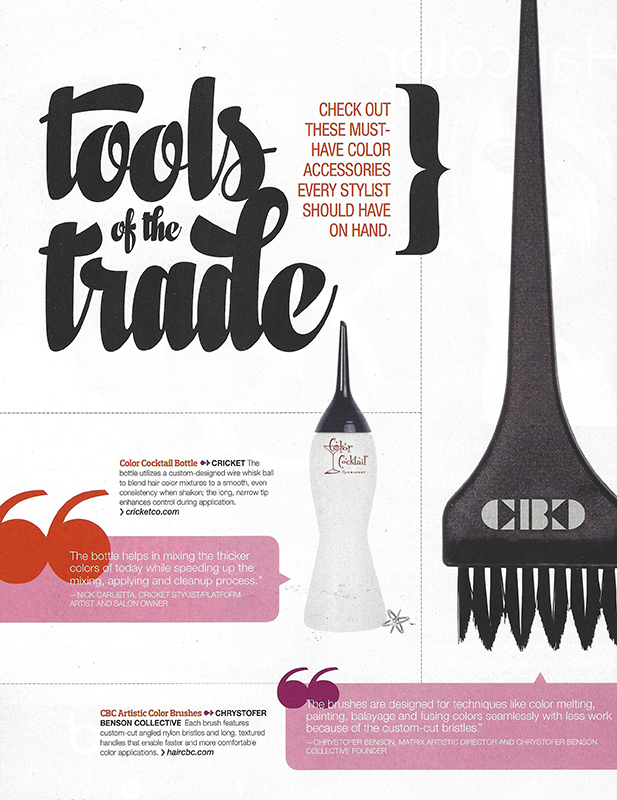 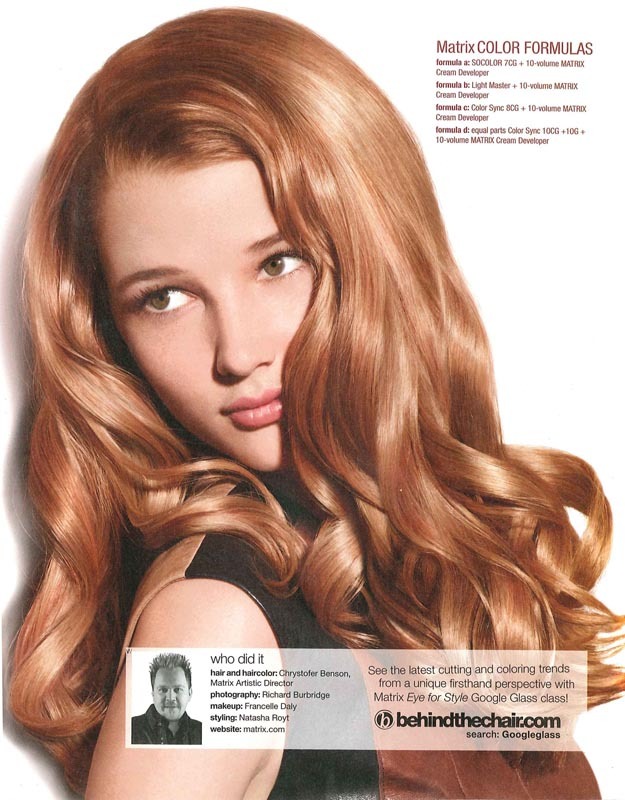 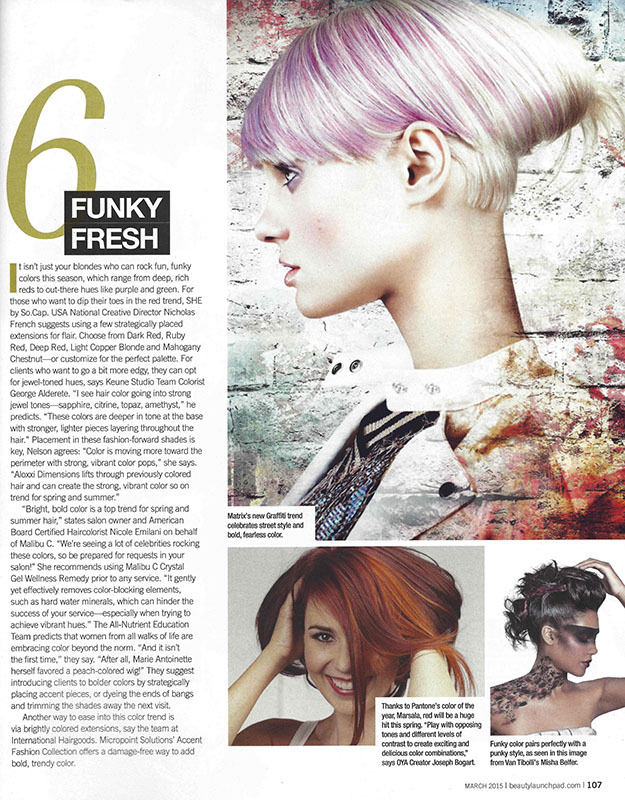 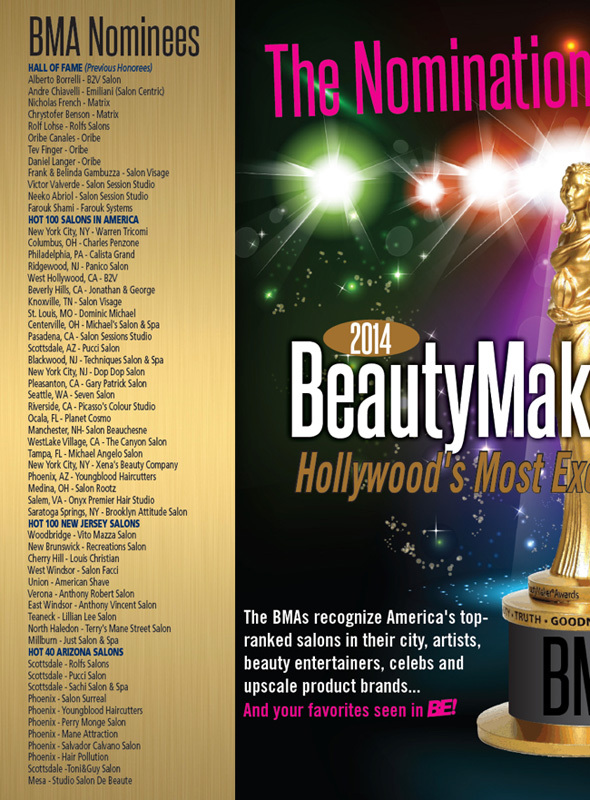 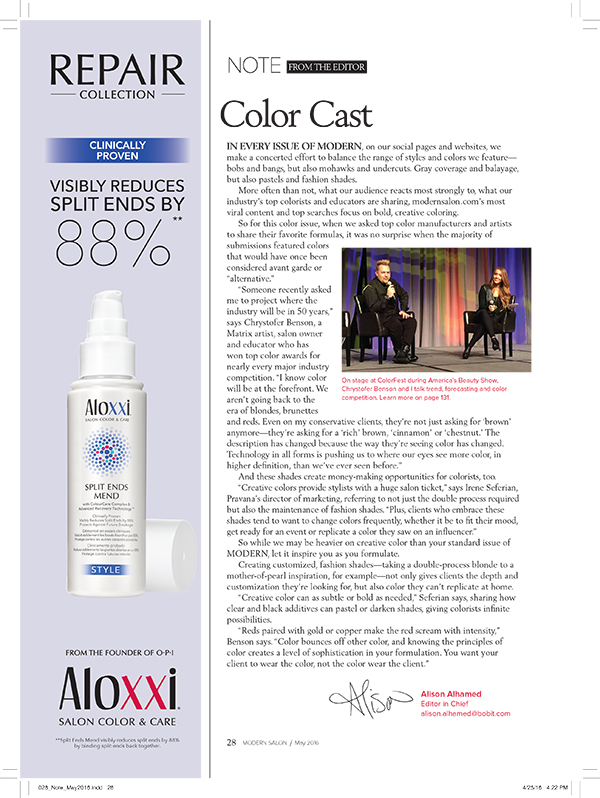 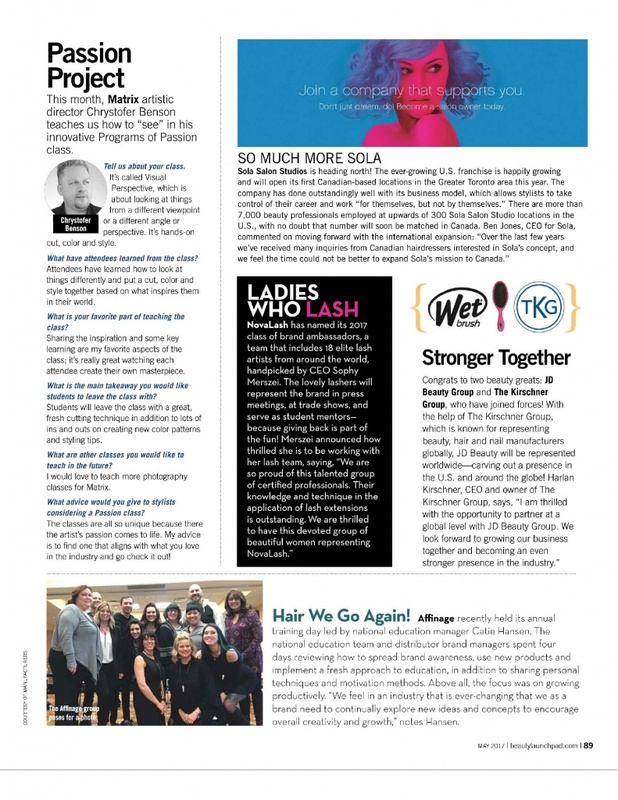 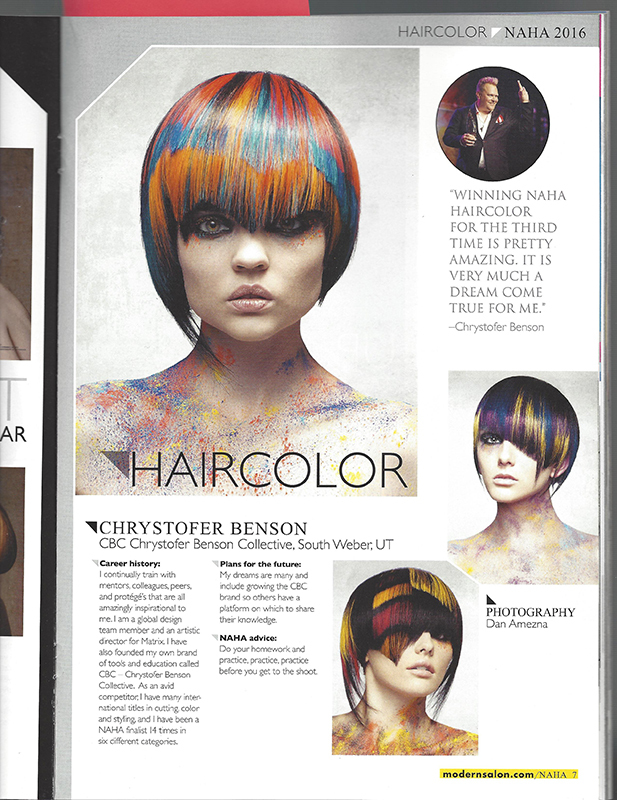 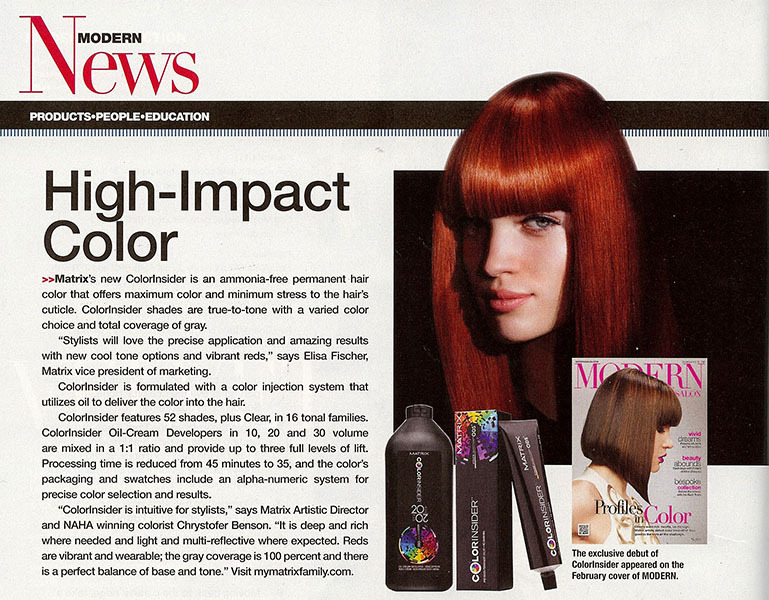 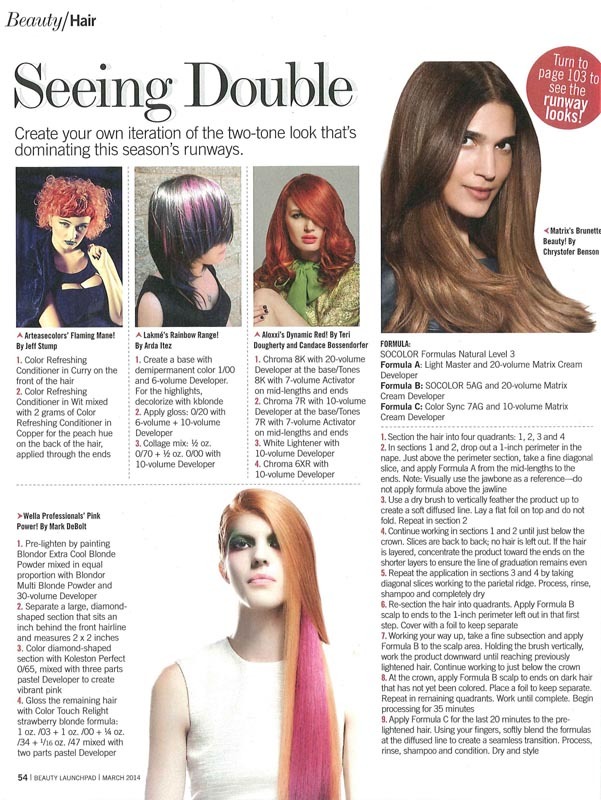 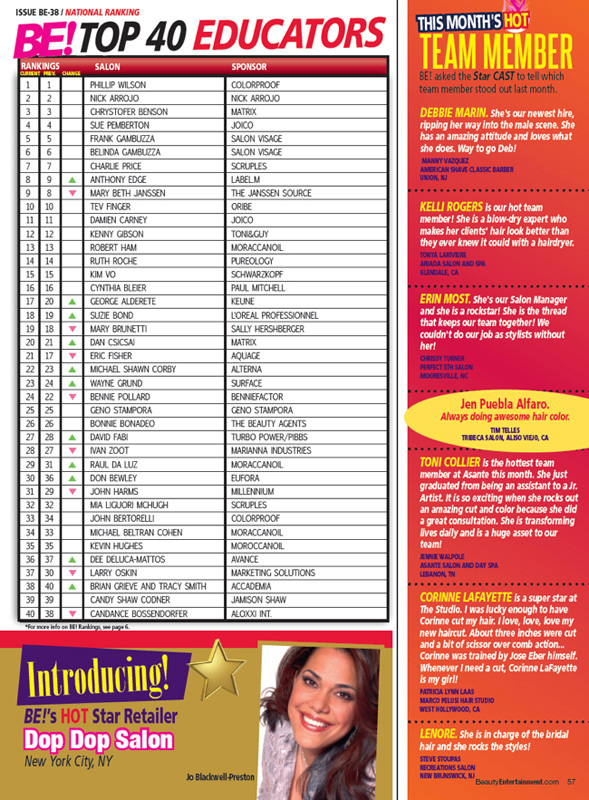 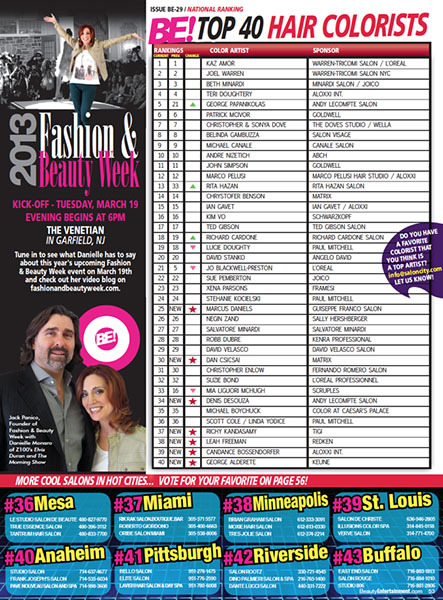 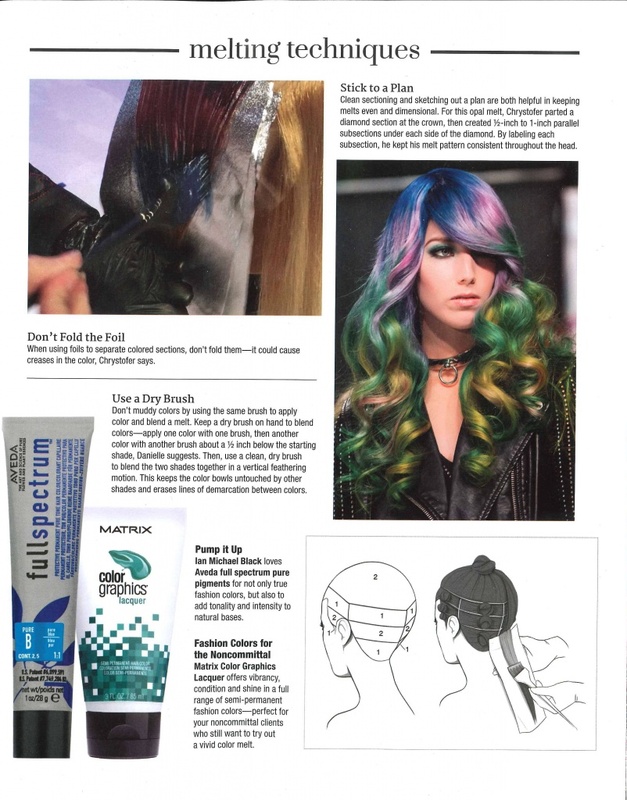 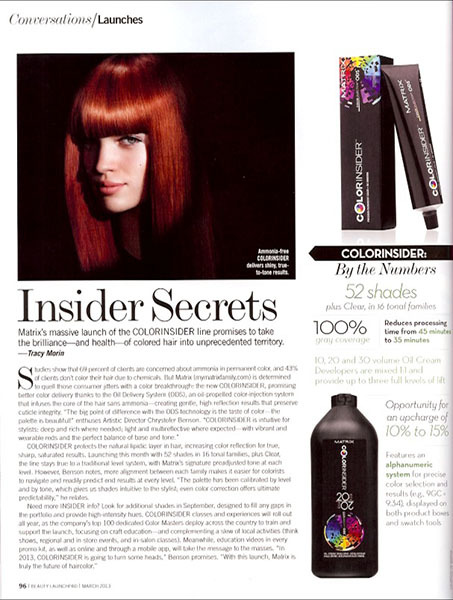 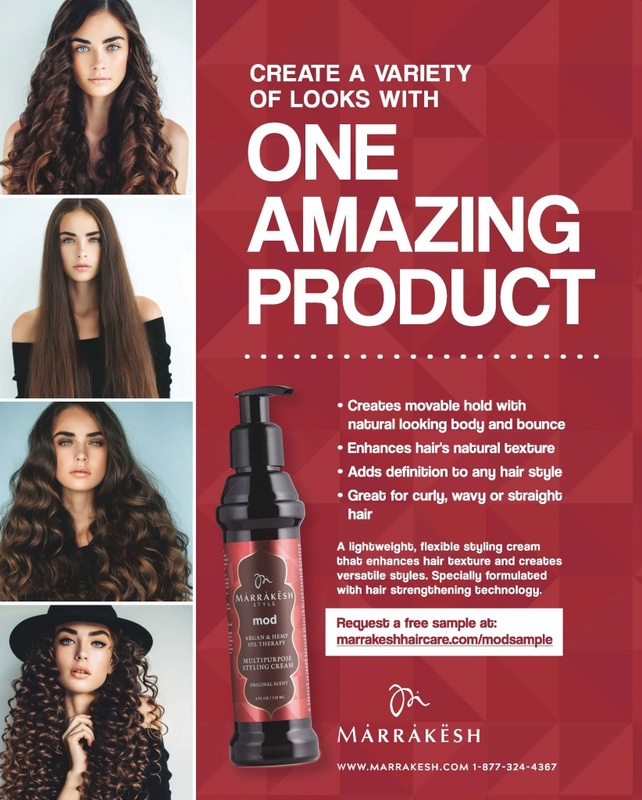 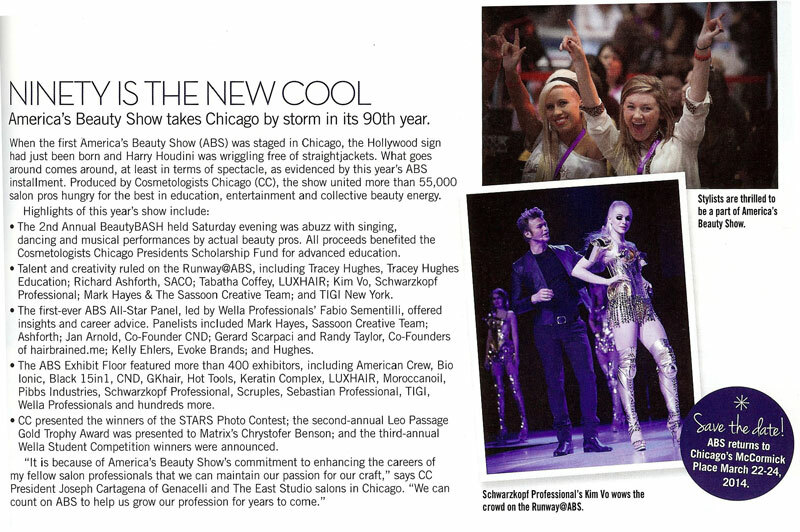 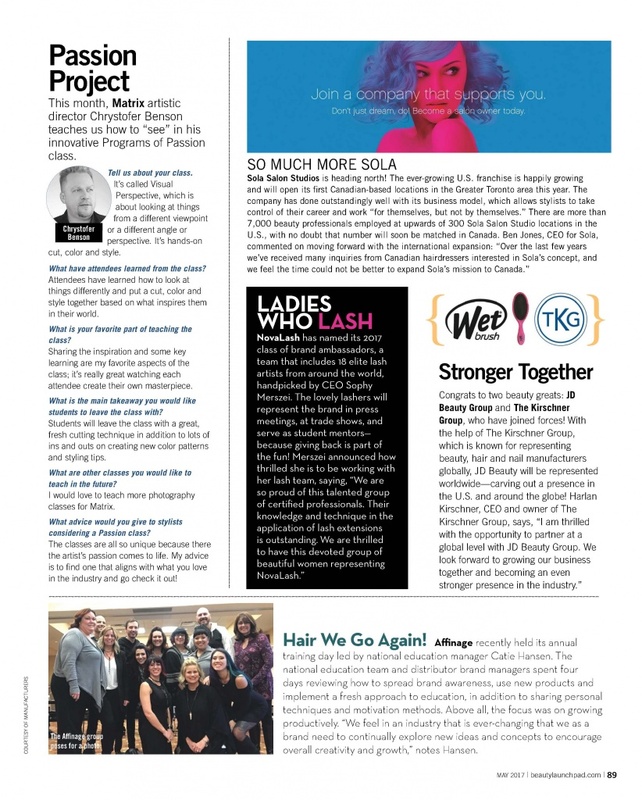 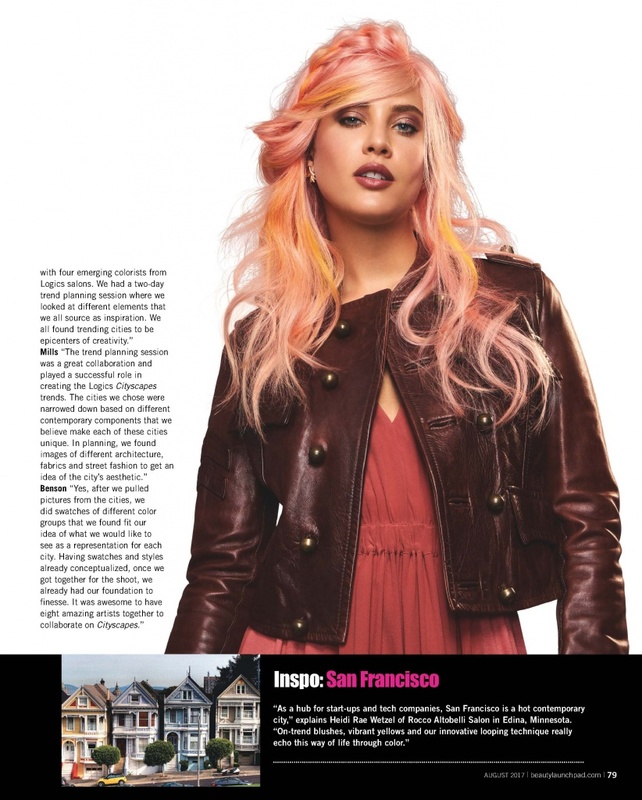 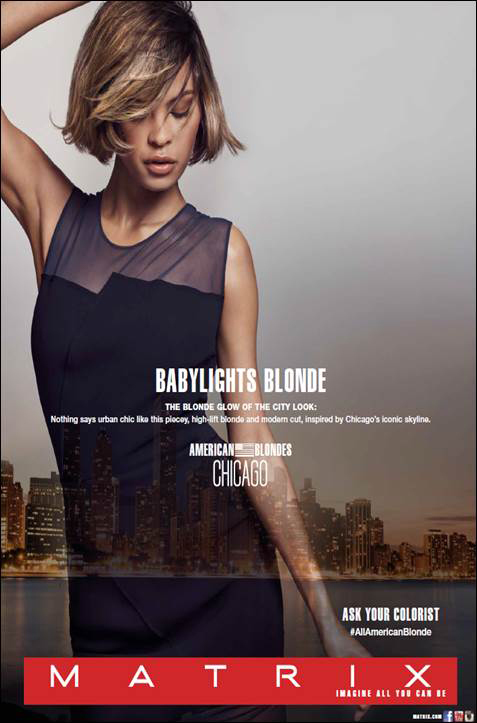 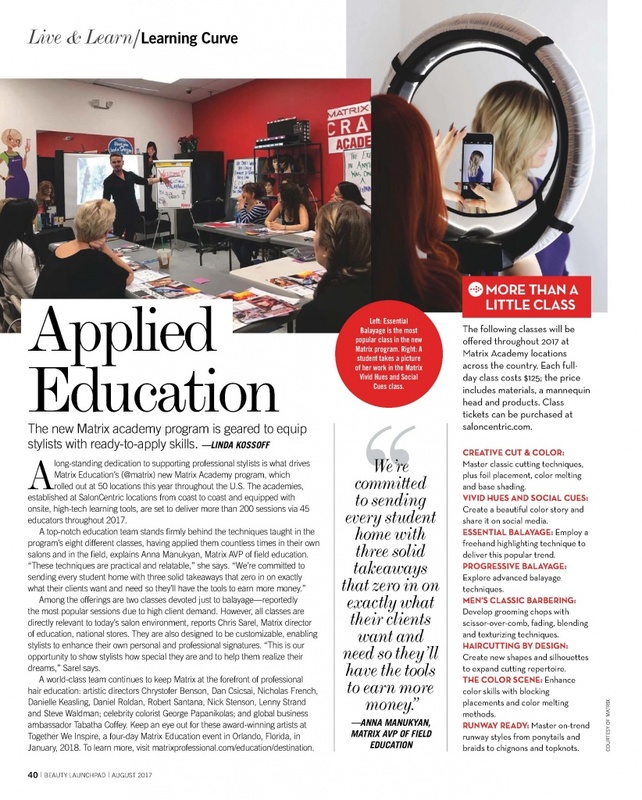 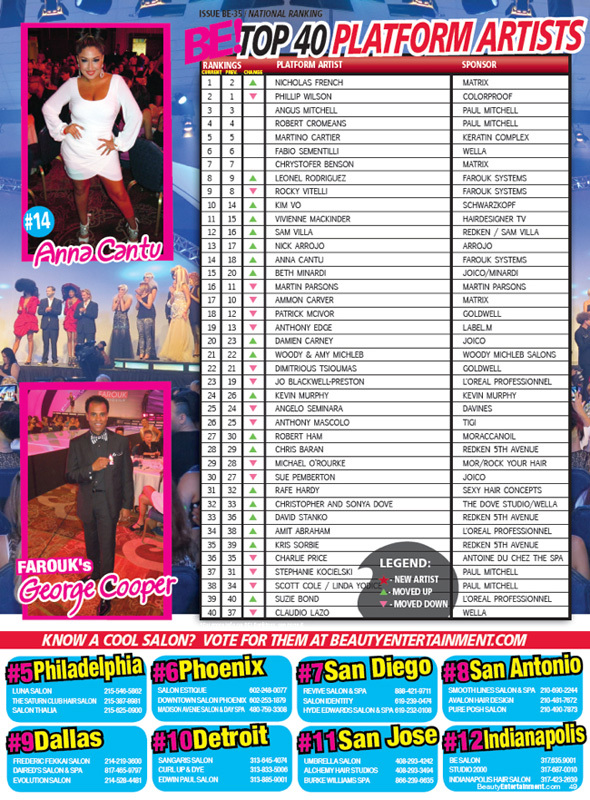 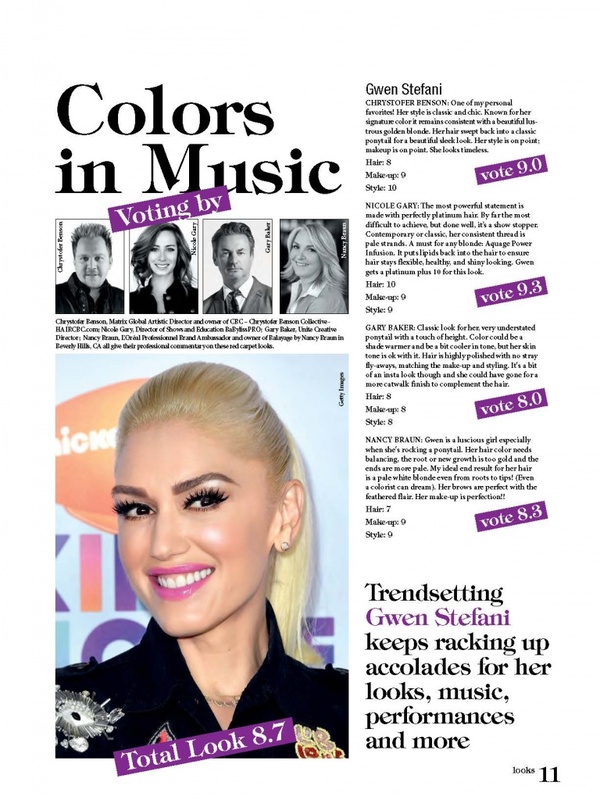 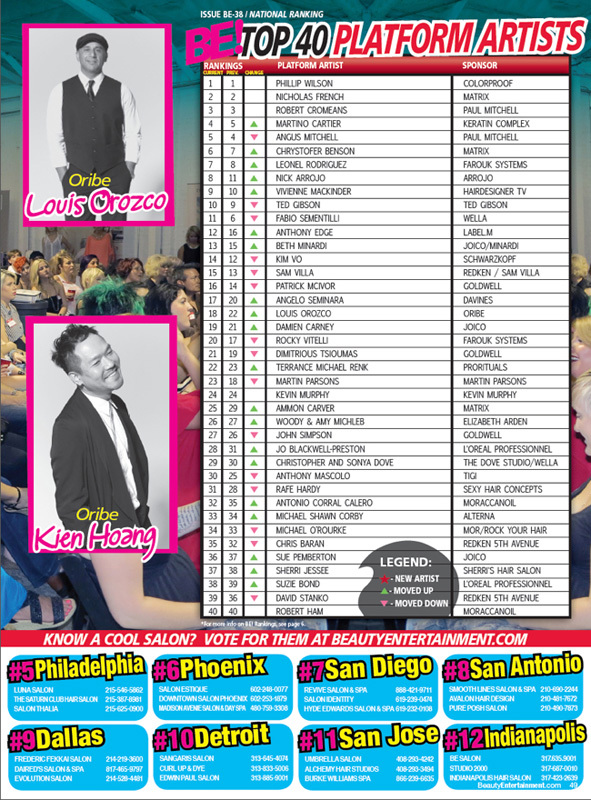 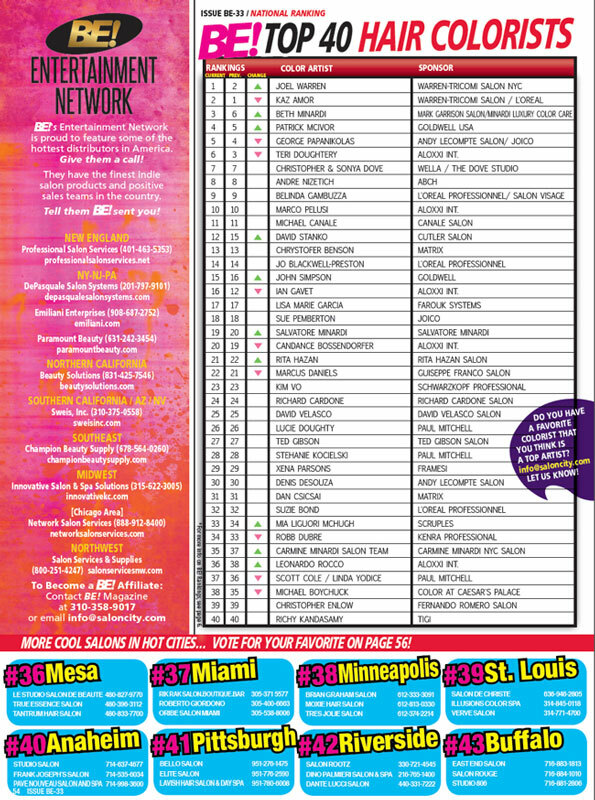 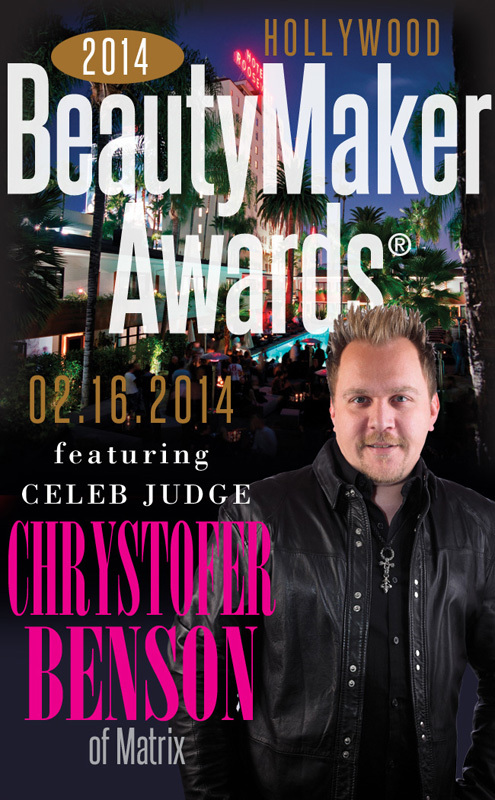 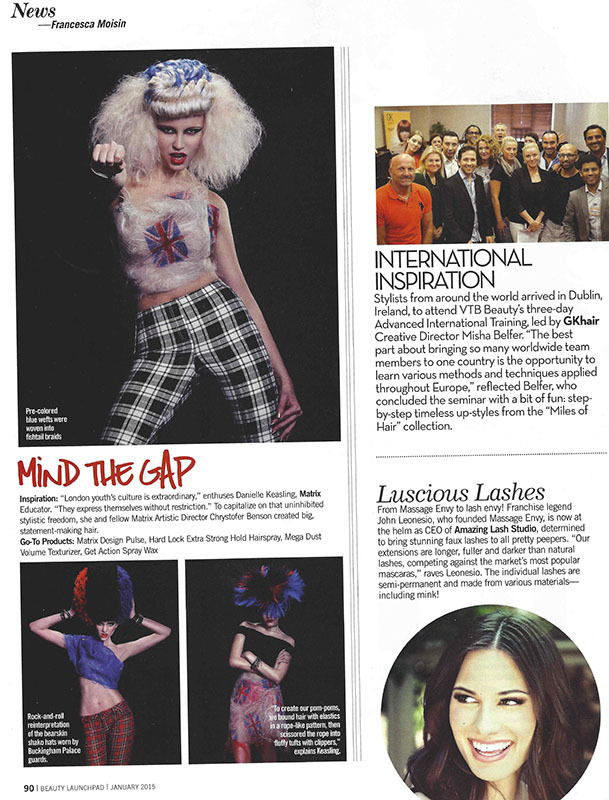 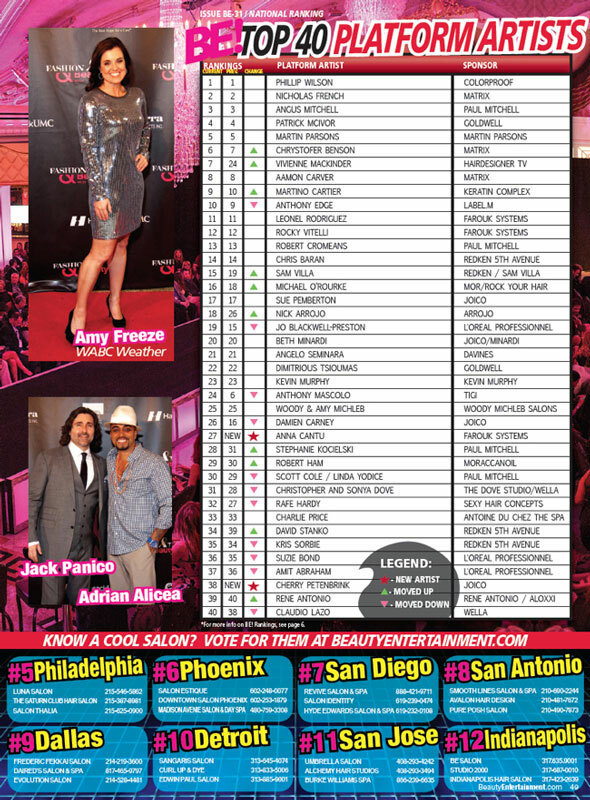 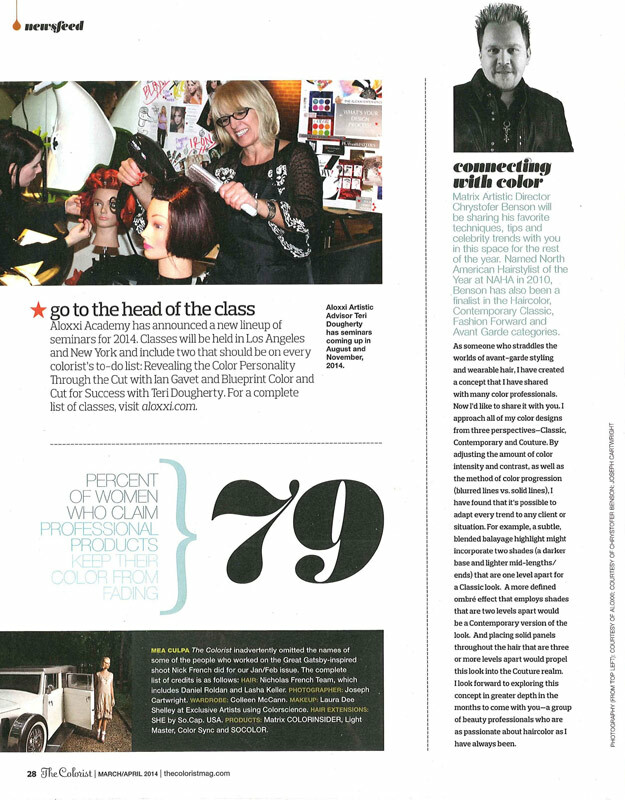 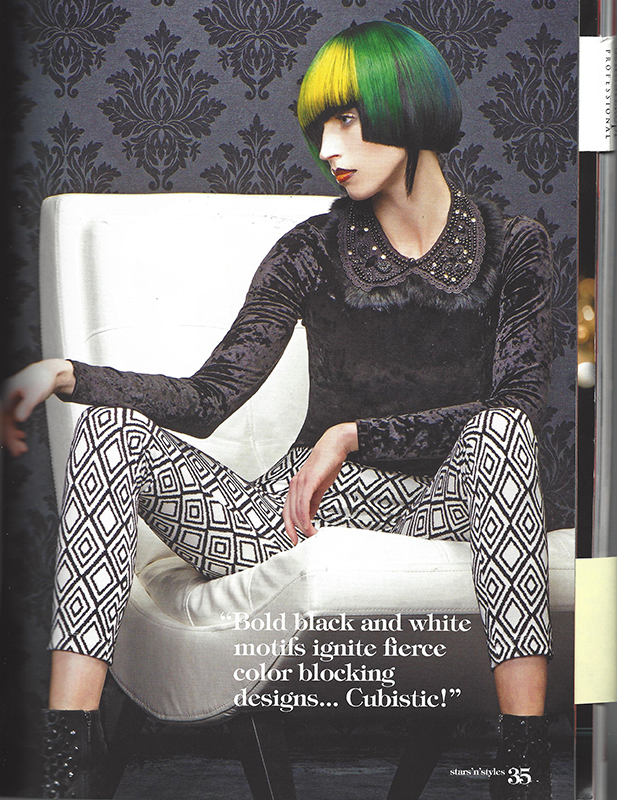 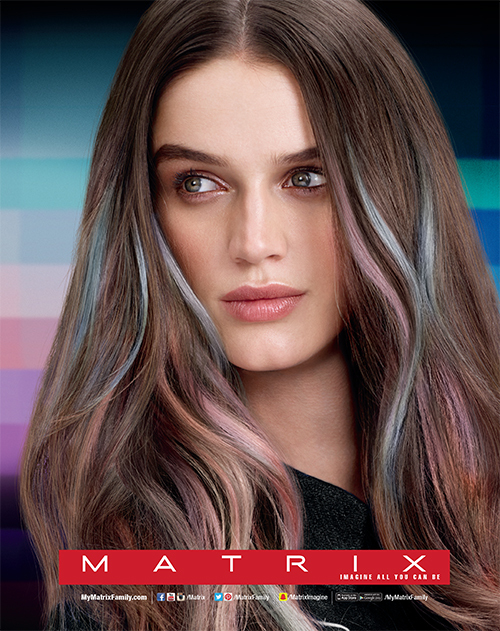 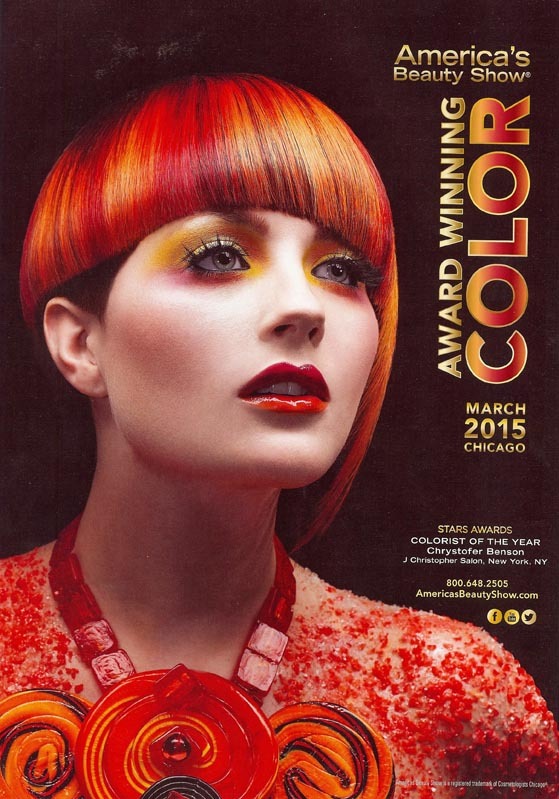 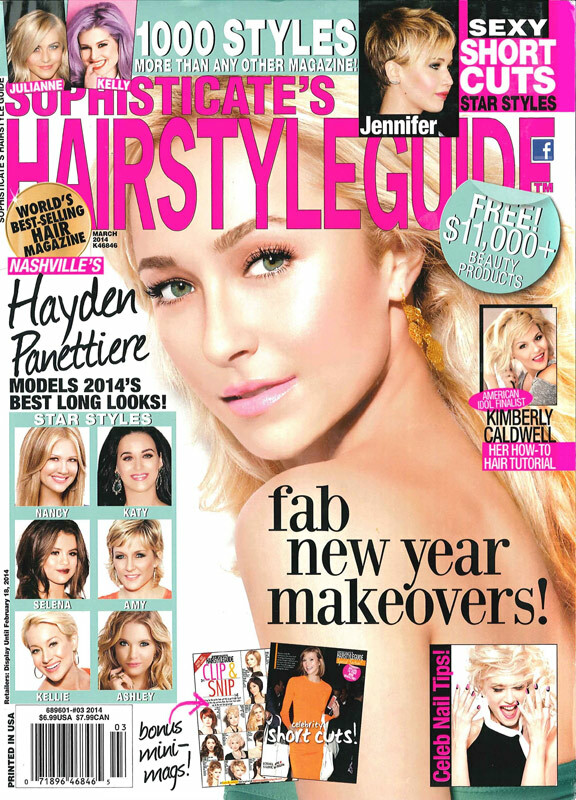 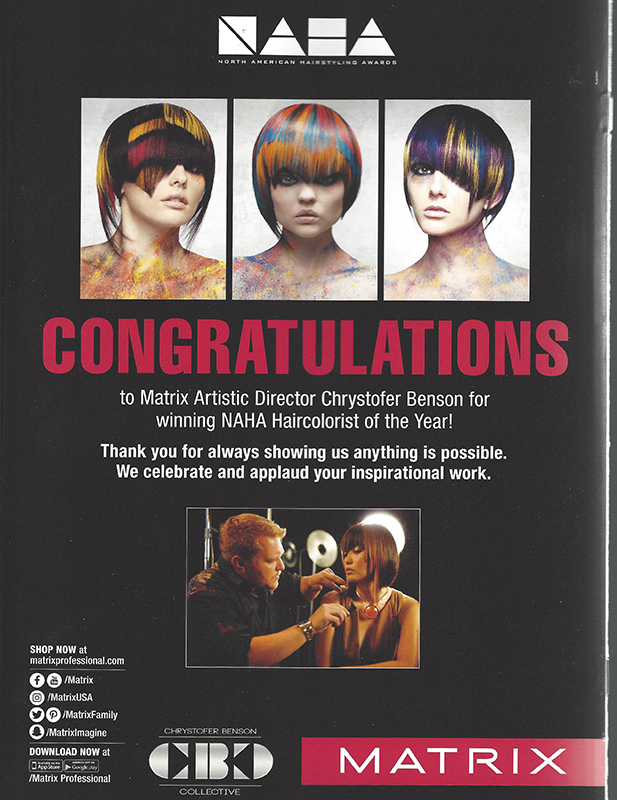 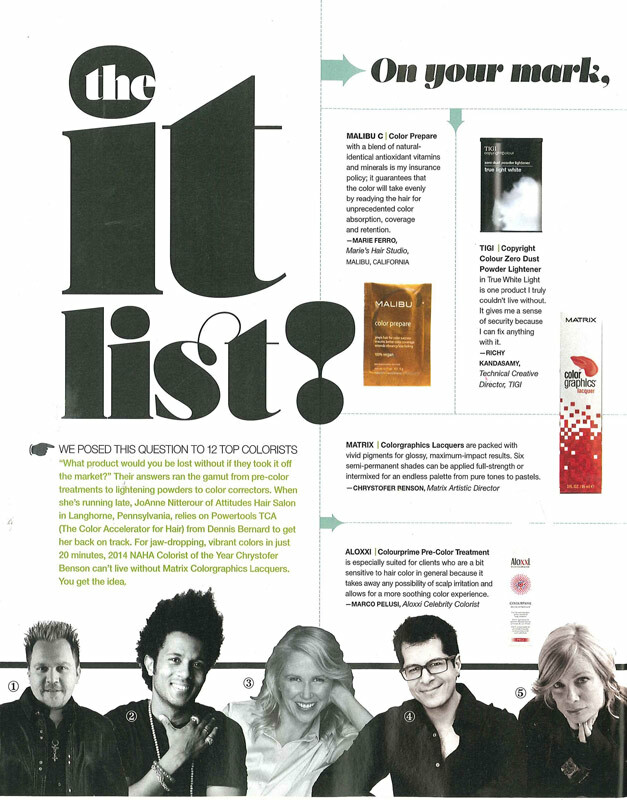 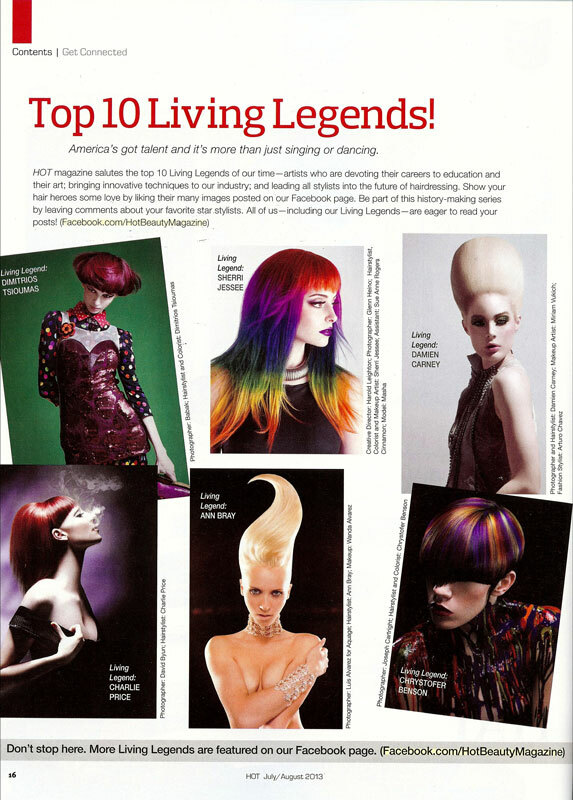 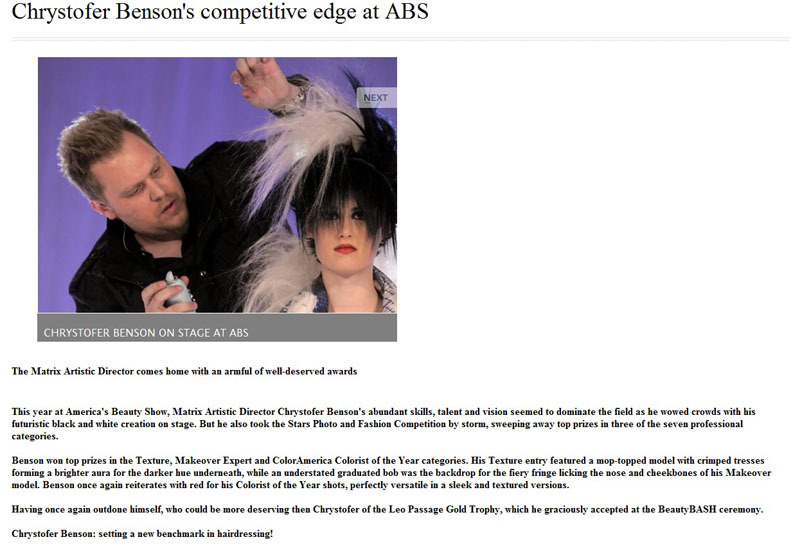 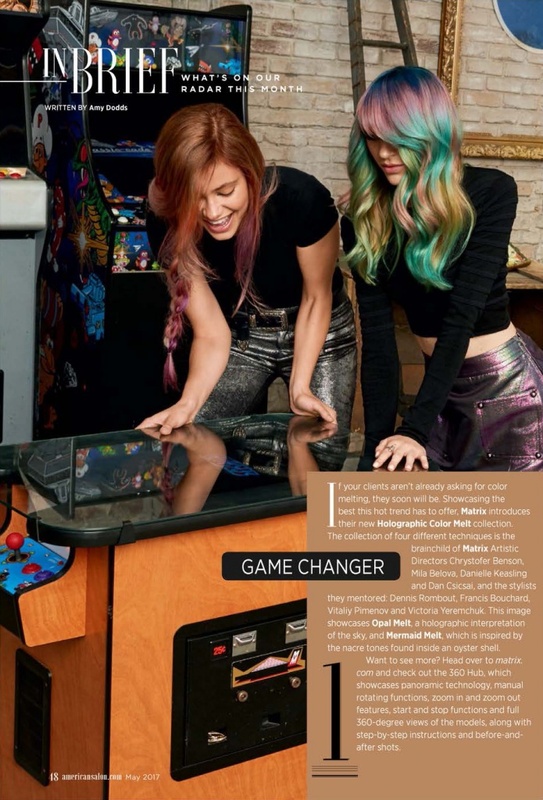 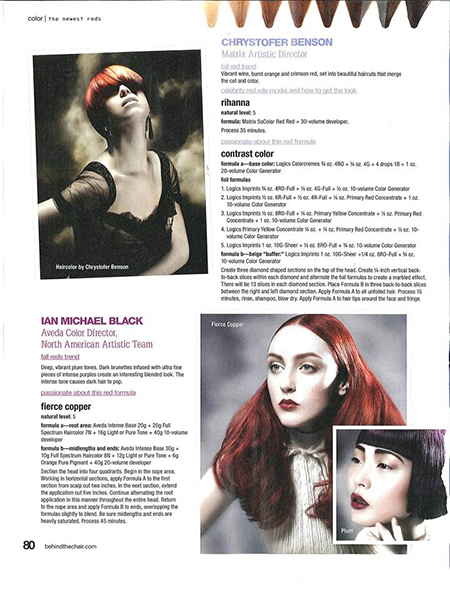 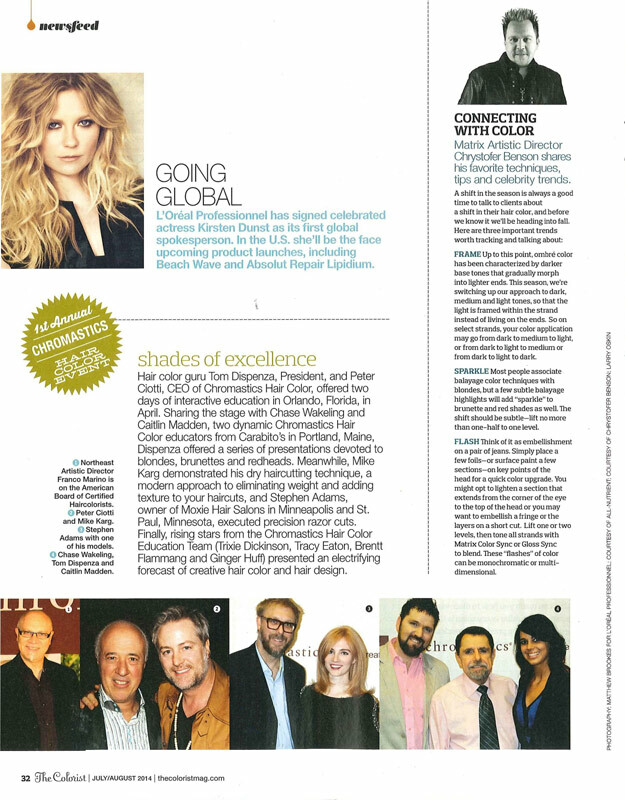 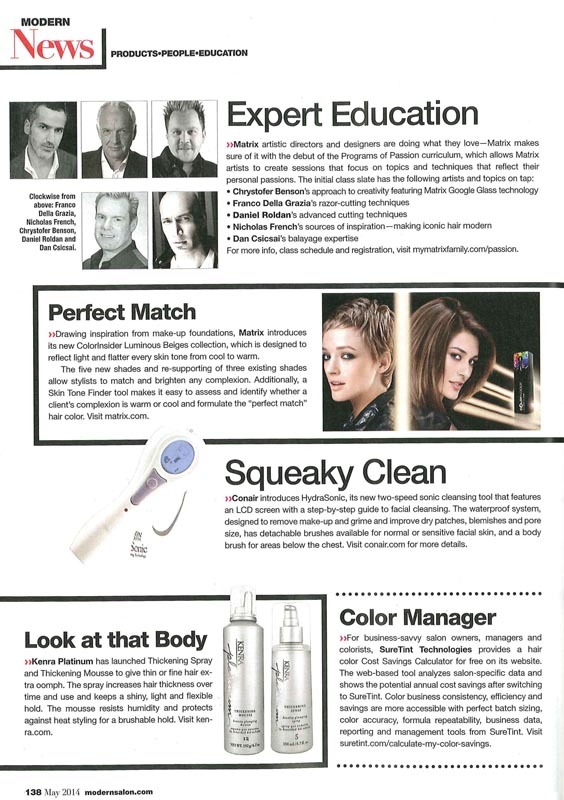 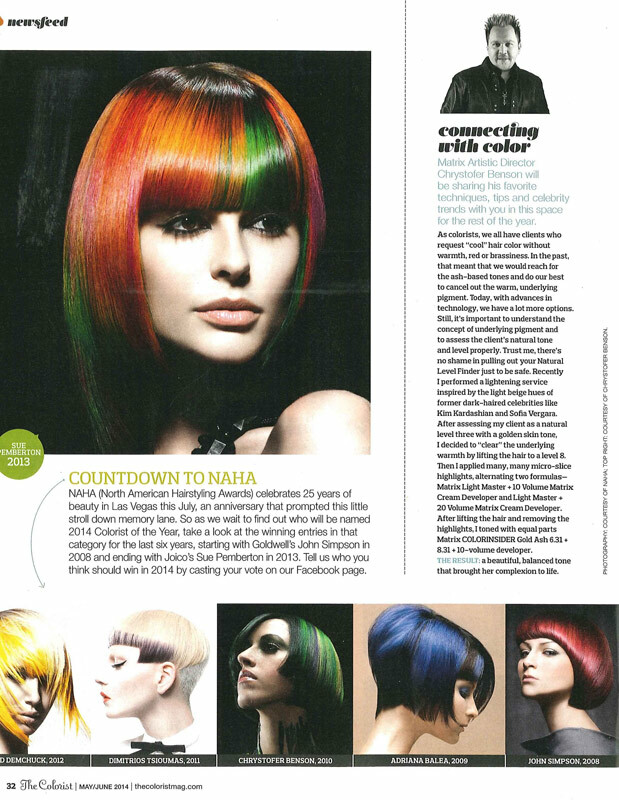 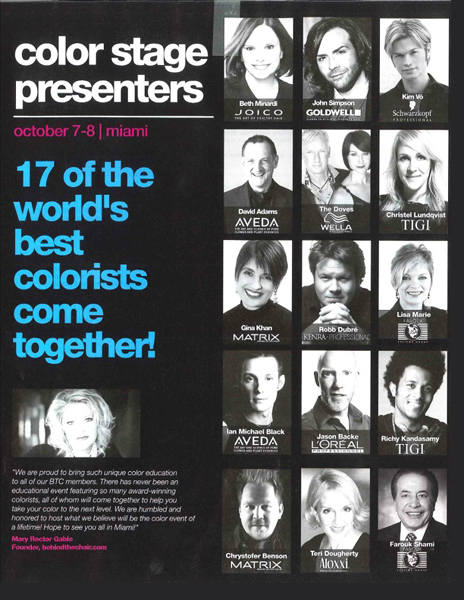 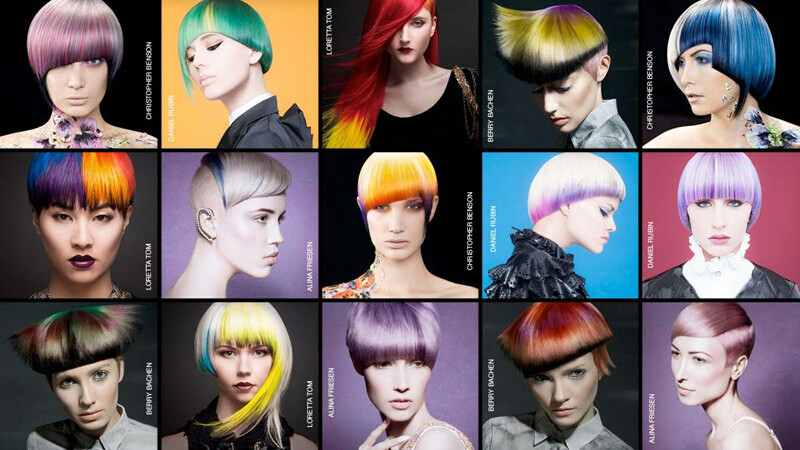 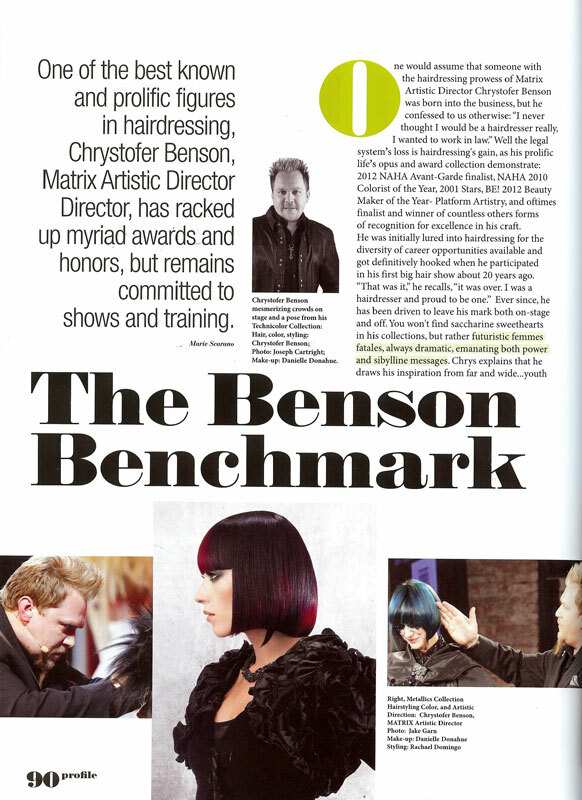 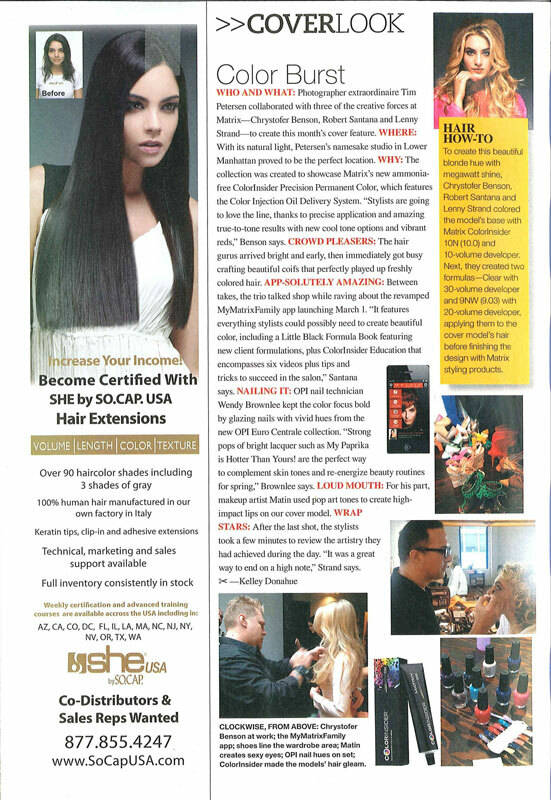 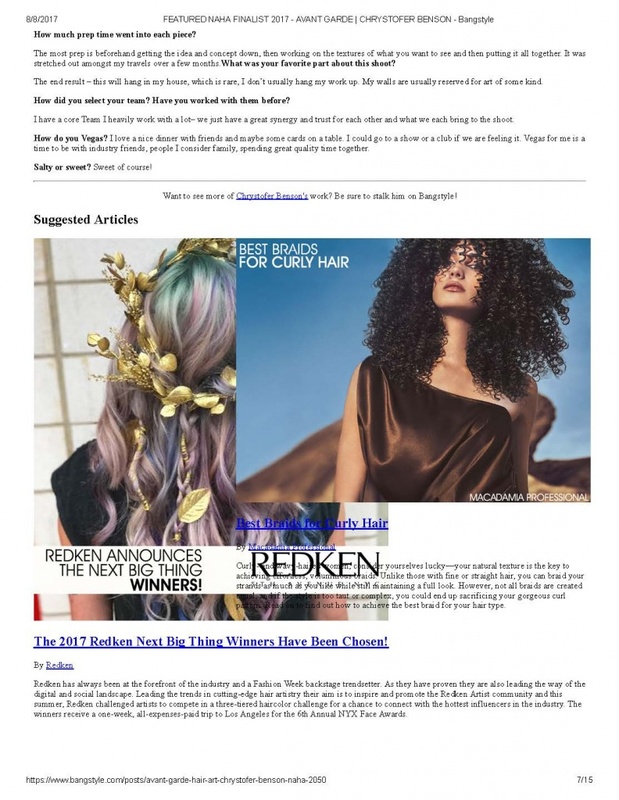 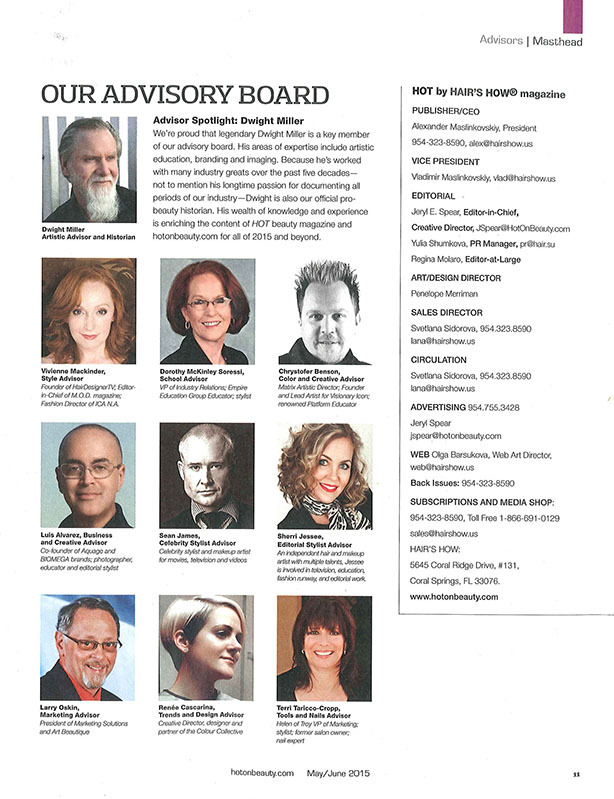 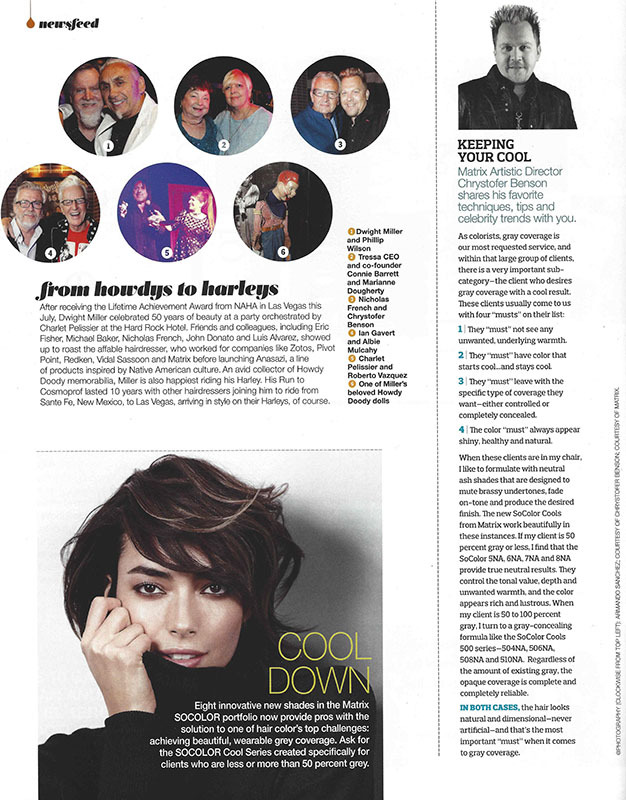 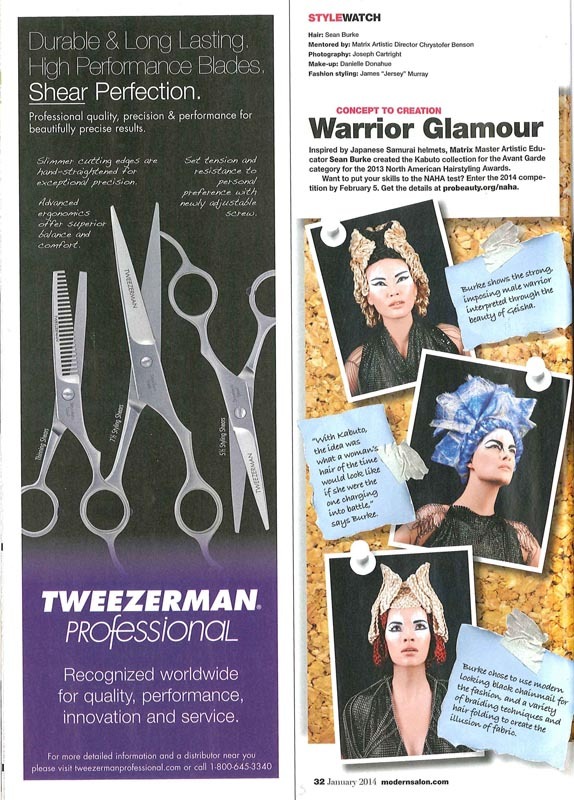 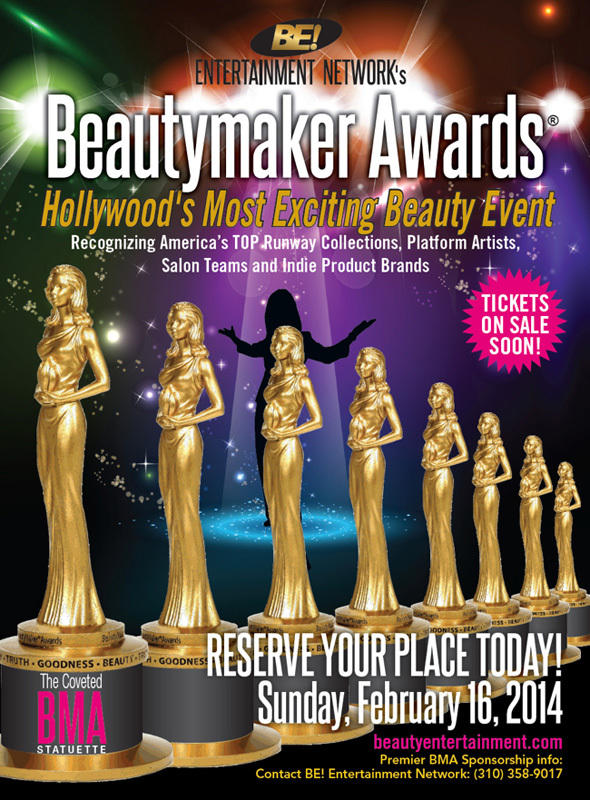 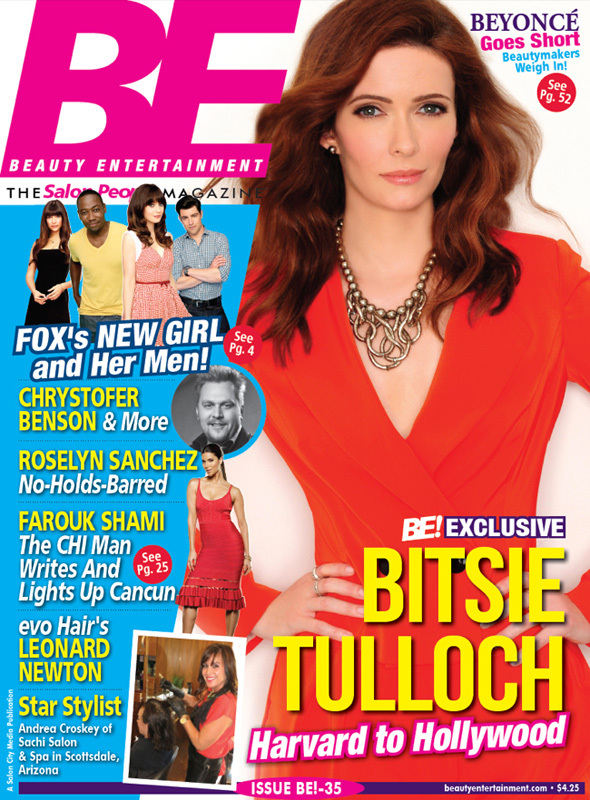 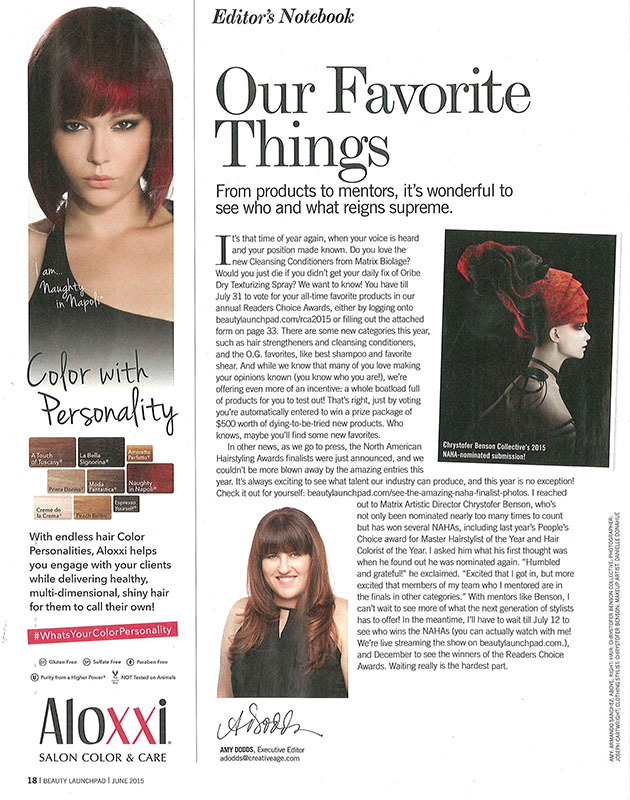 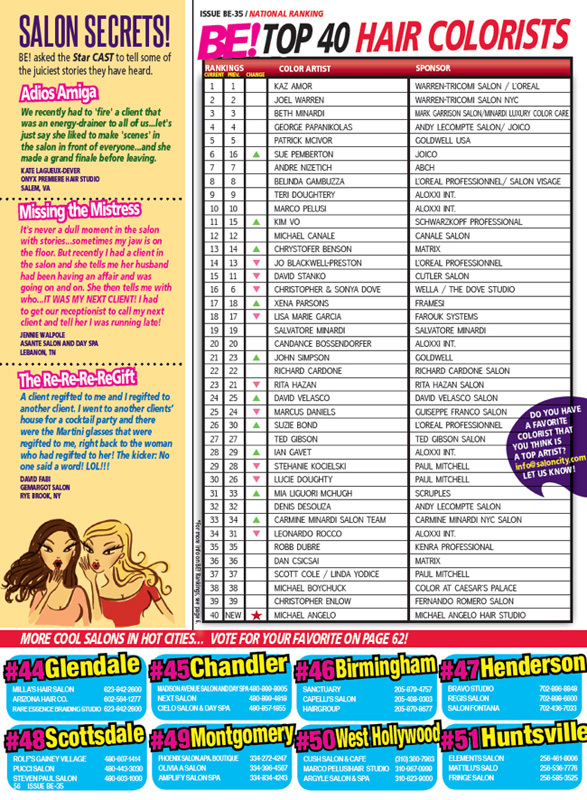 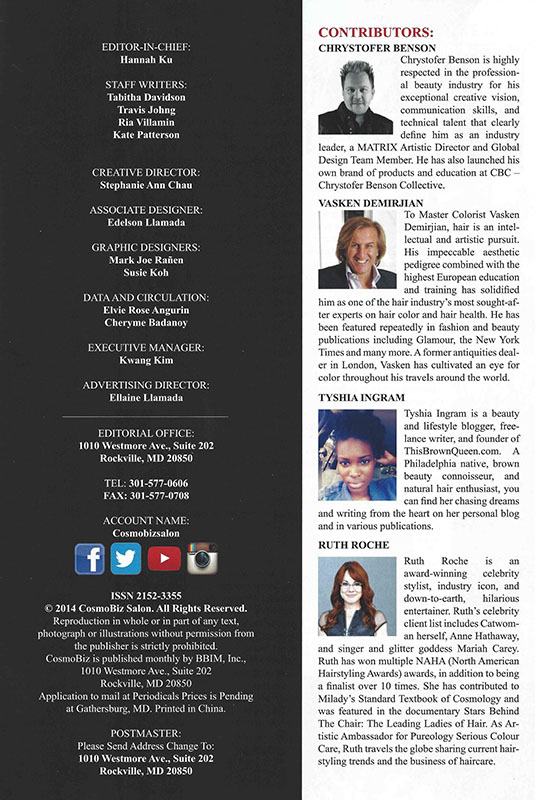 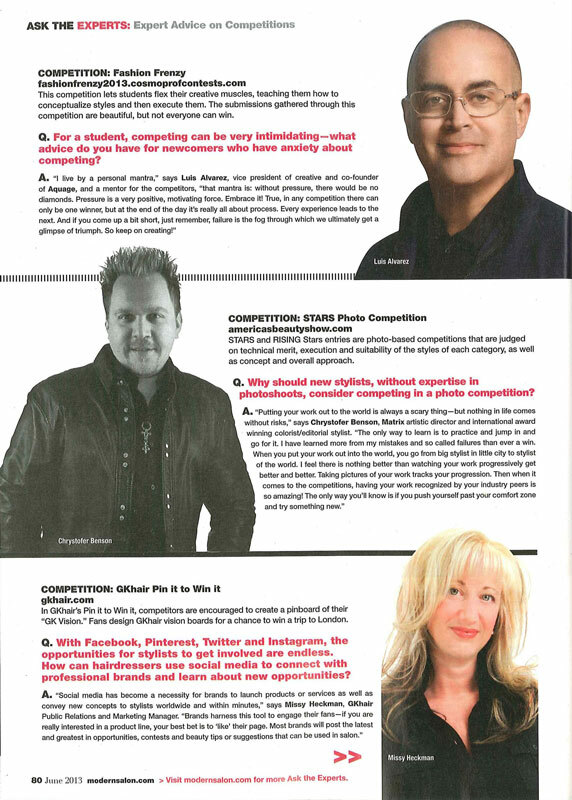 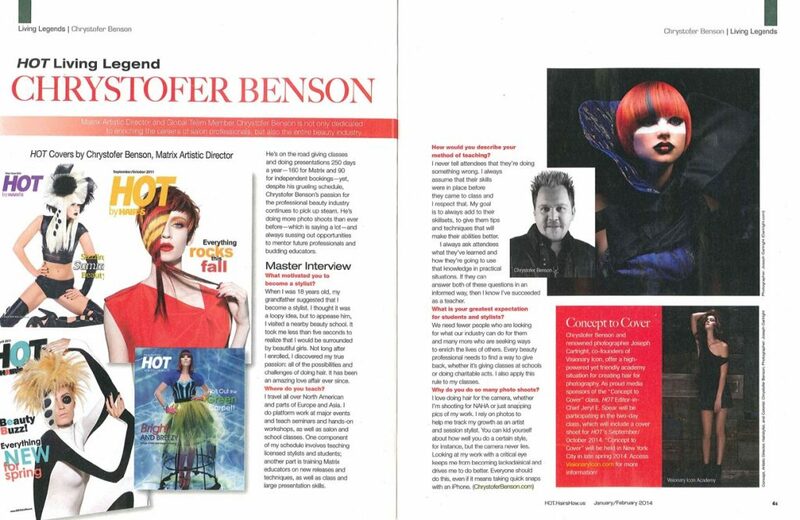 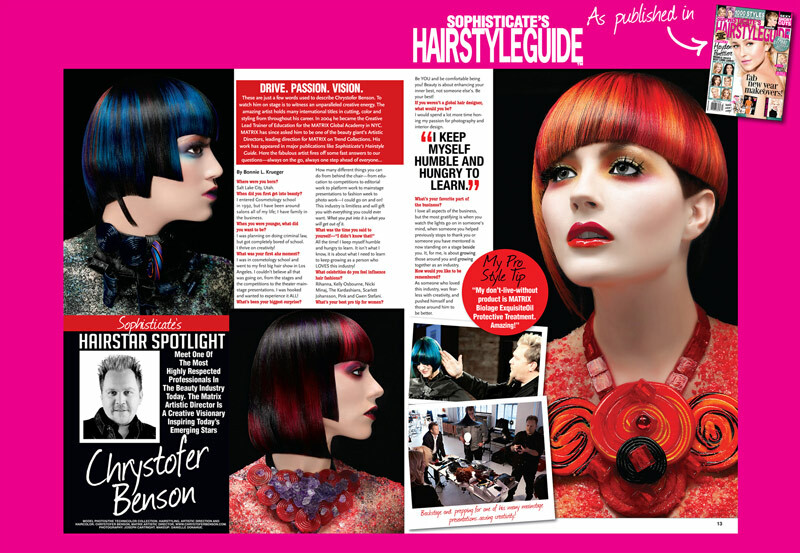 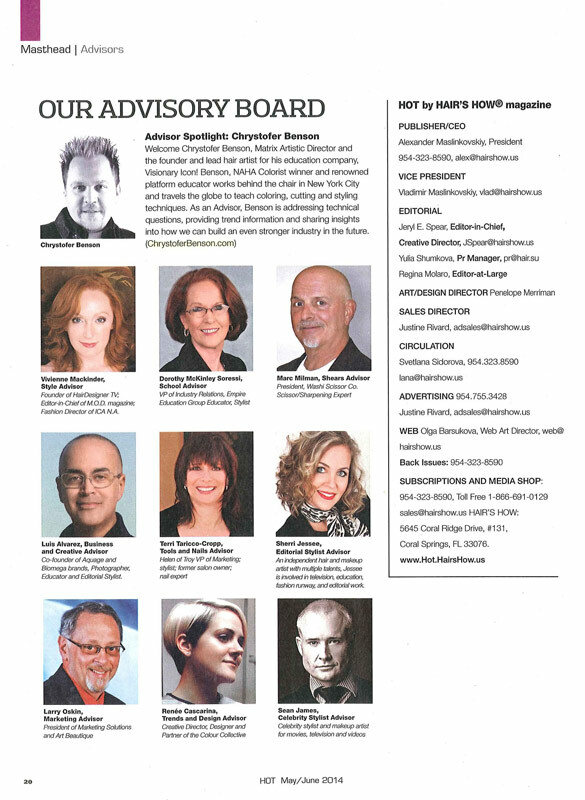 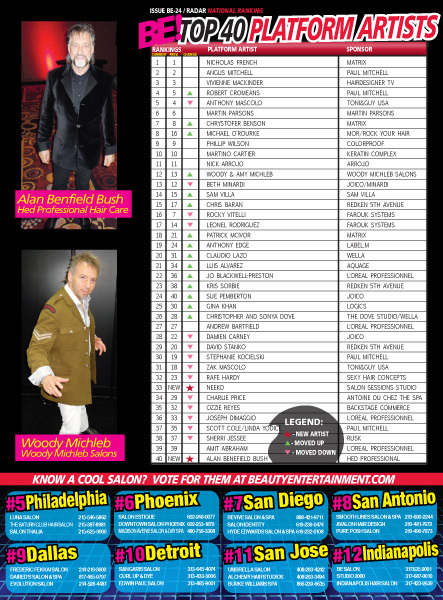 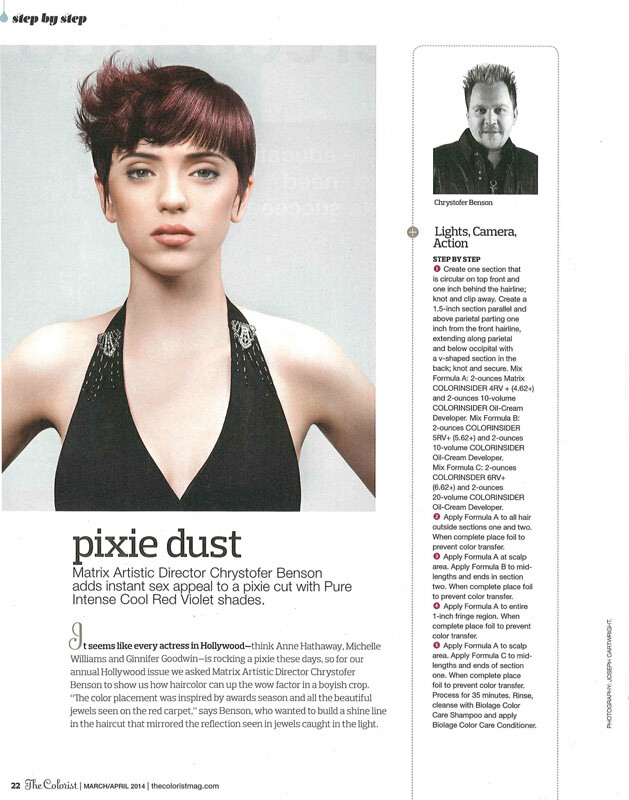 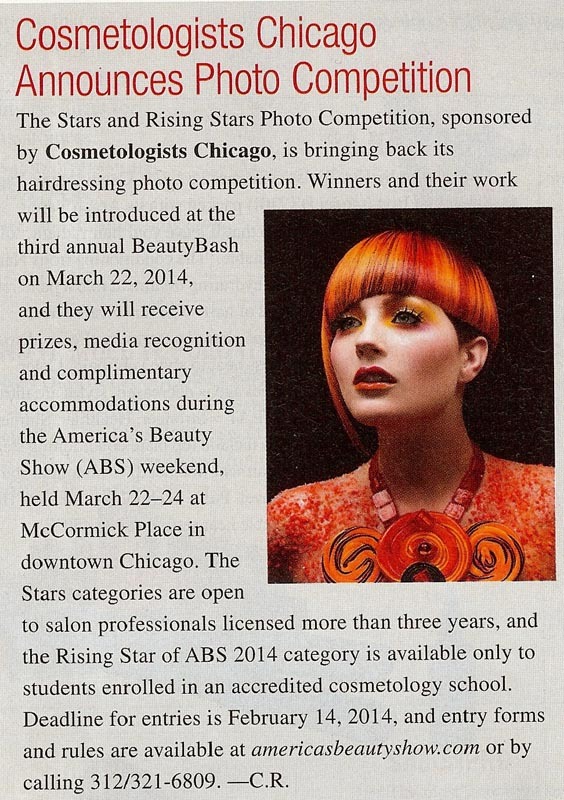 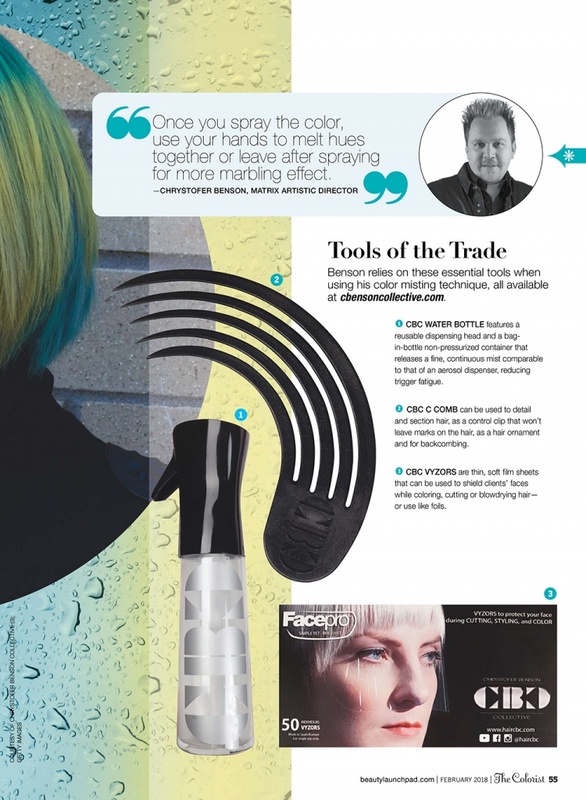 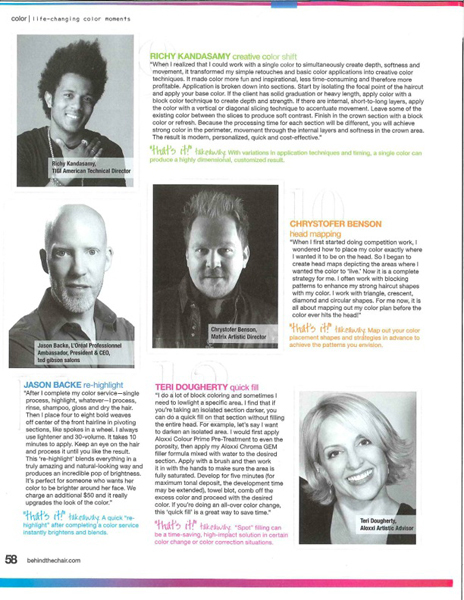 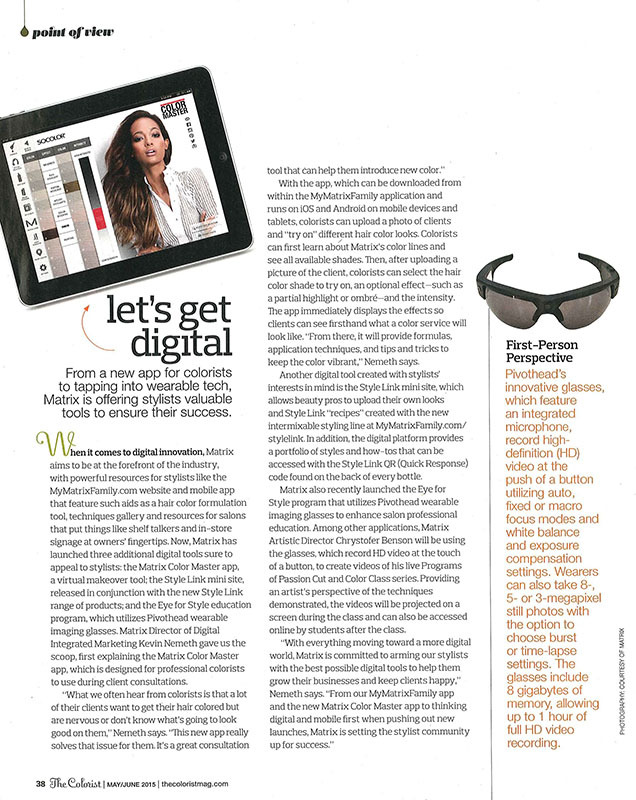 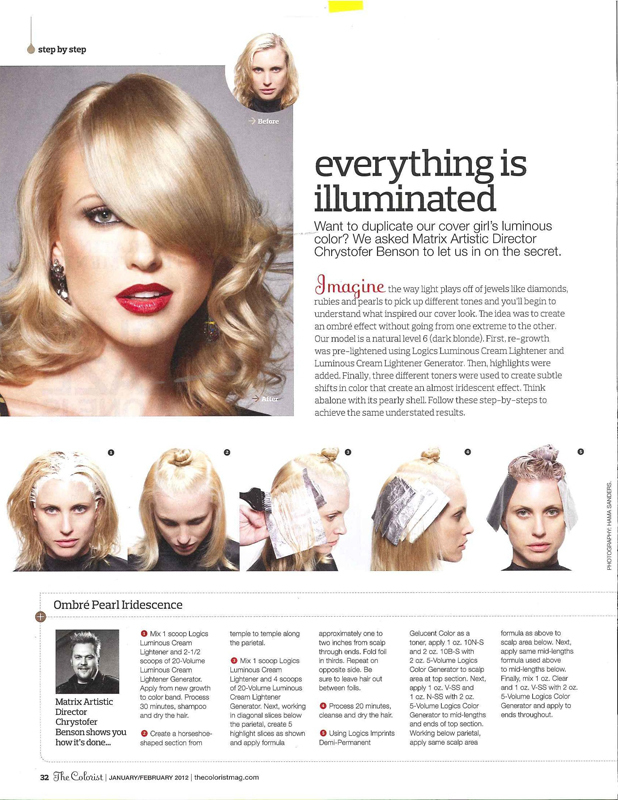 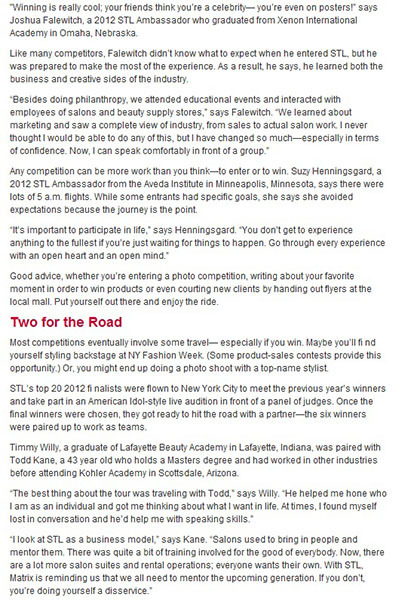 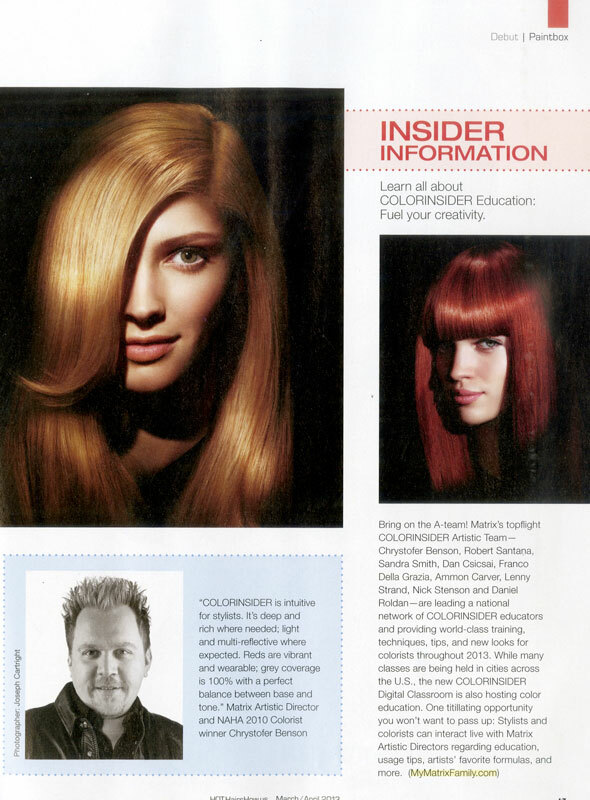 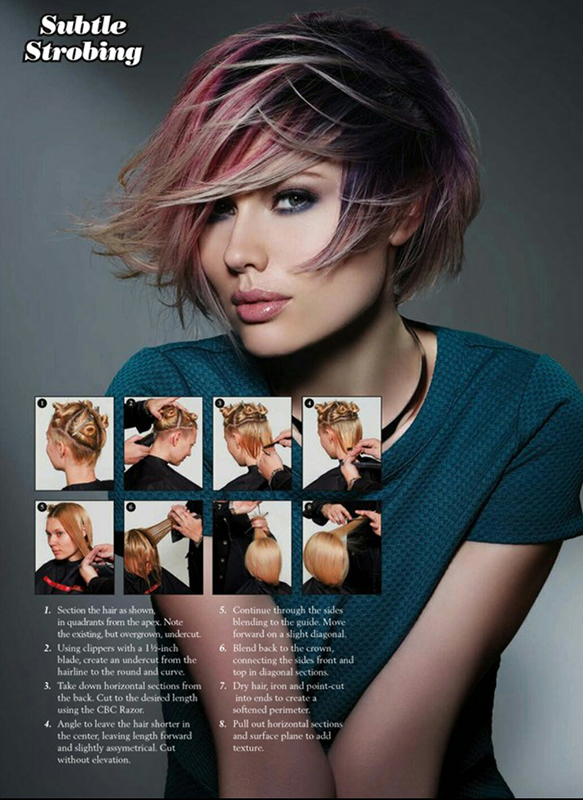 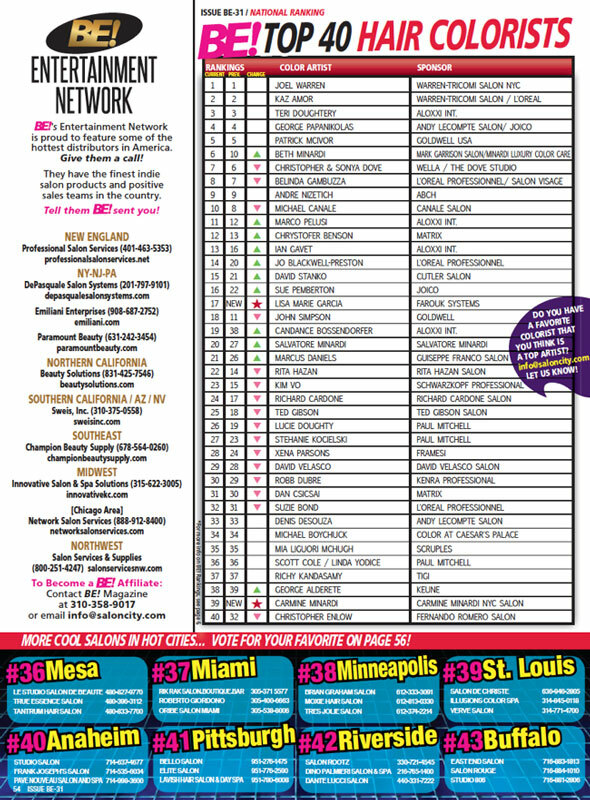 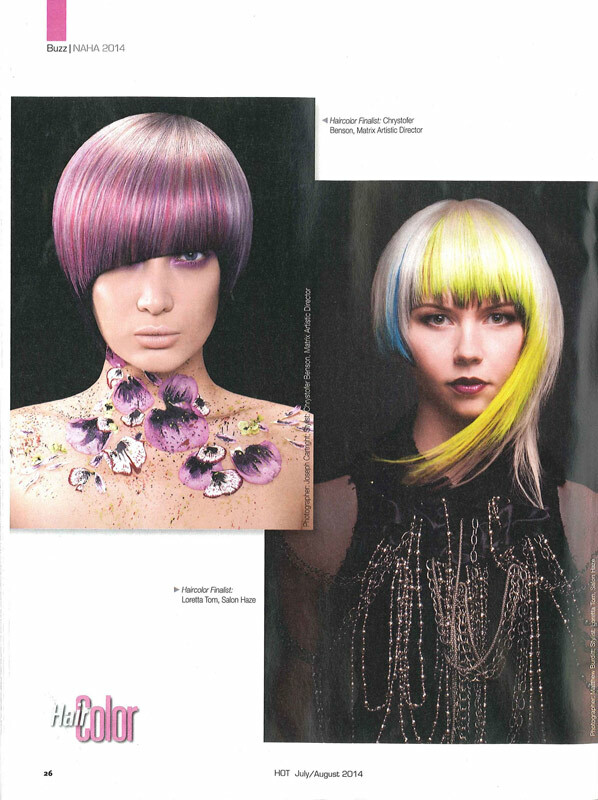 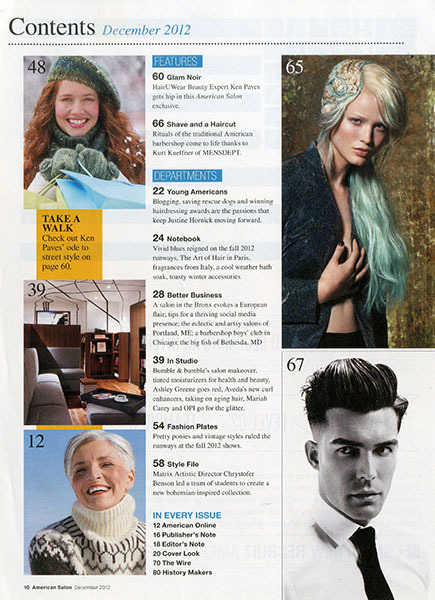 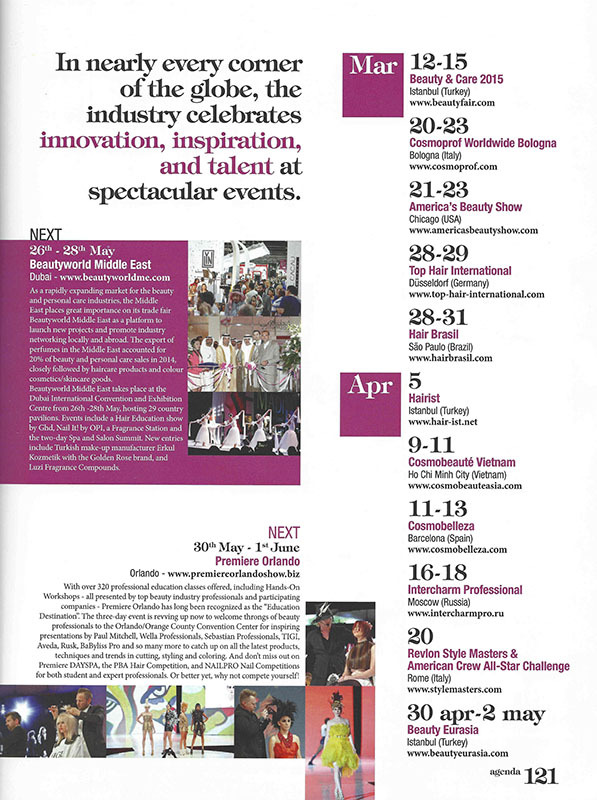 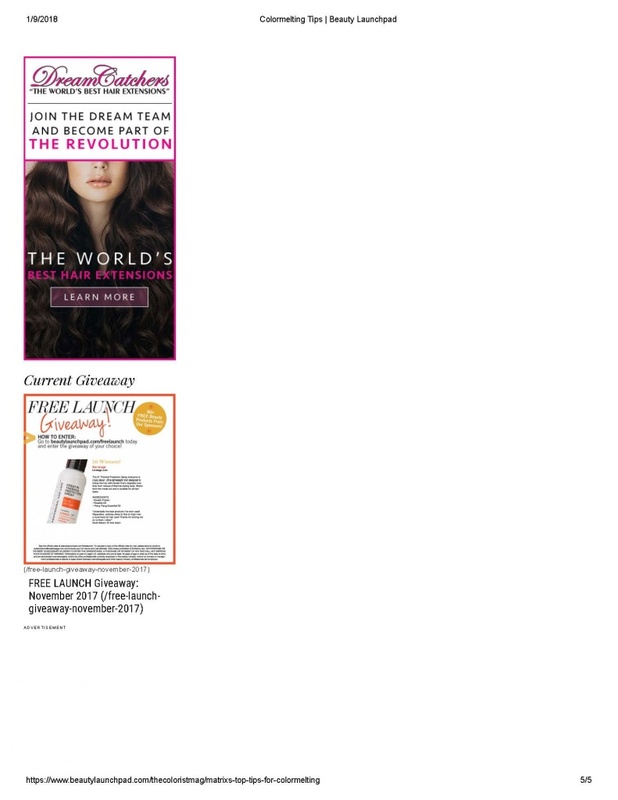 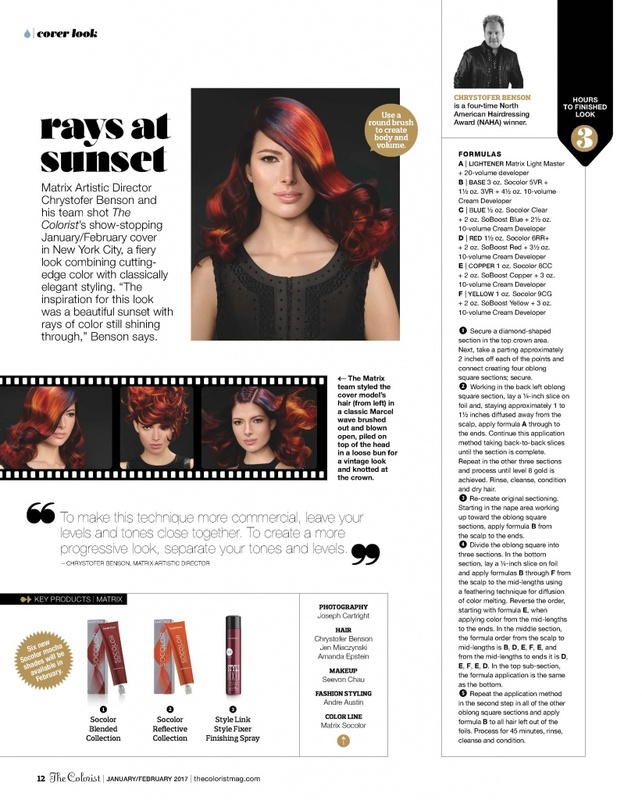 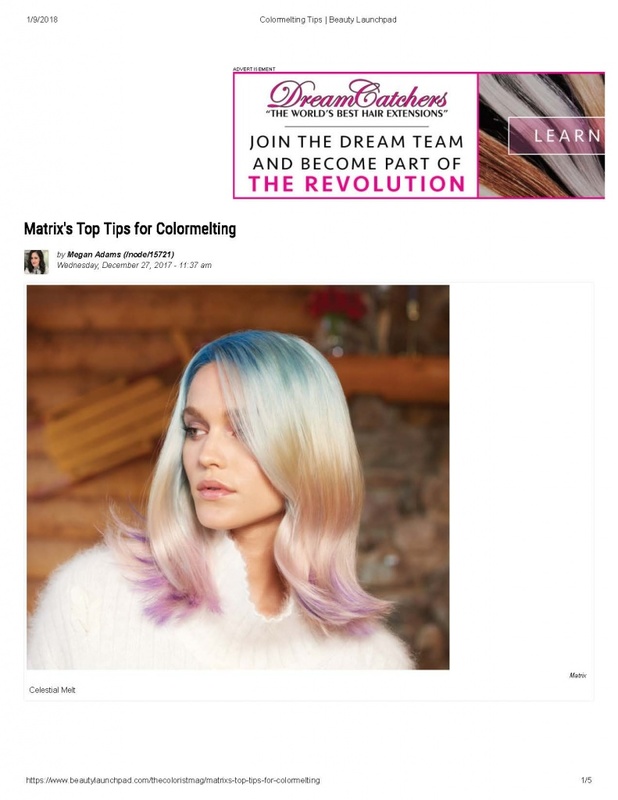 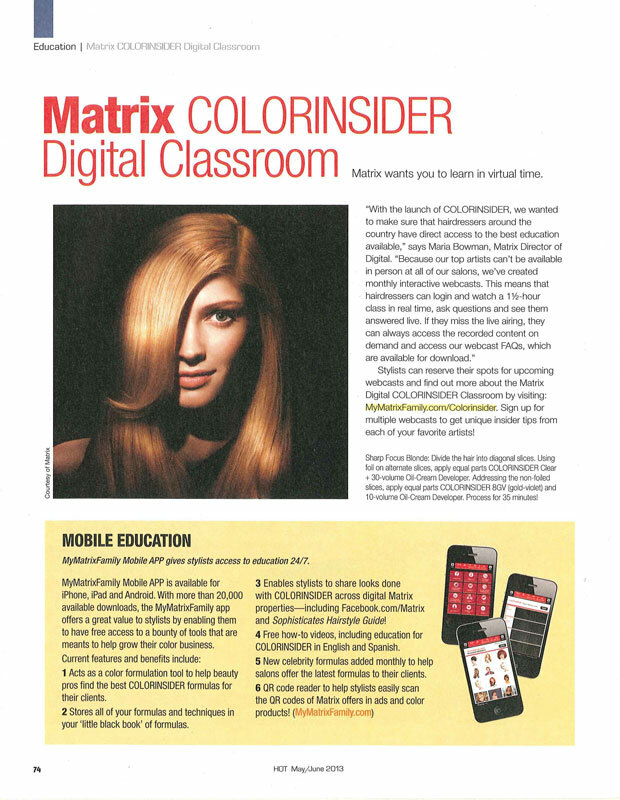 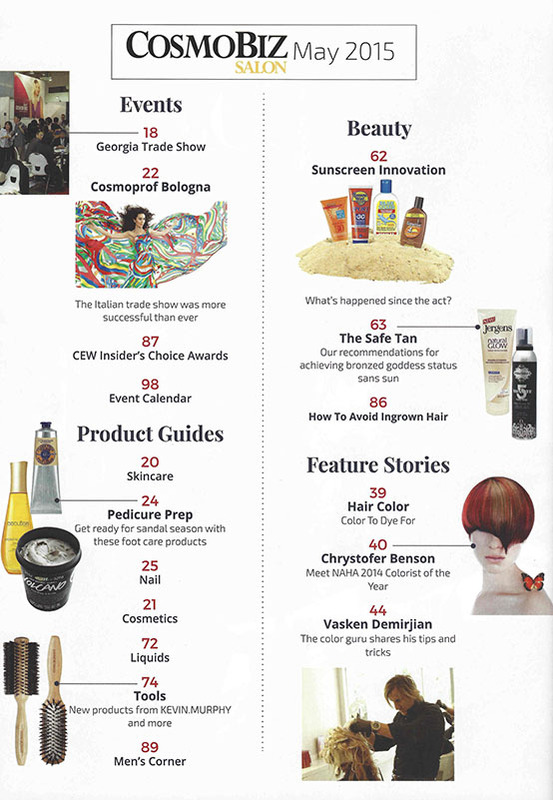 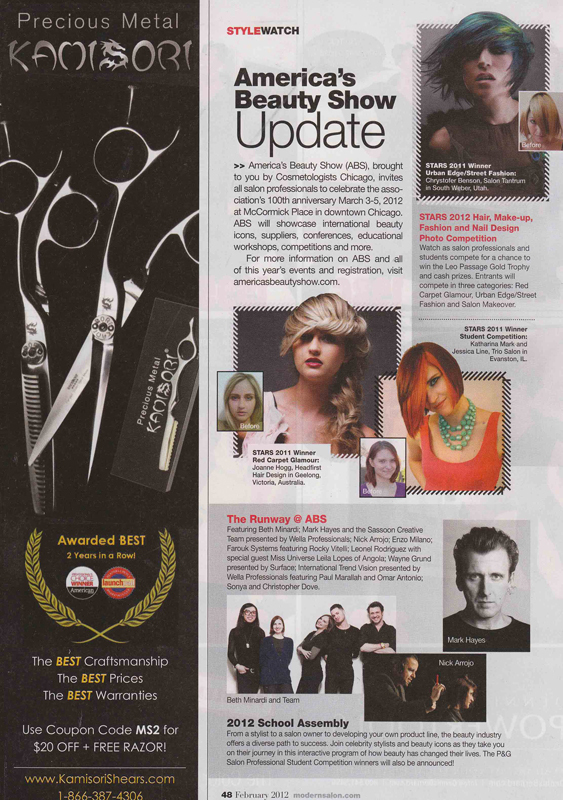 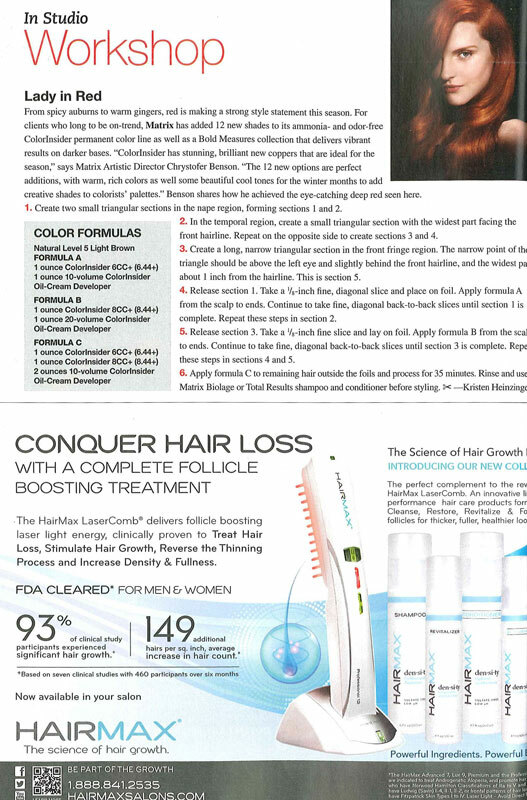 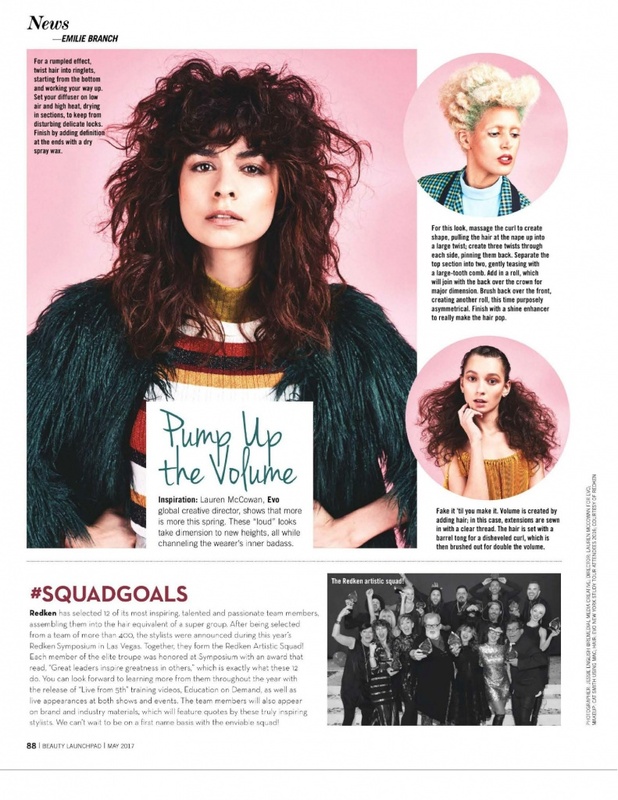 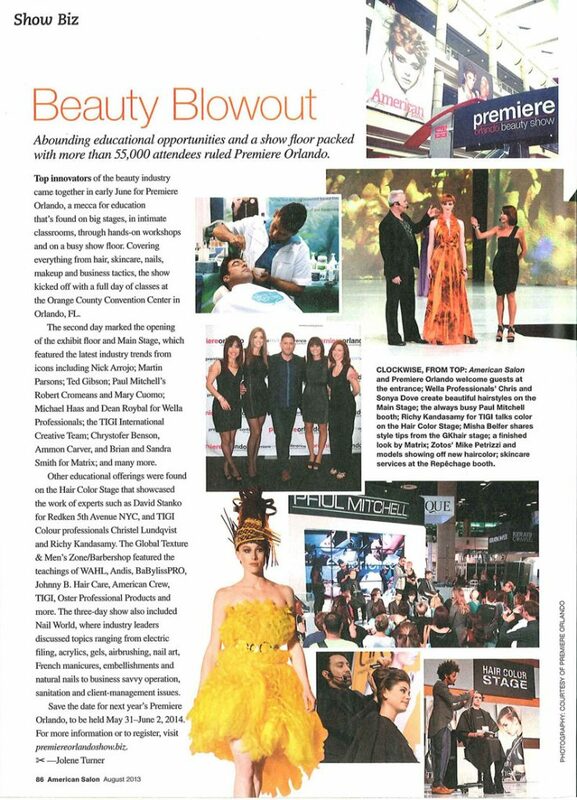 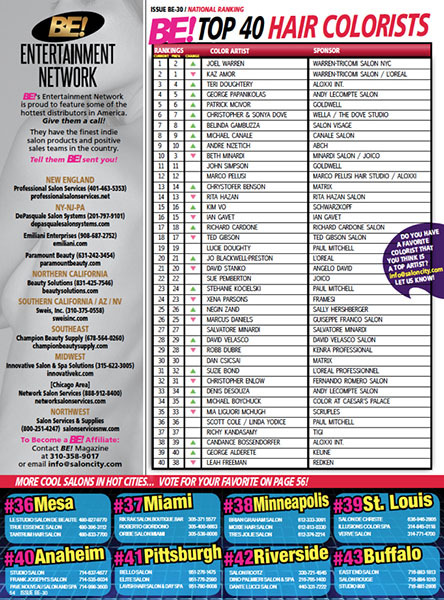 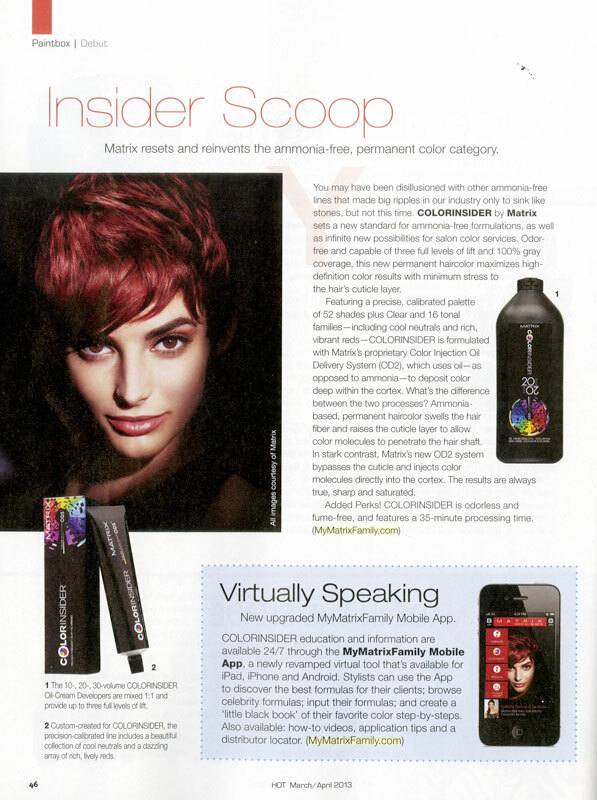 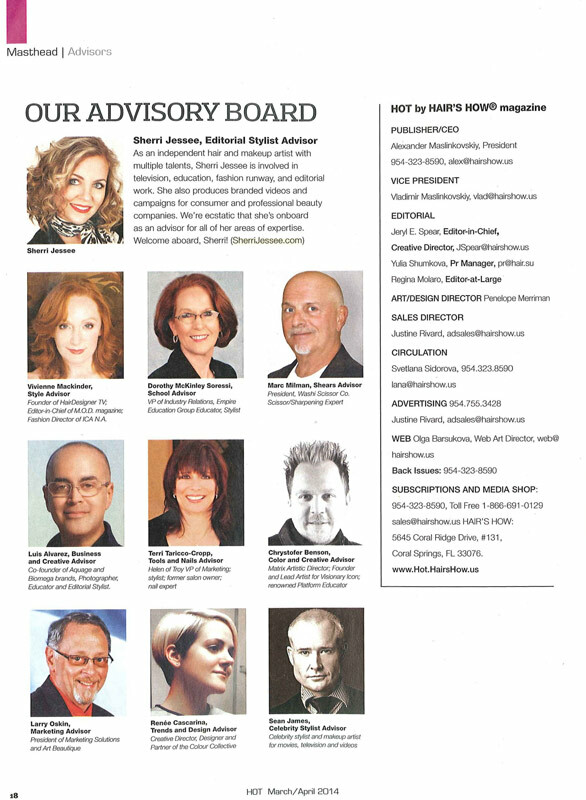 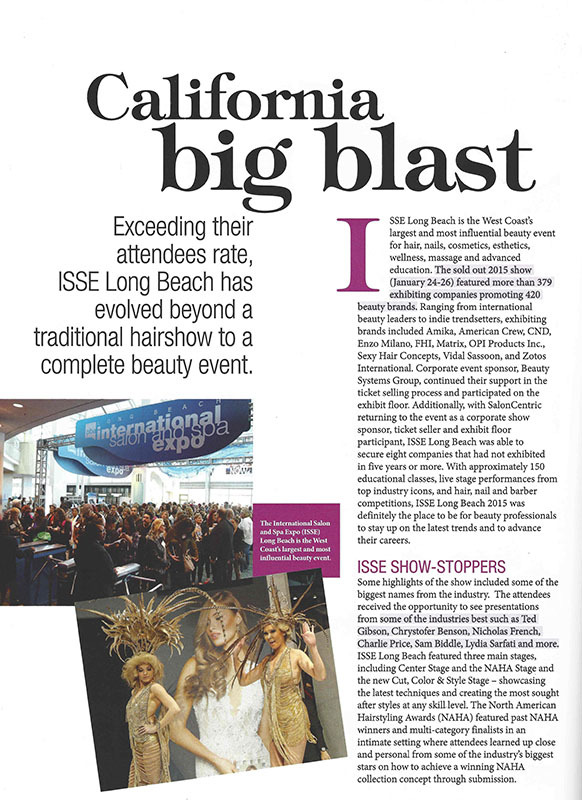 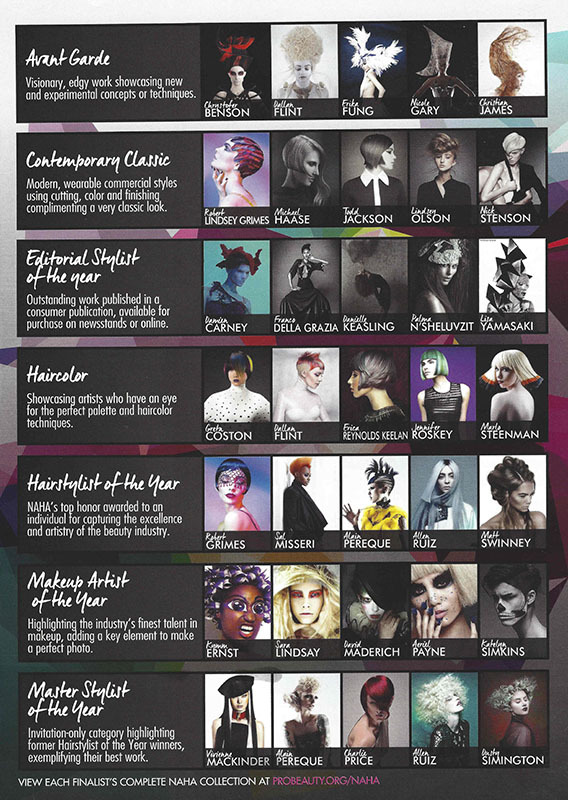 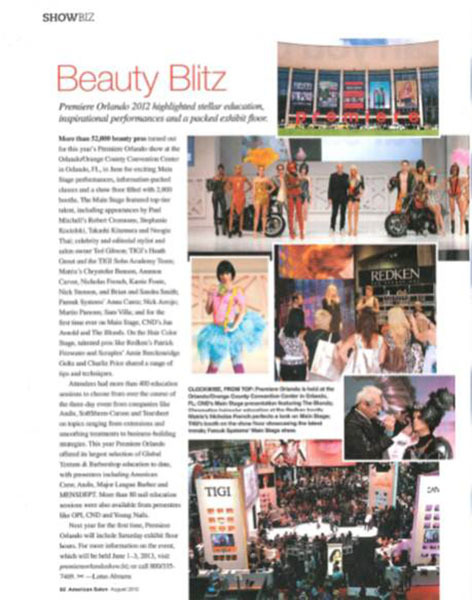 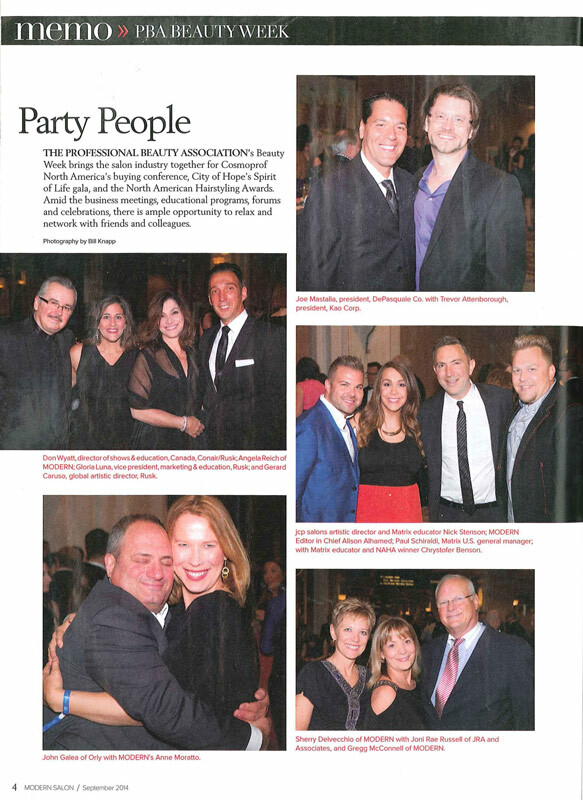 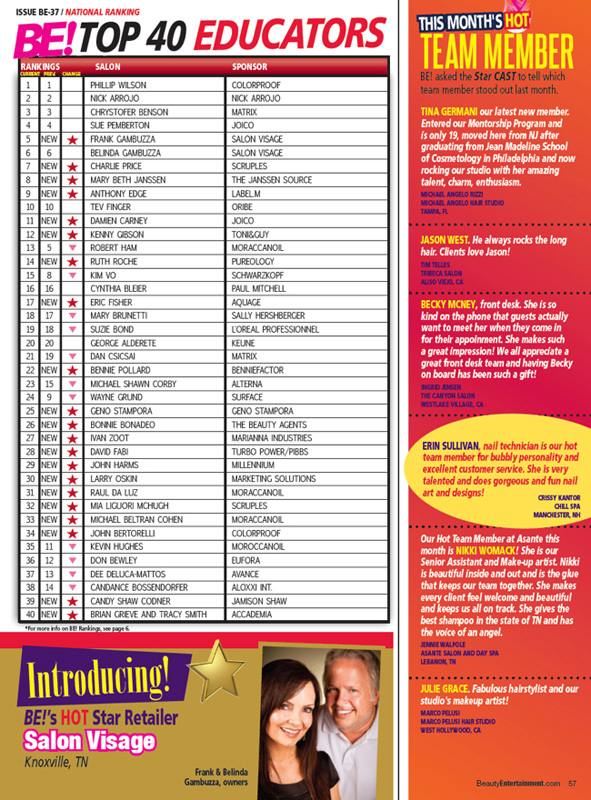 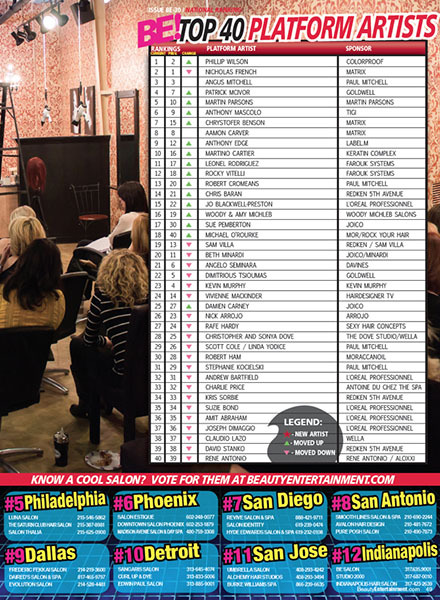 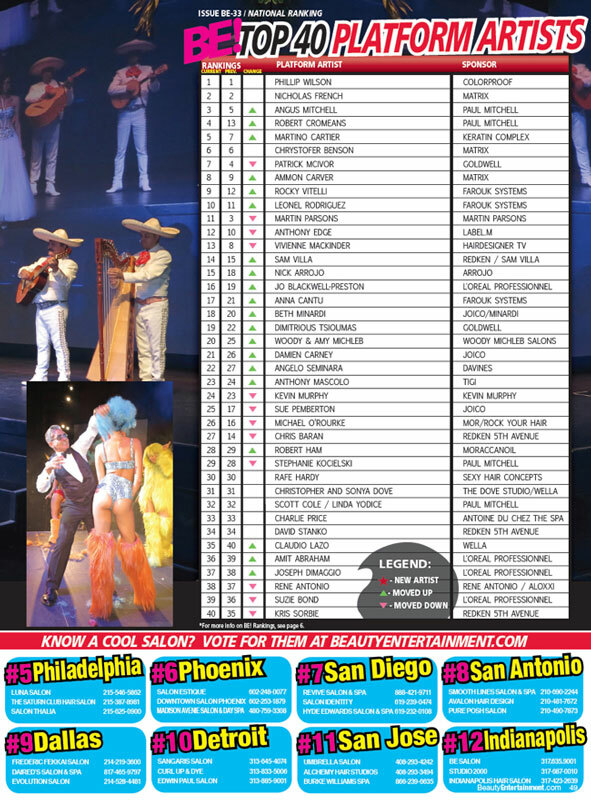 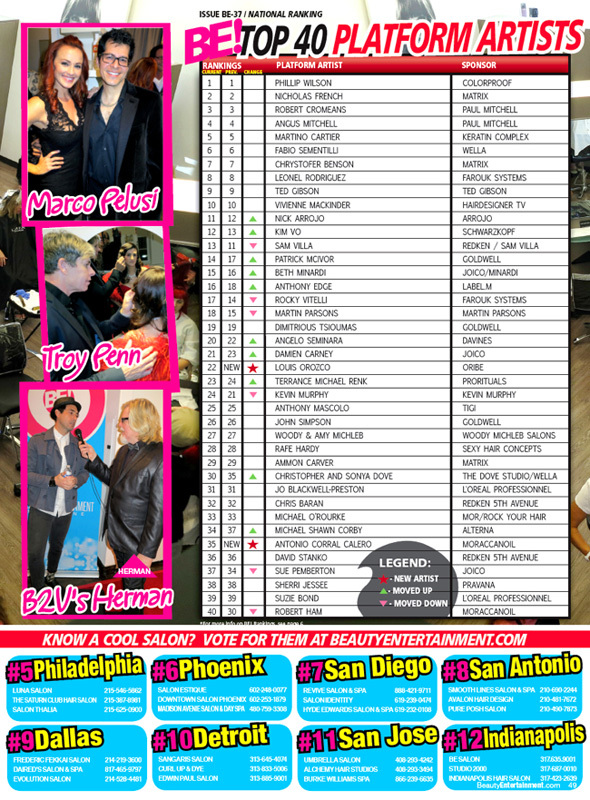 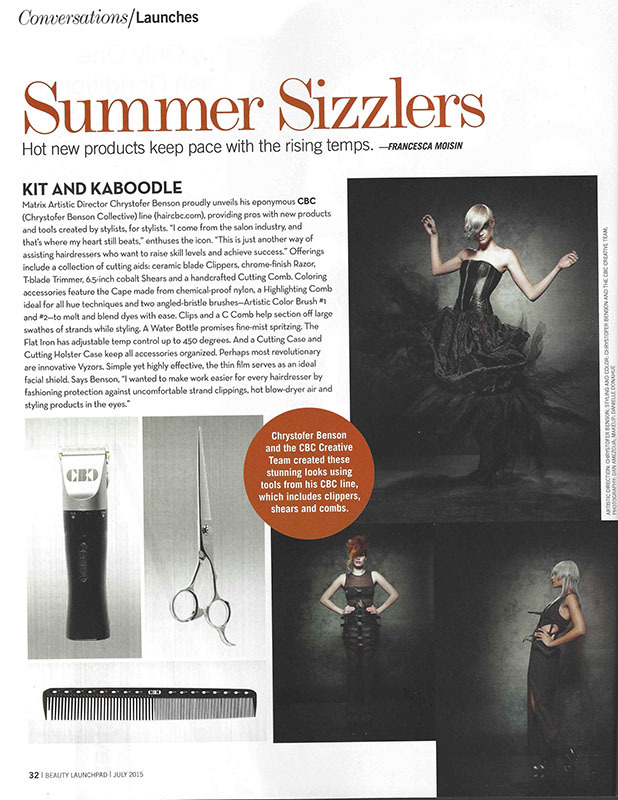 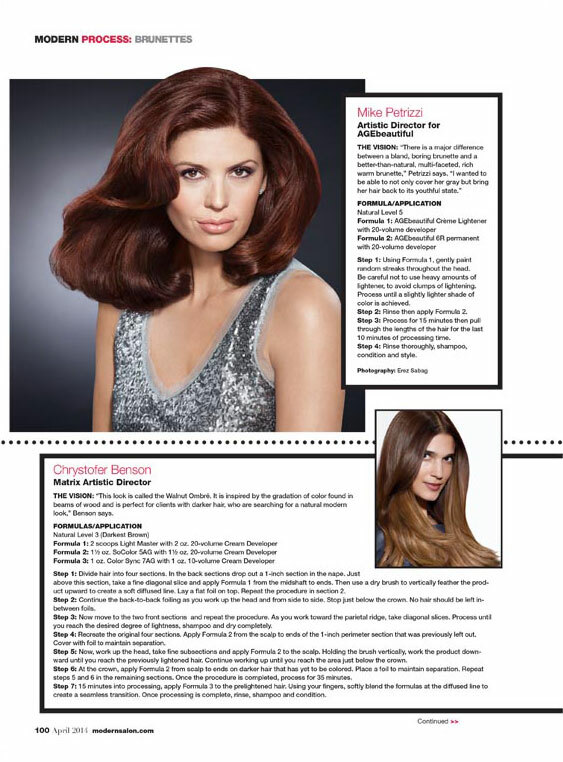 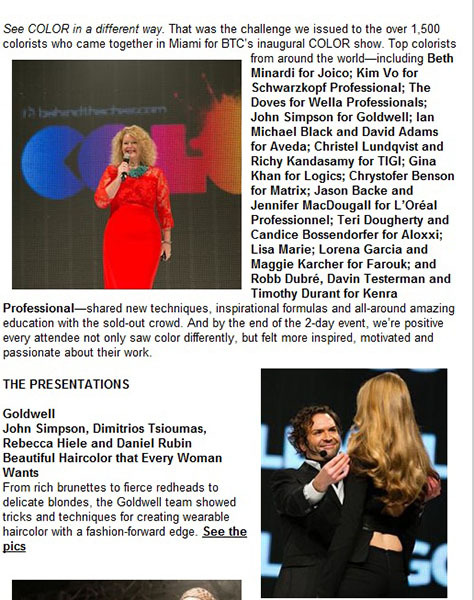 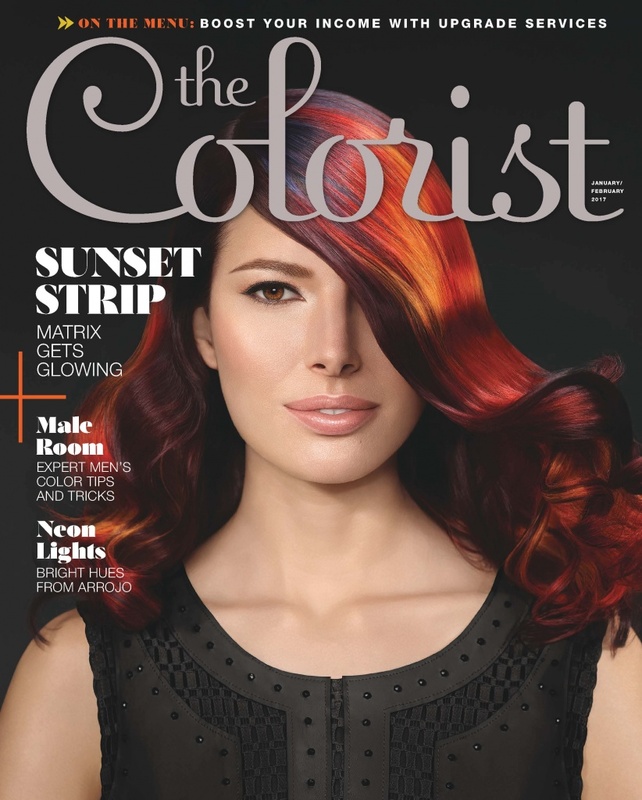 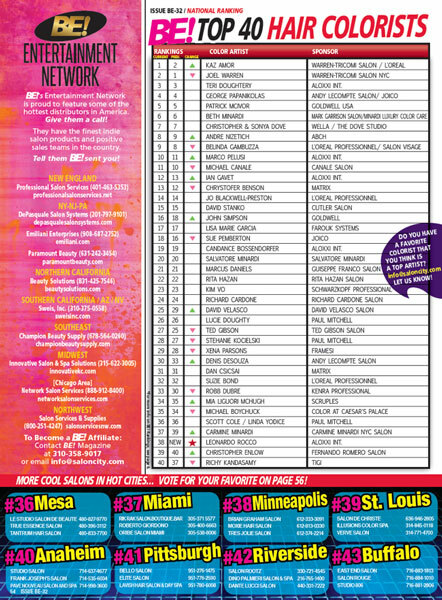 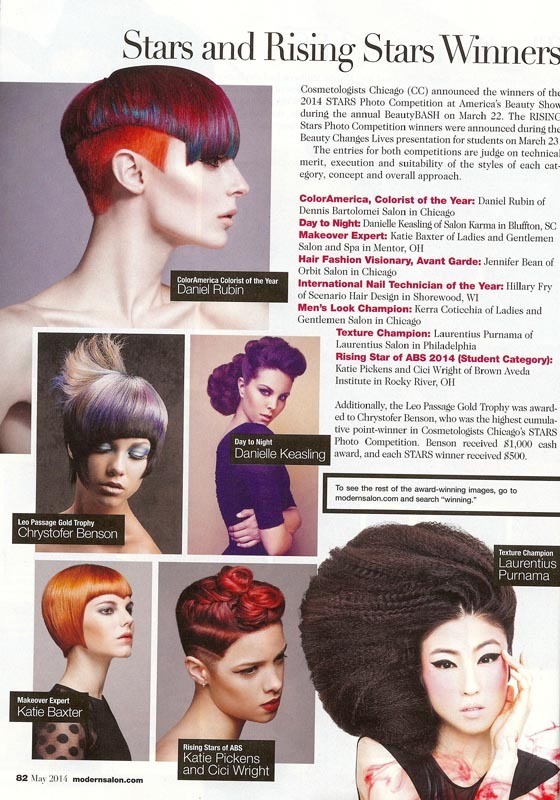 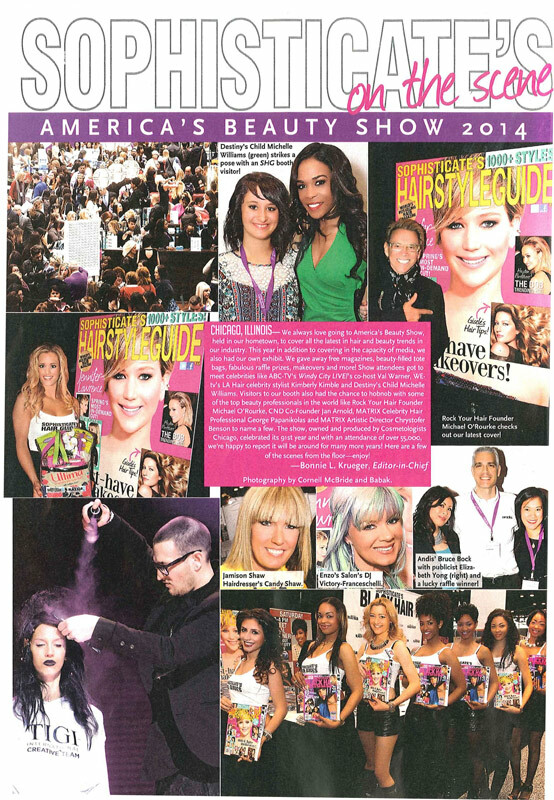 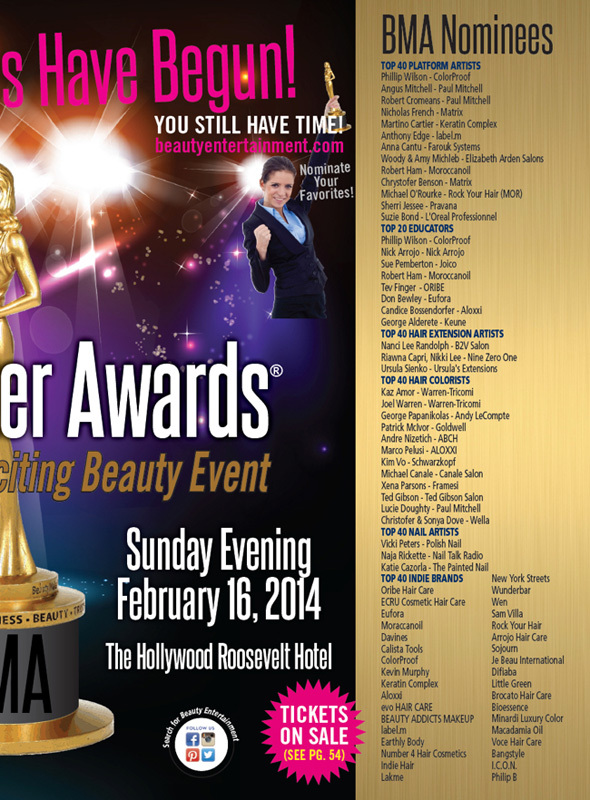 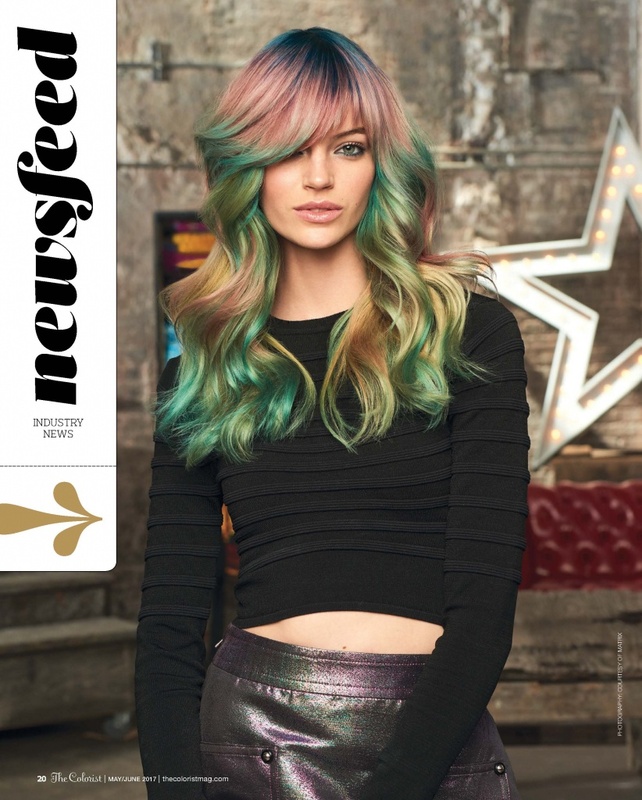 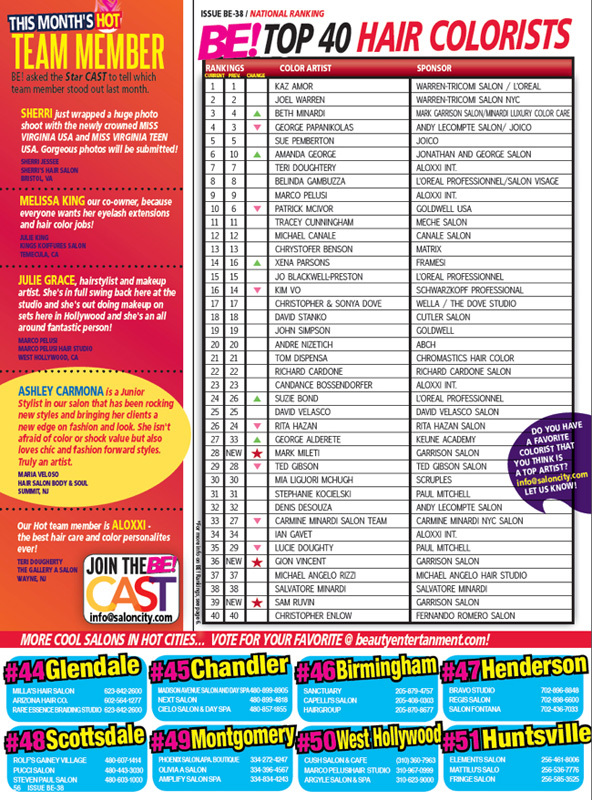 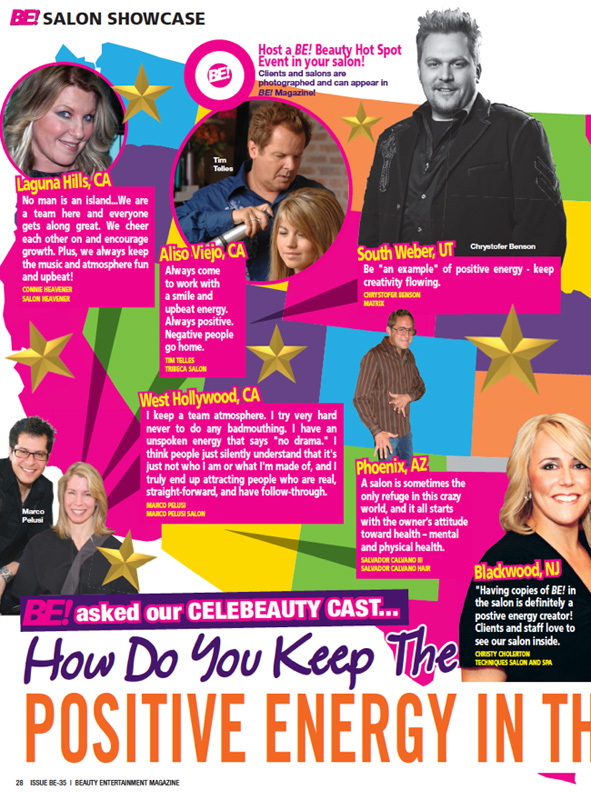 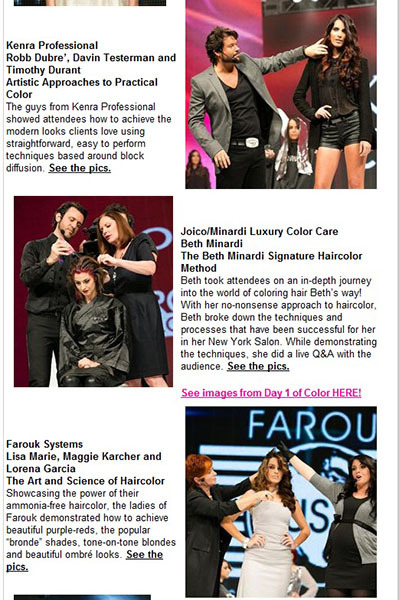 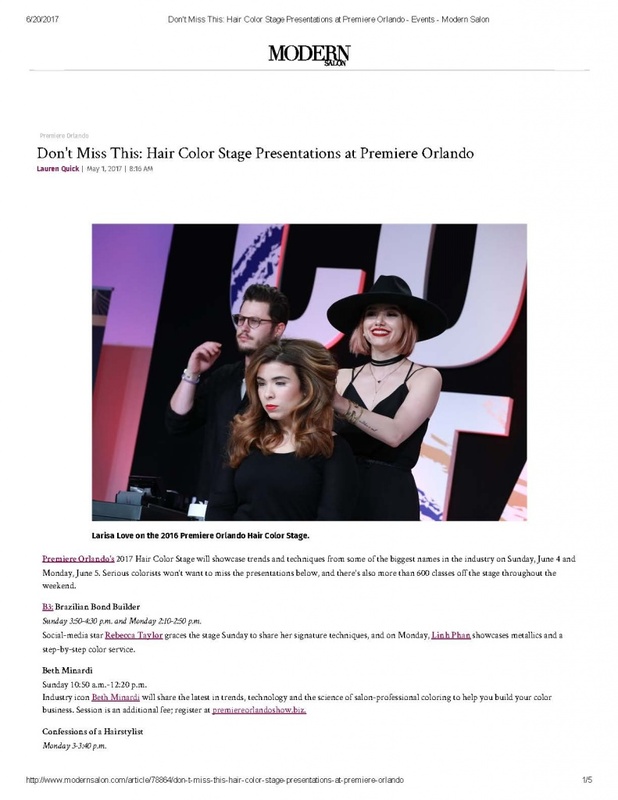 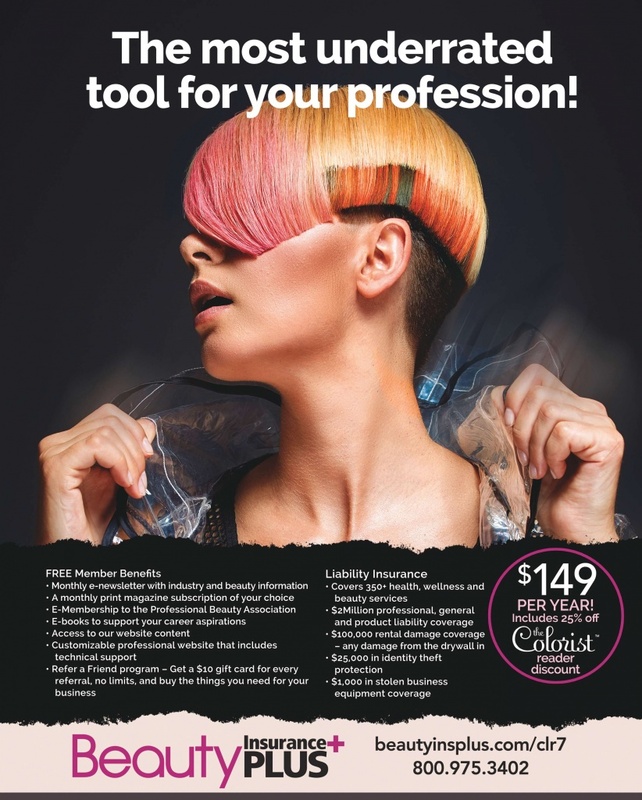 Benson won top prizes in the Texture, Makeover Expert, and ColorAmerica Colorist of the Year categories. 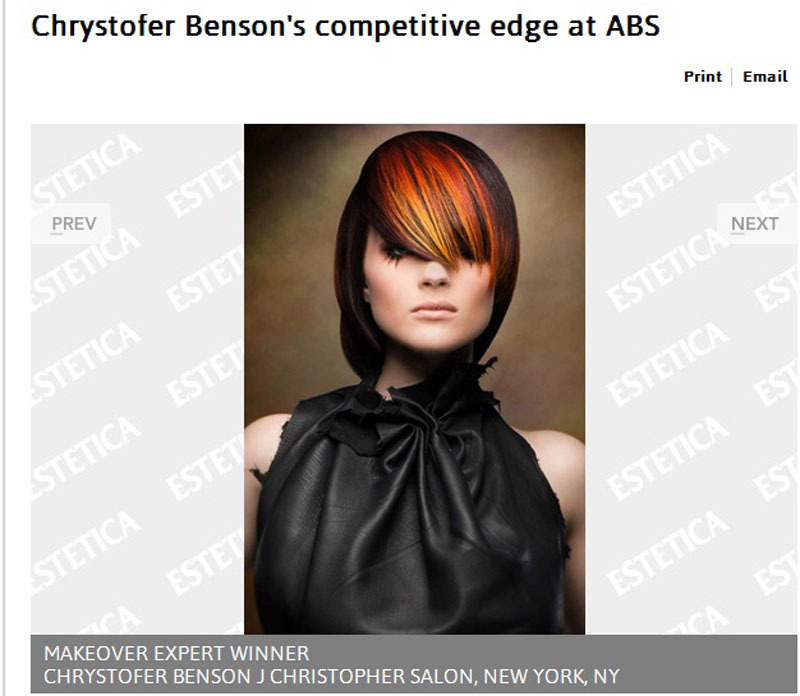 His Texture entry featured a mop-topped model with crimped tresses forming a brighter aura for the darker hue underneath while an understated graduated bob was the backdrop for the fiery fringe licking the nose and cheekbones of his Makeover model. 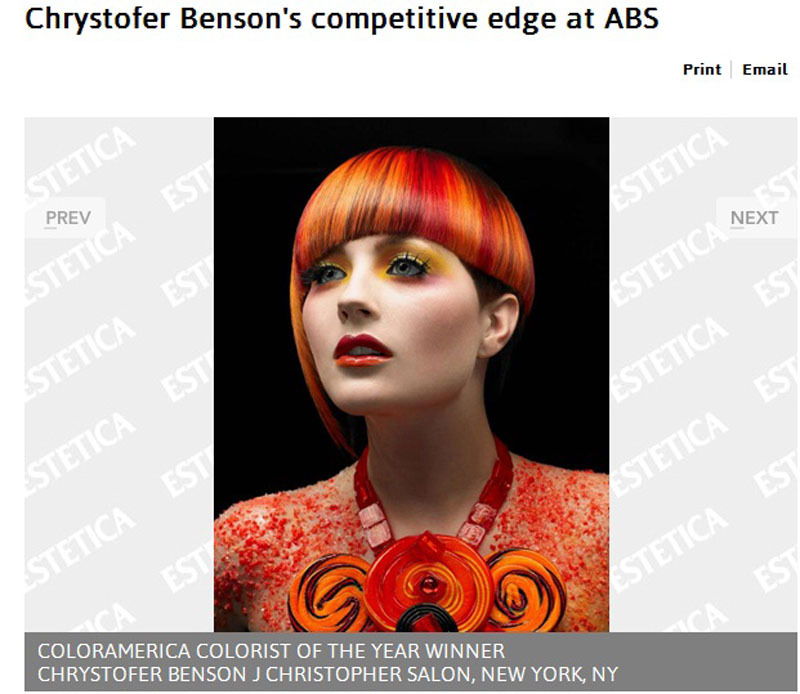 Benson once again reiterates with red for his Colorist of the Year shots, perfectly versatile in a sleek and textured versions. 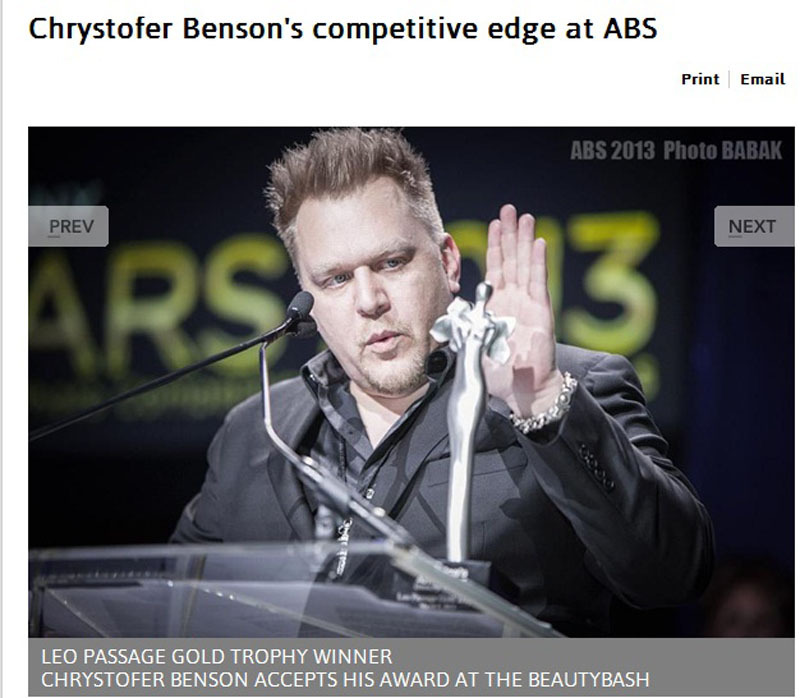 Having once again outdone himself, who could be more deserving than Chystofer of the Leo Passage Gold Trophy, which he graciously accepted at the BeautyBASH ceremony. 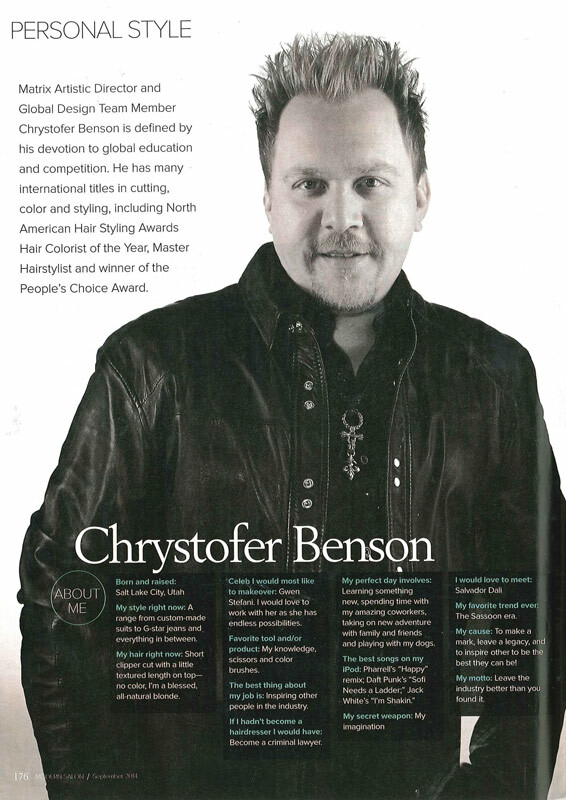 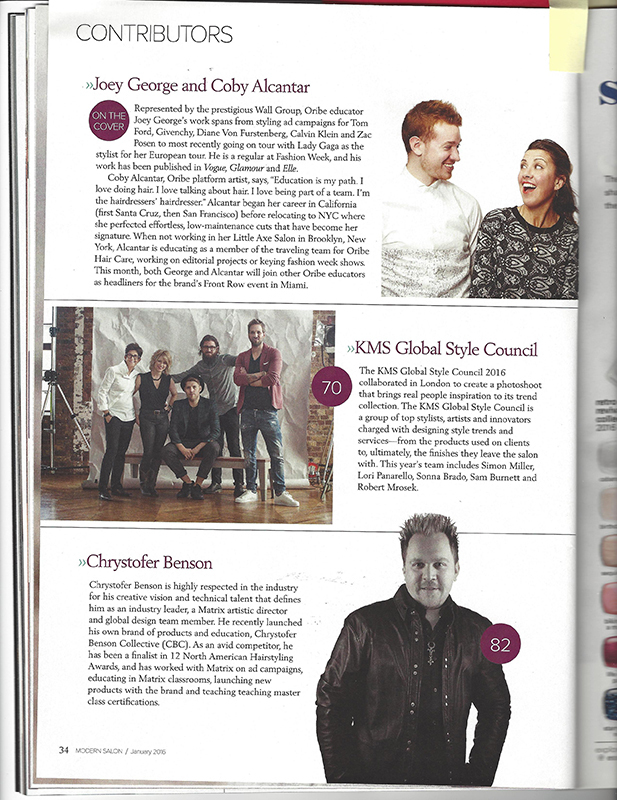 Chrystofer Benson: setting a new benchmark in hairdressing! 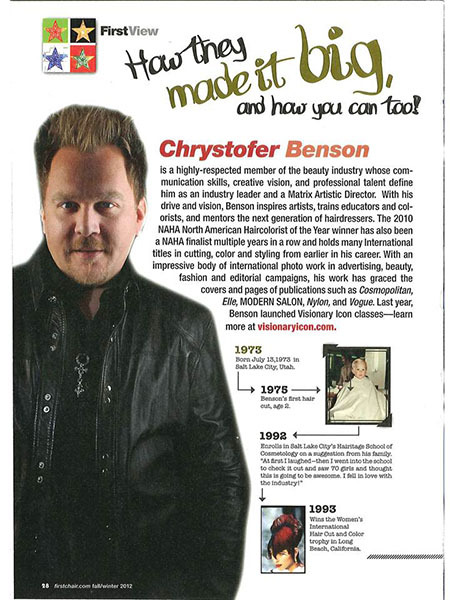 Passionate, talented artists like Chrystofer Benson are the heart of Bangstyle providing inspiration to our global community of hair enthusiasts. 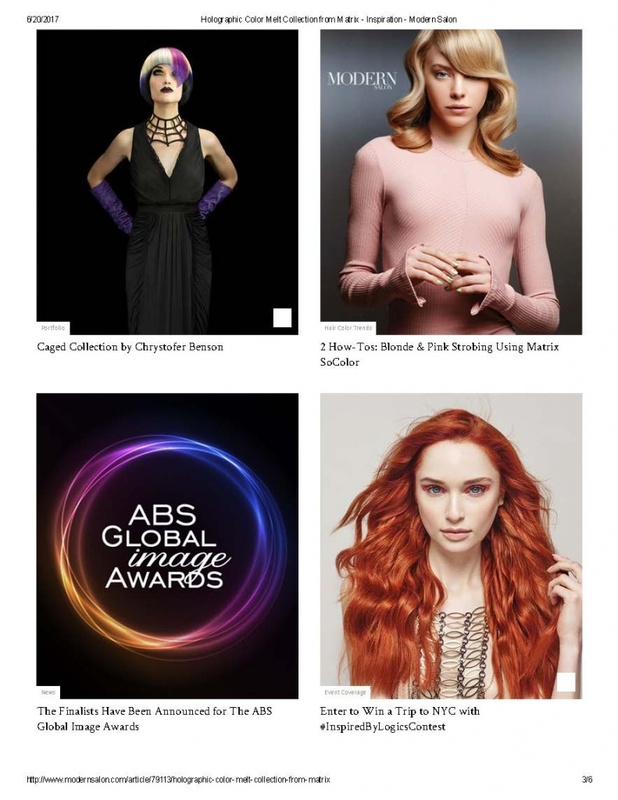 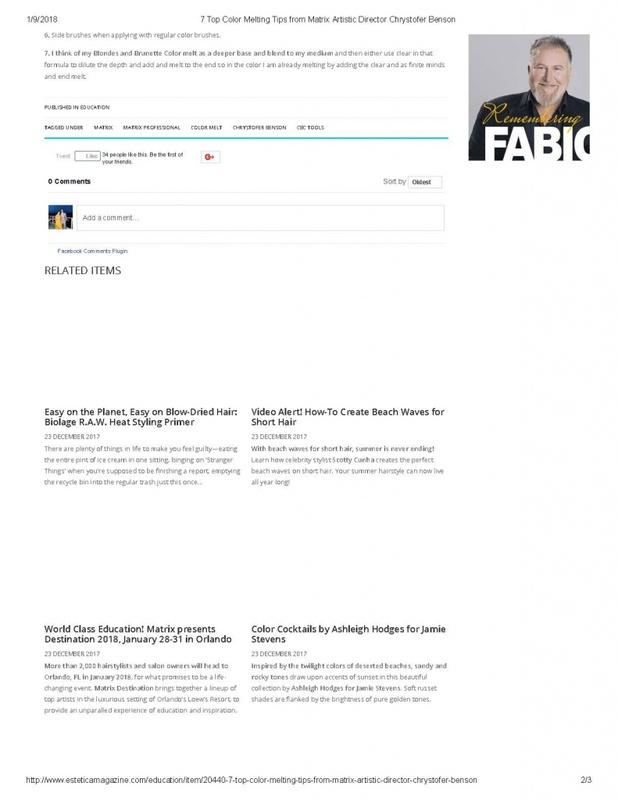 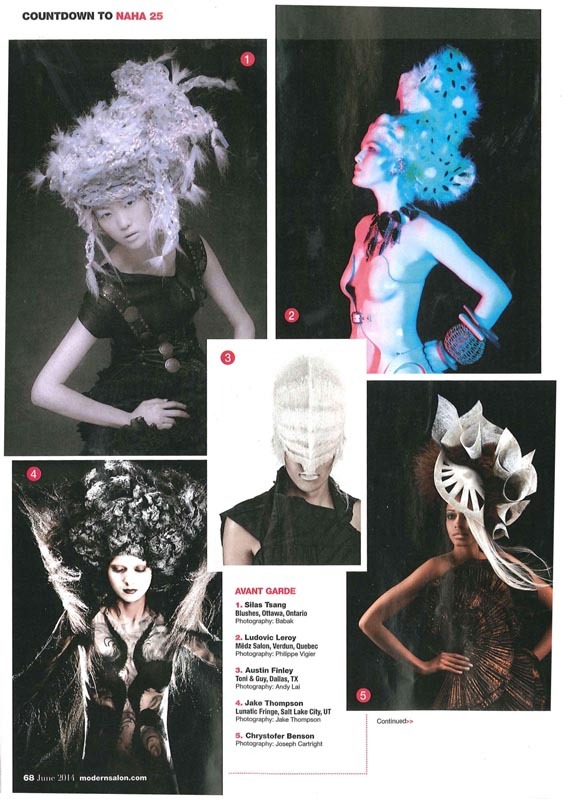 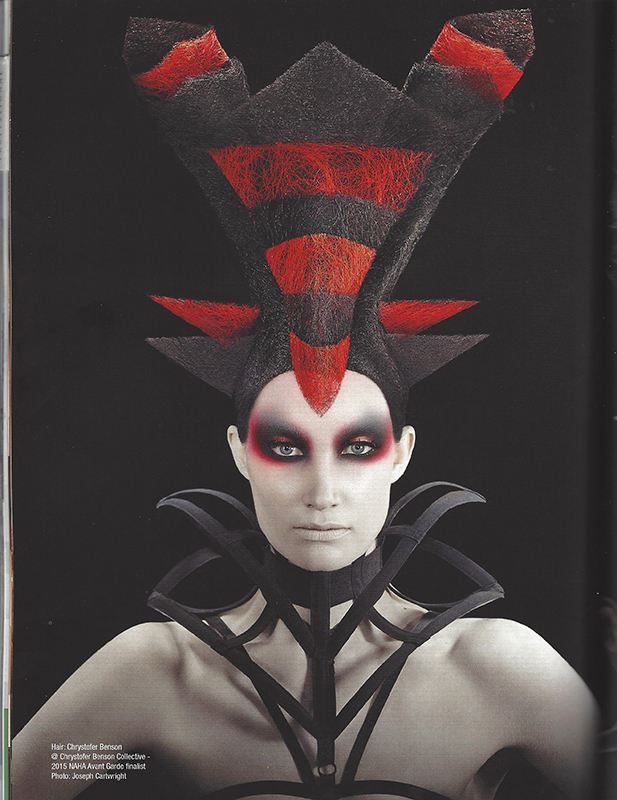 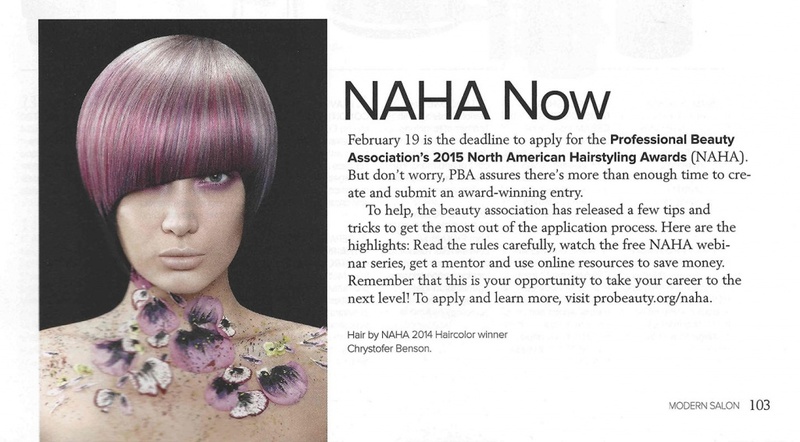 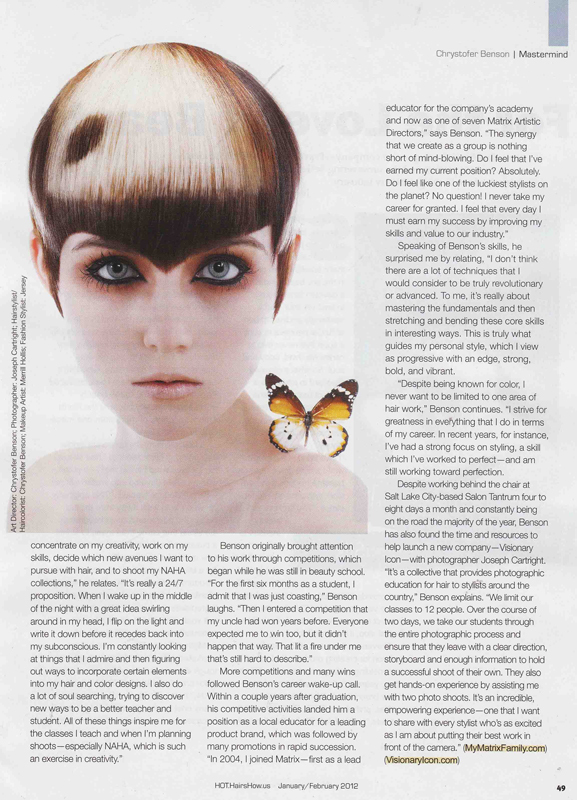 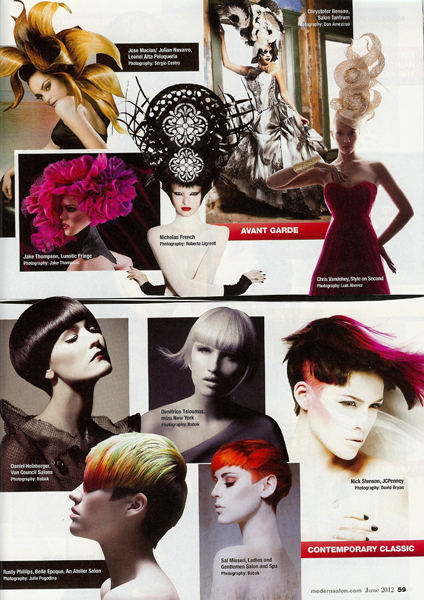 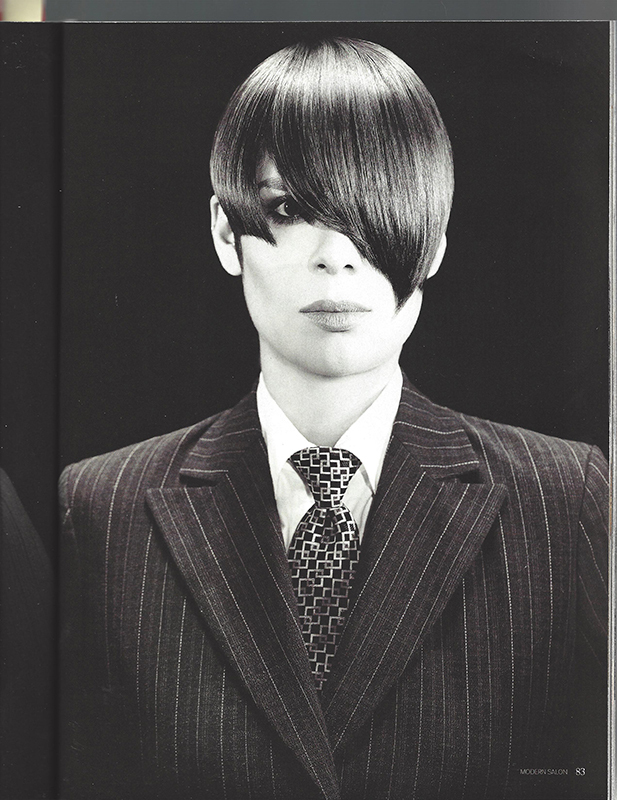 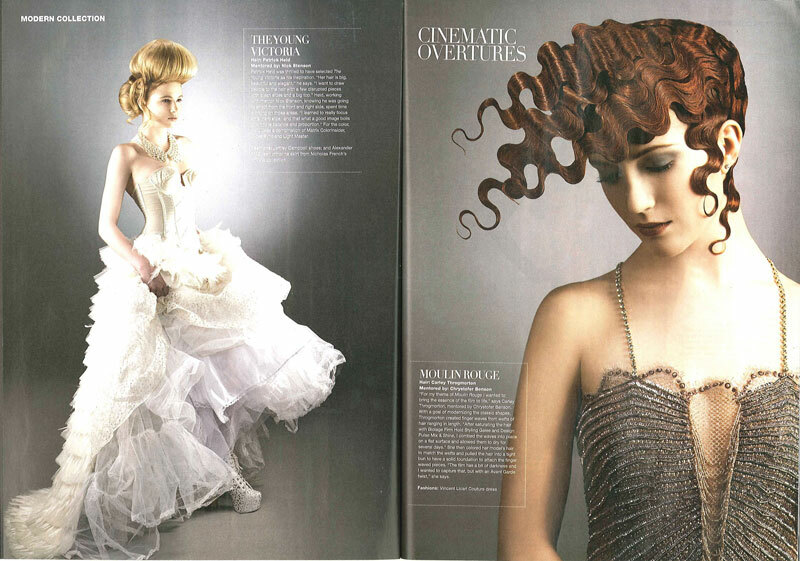 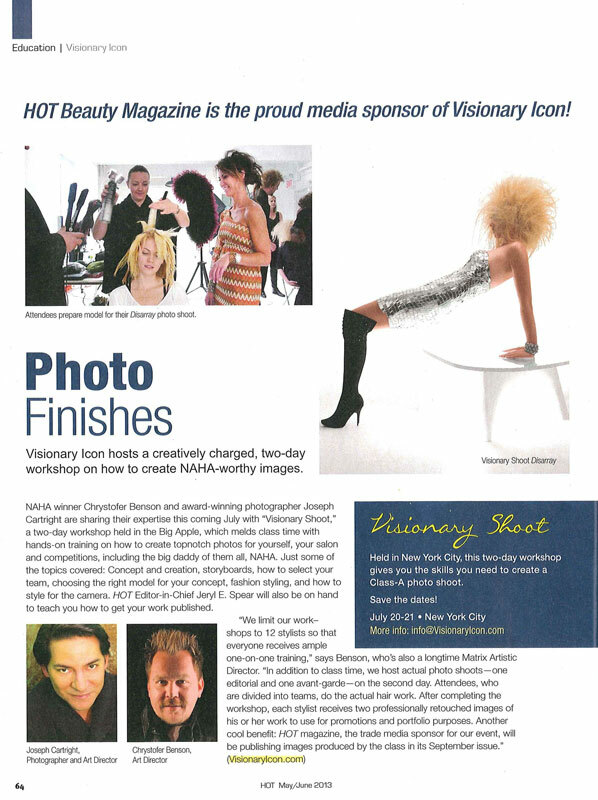 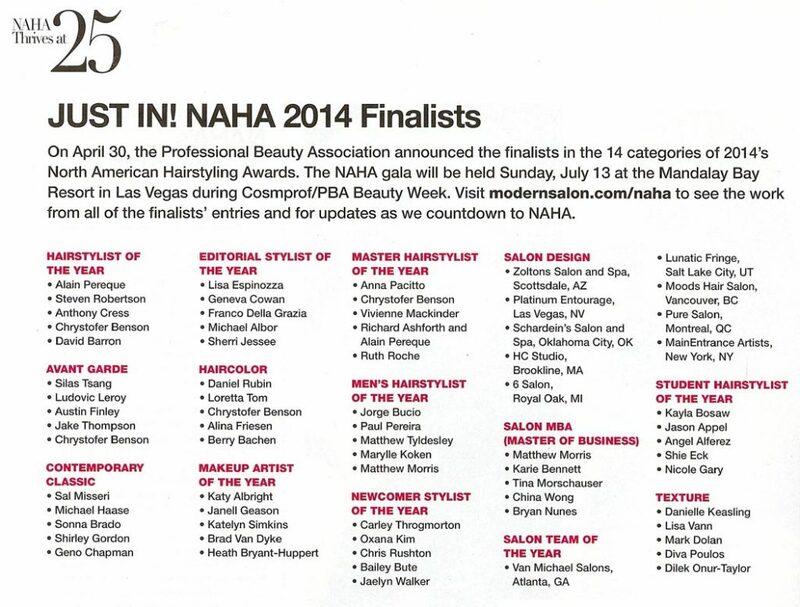 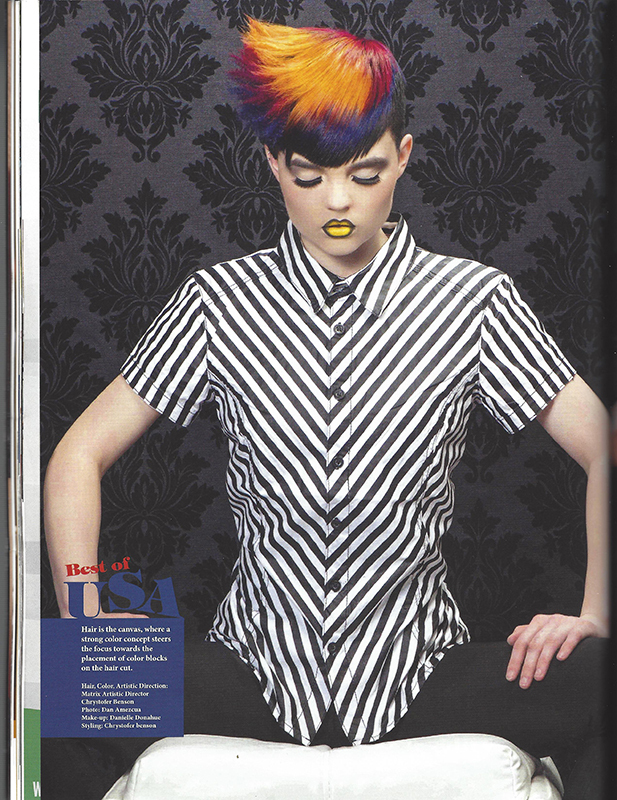 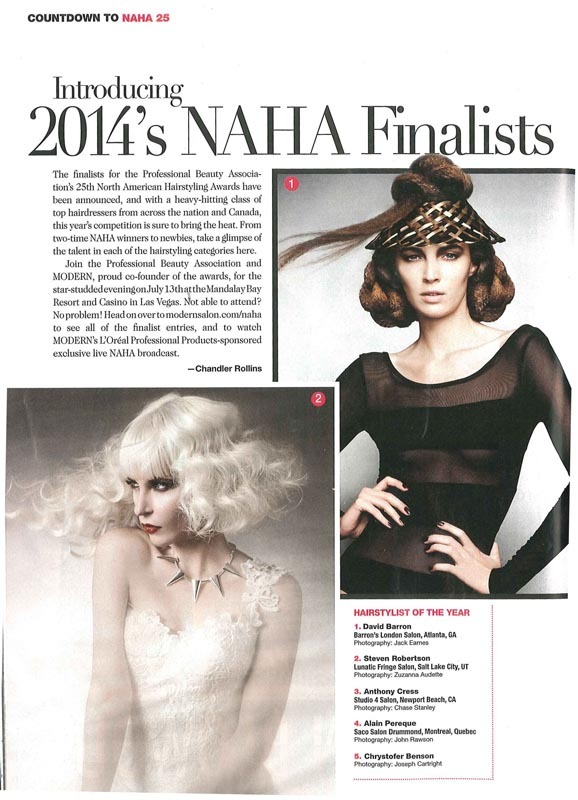 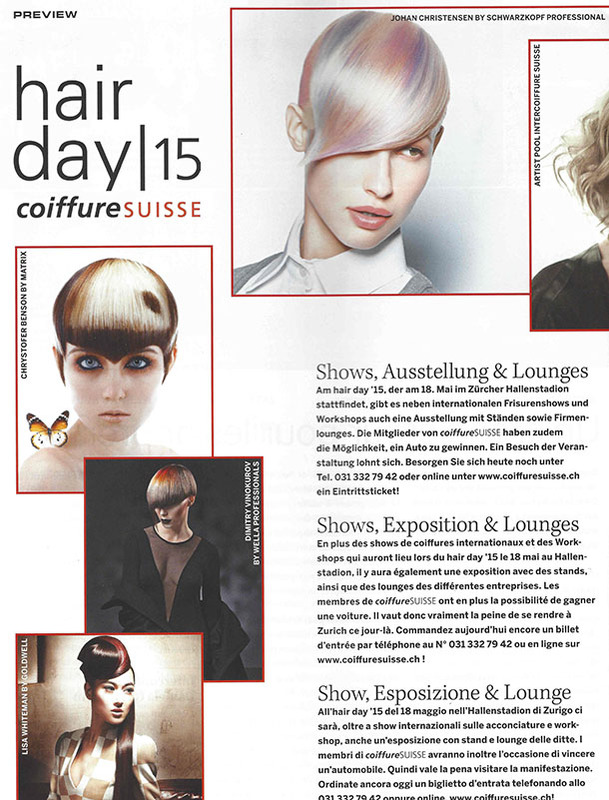 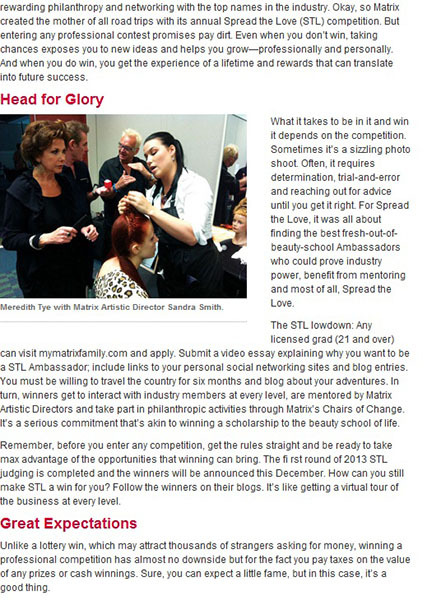 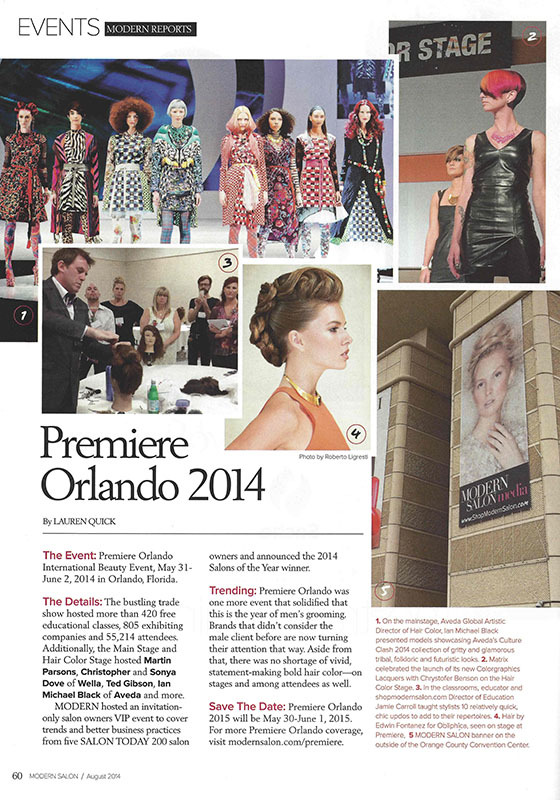 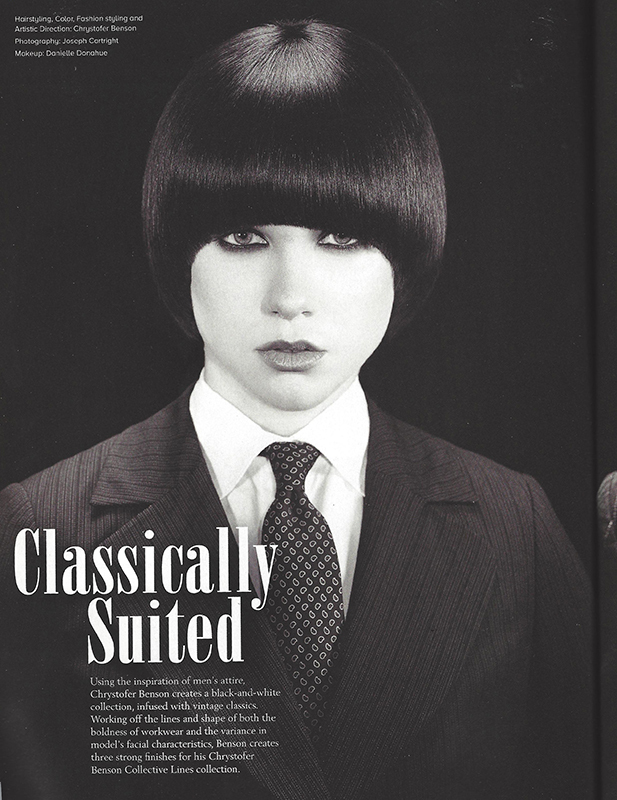 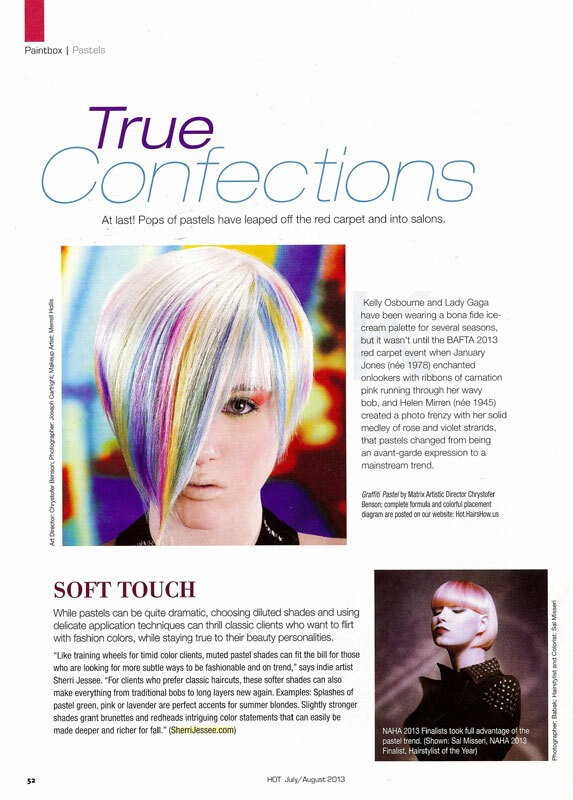 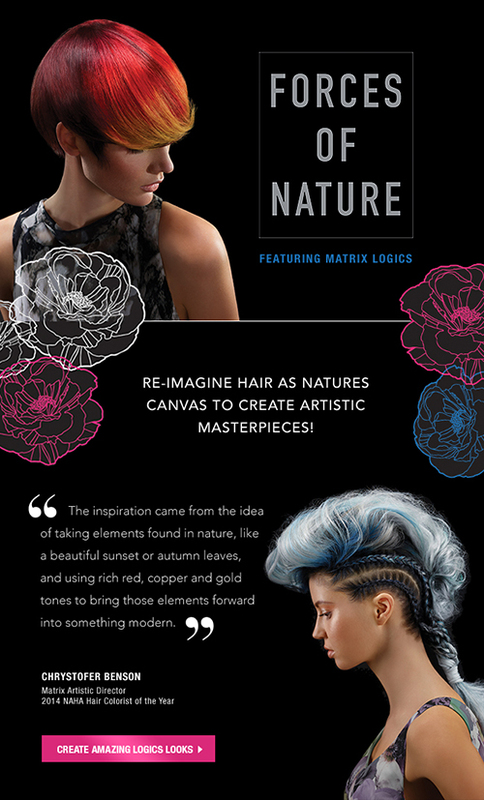 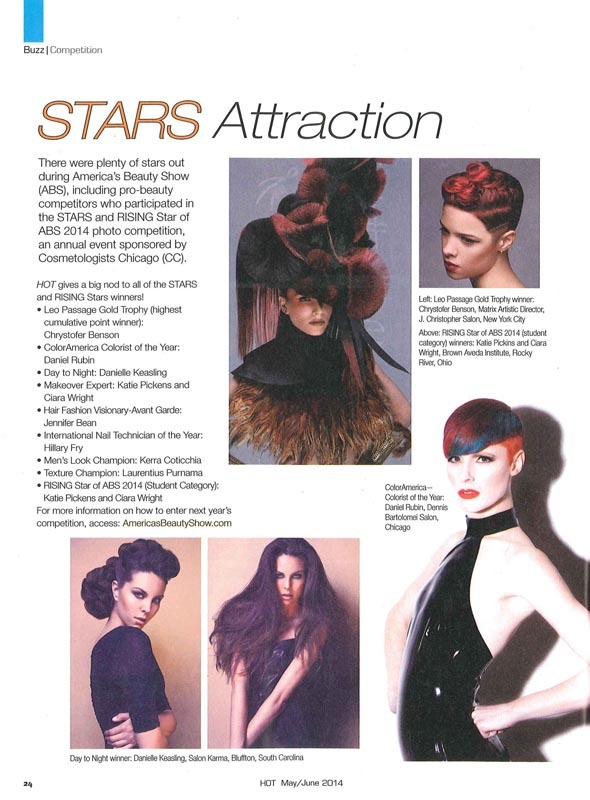 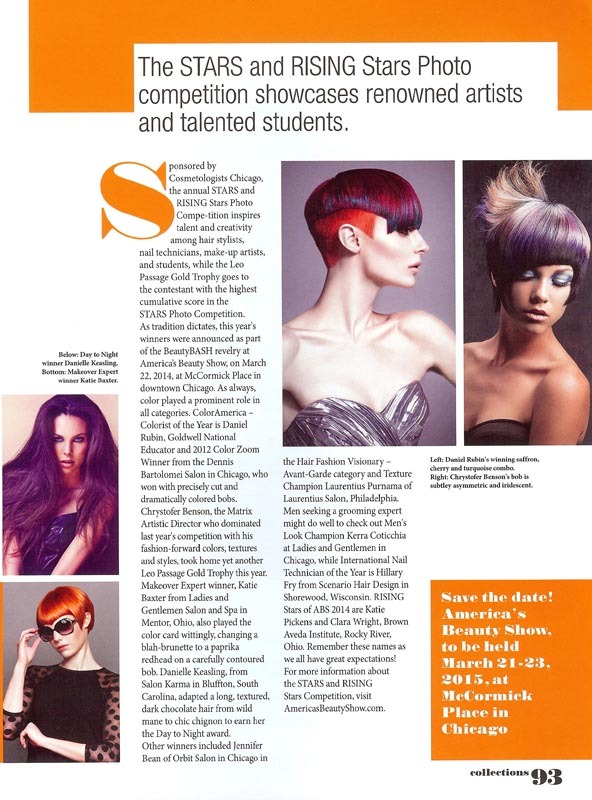 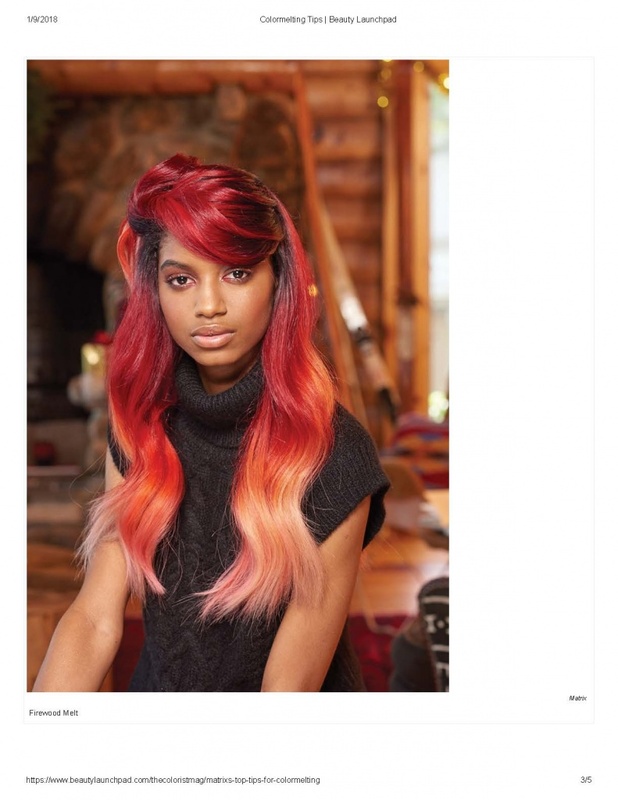 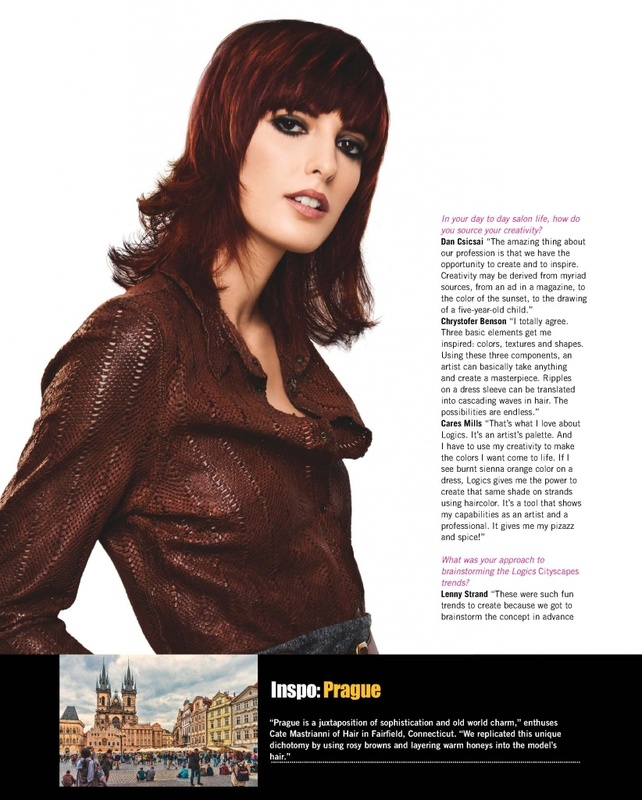 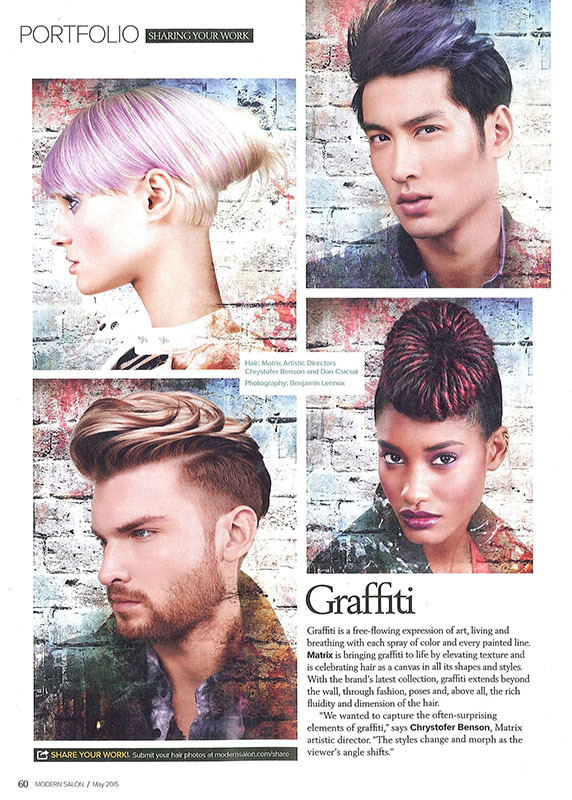 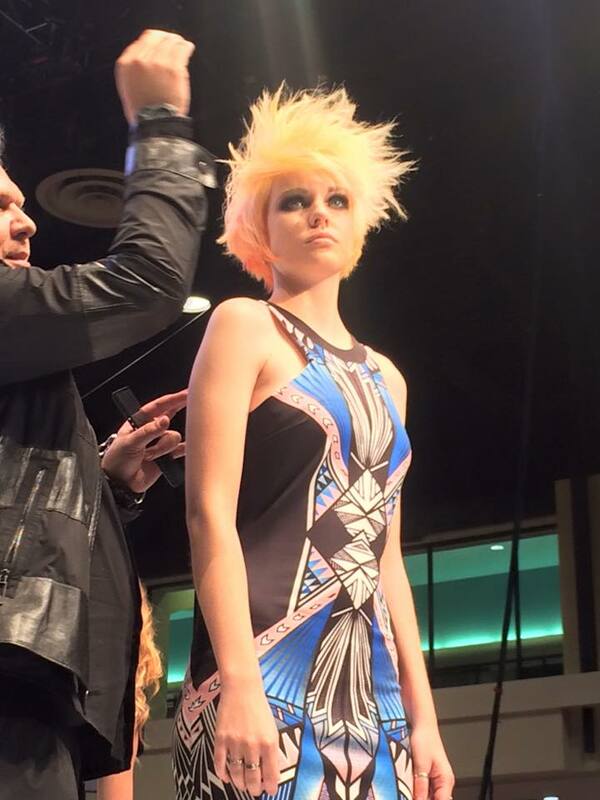 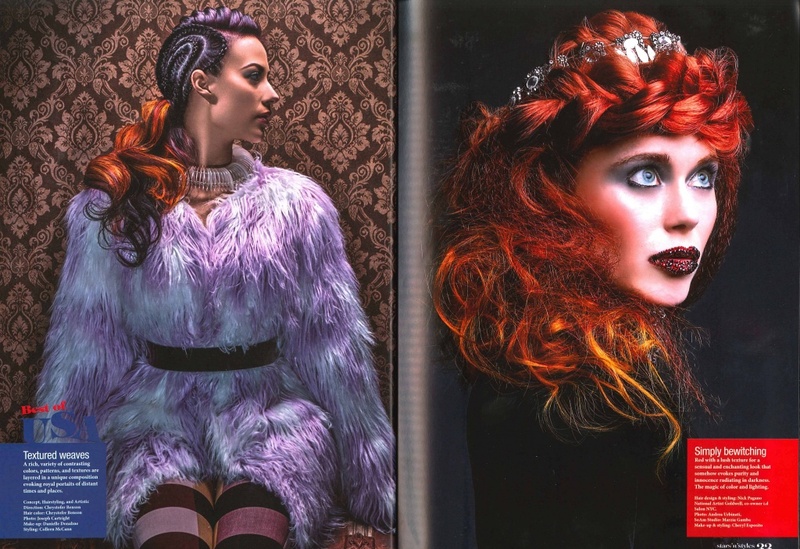 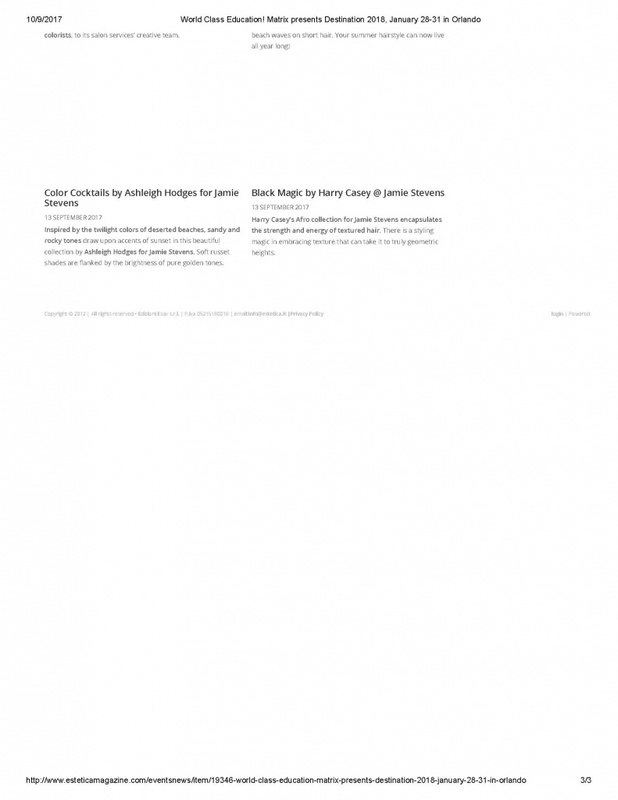 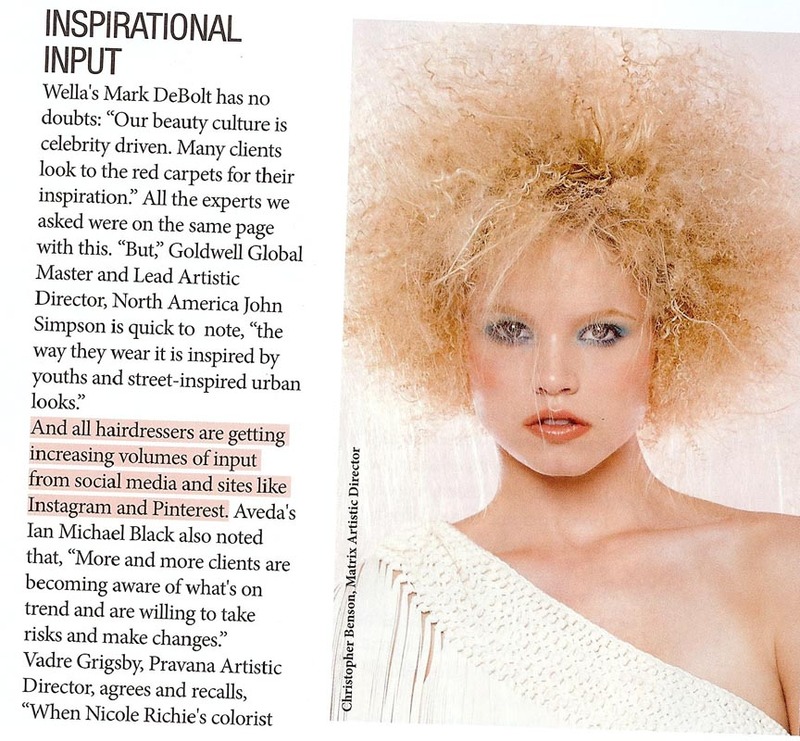 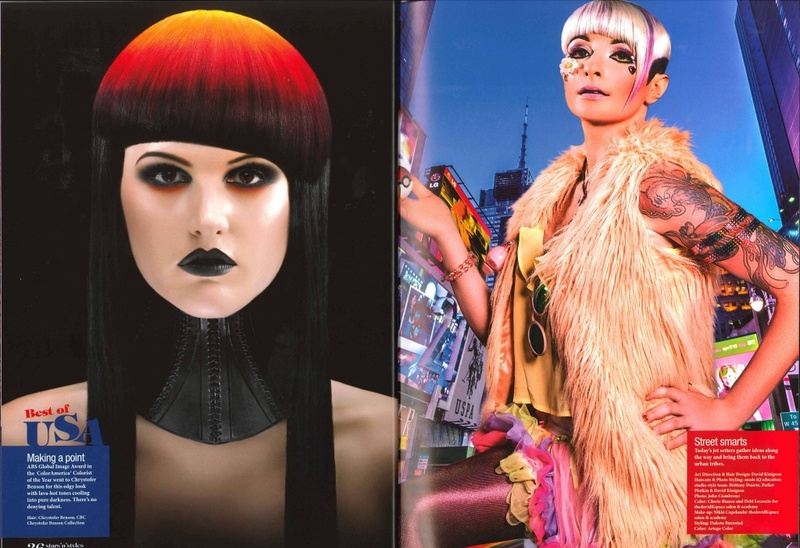 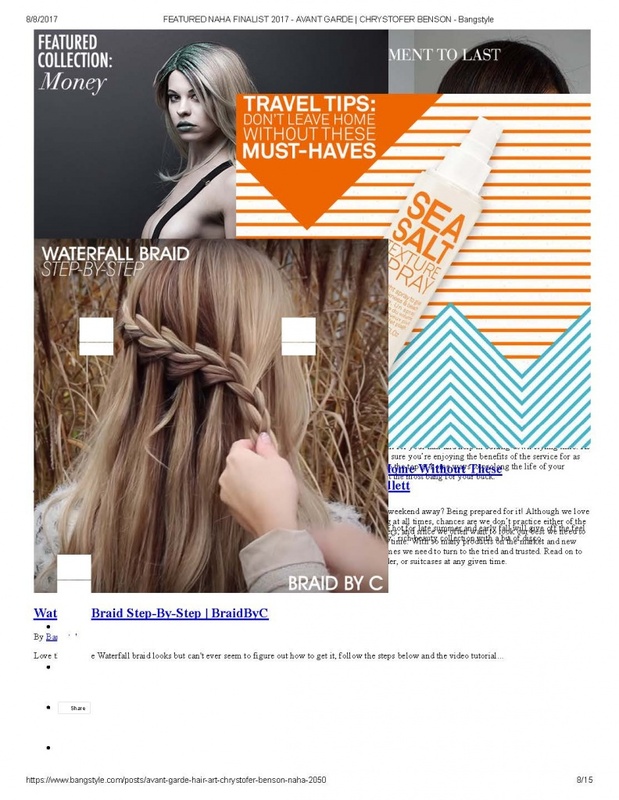 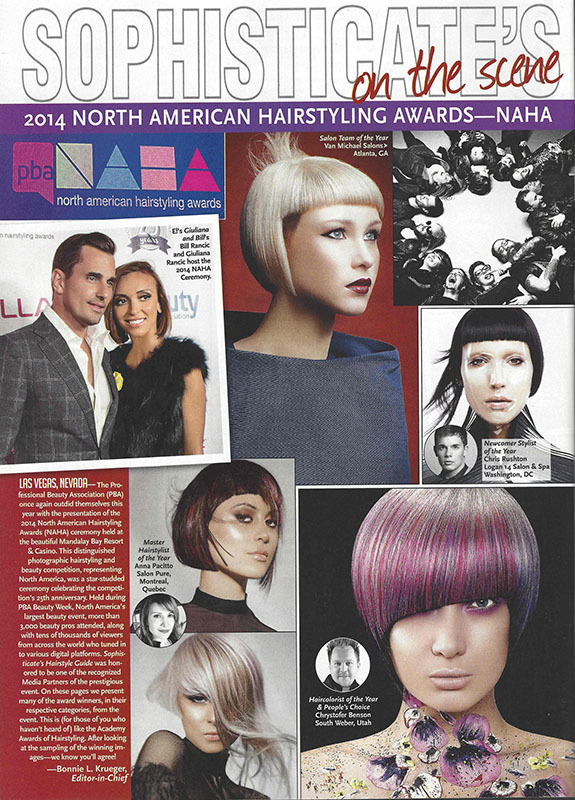 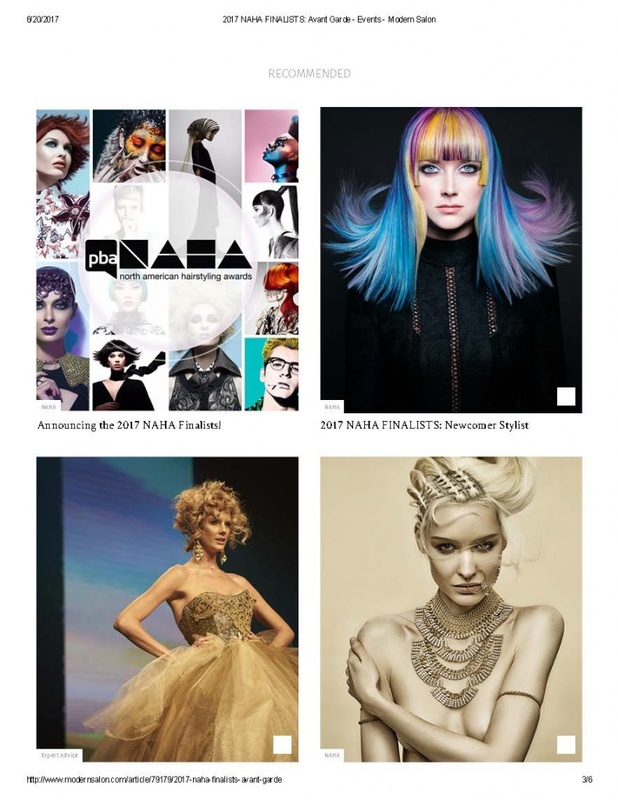 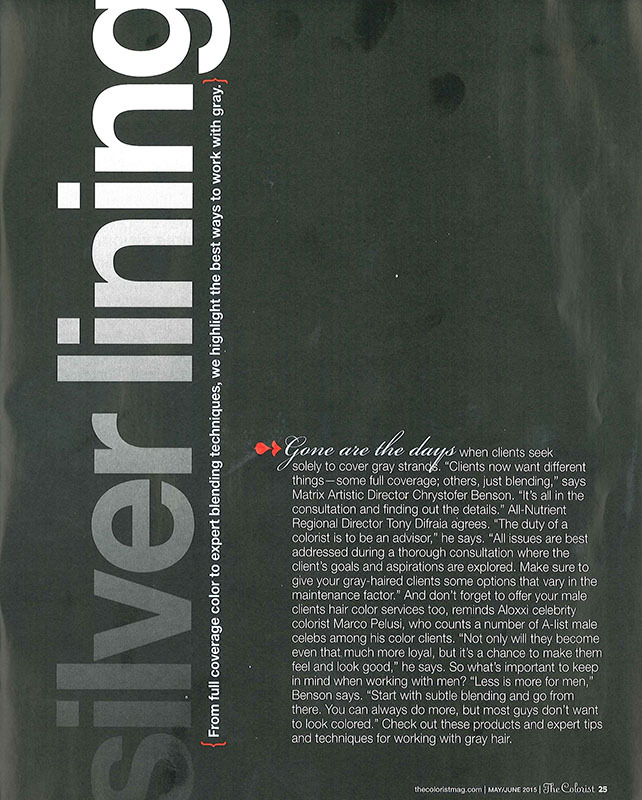 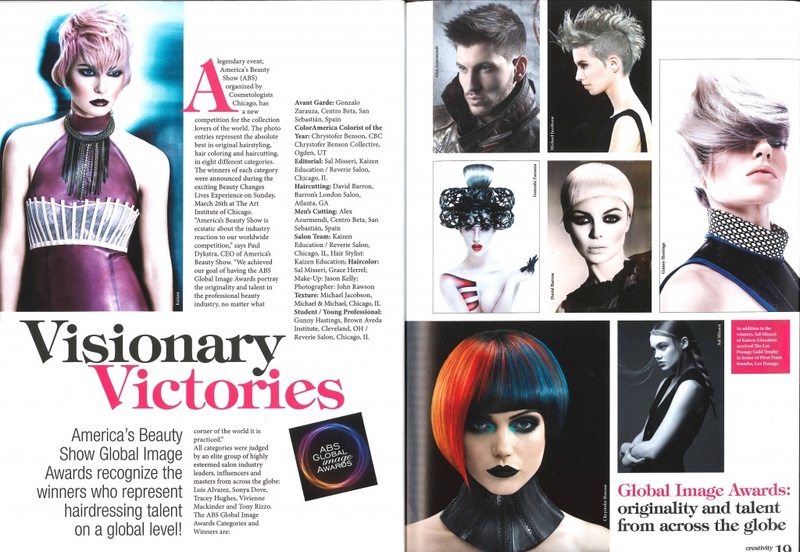 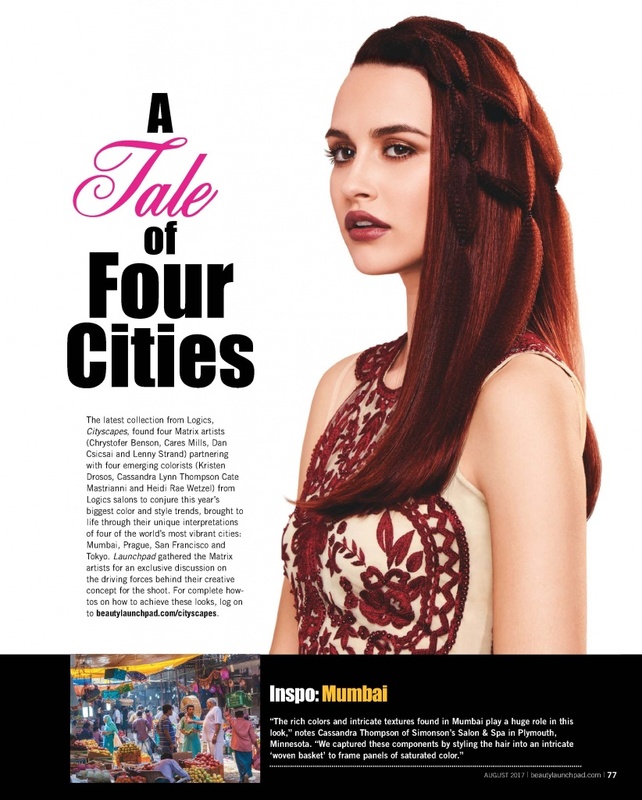 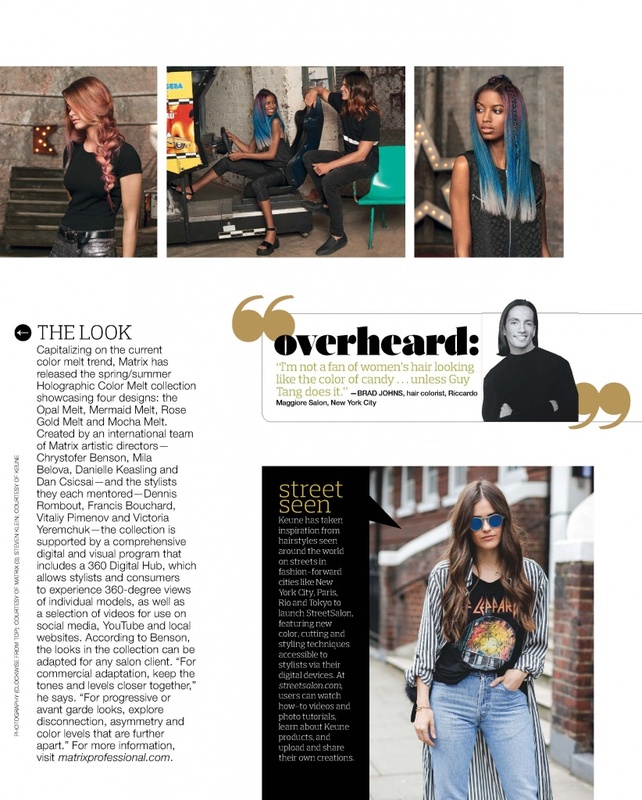 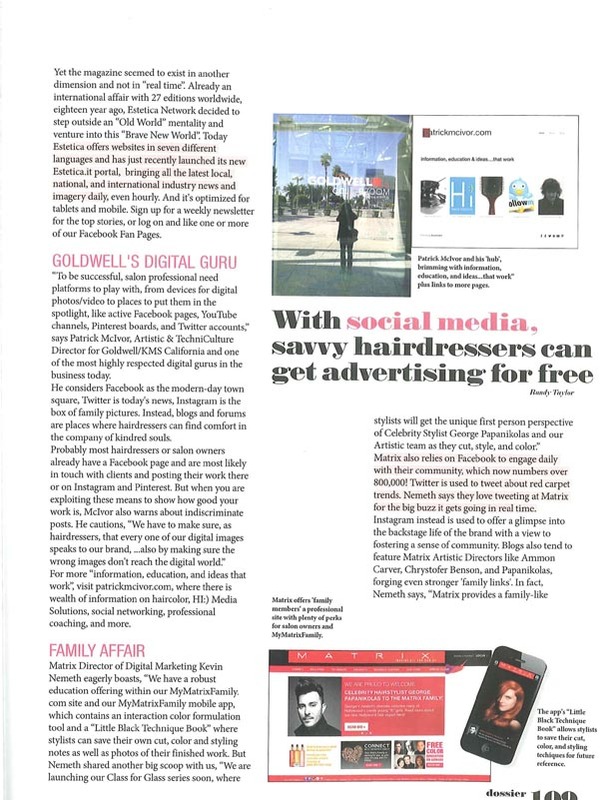 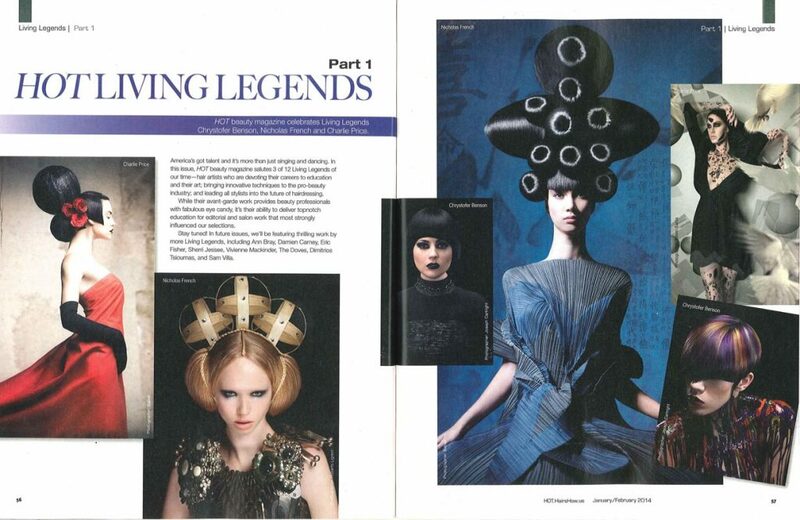 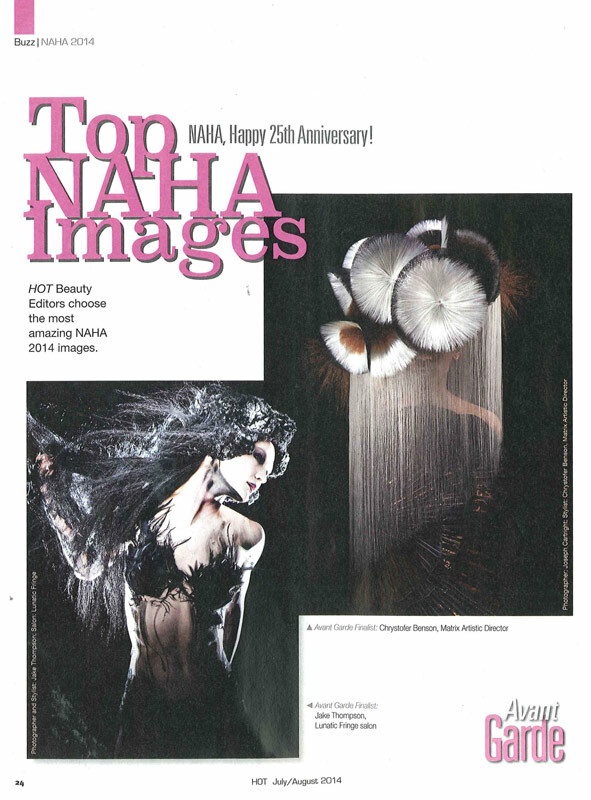 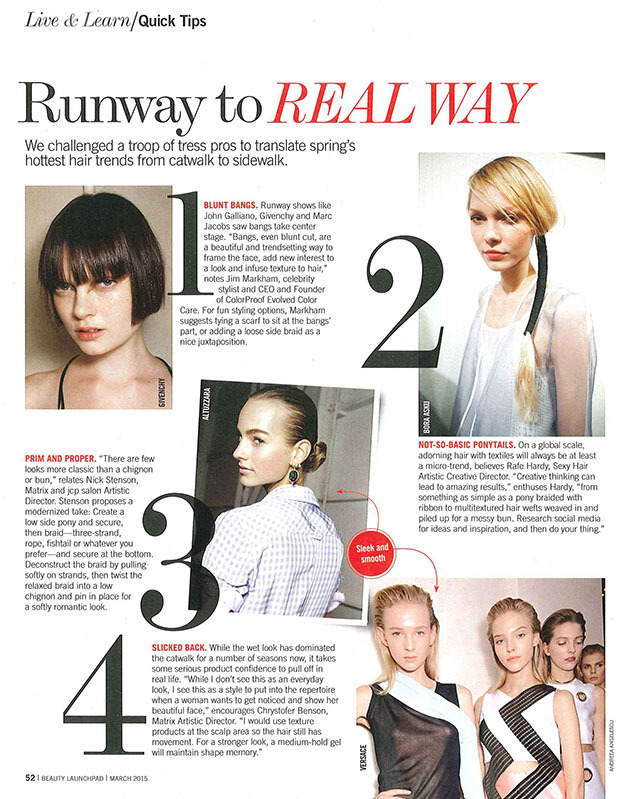 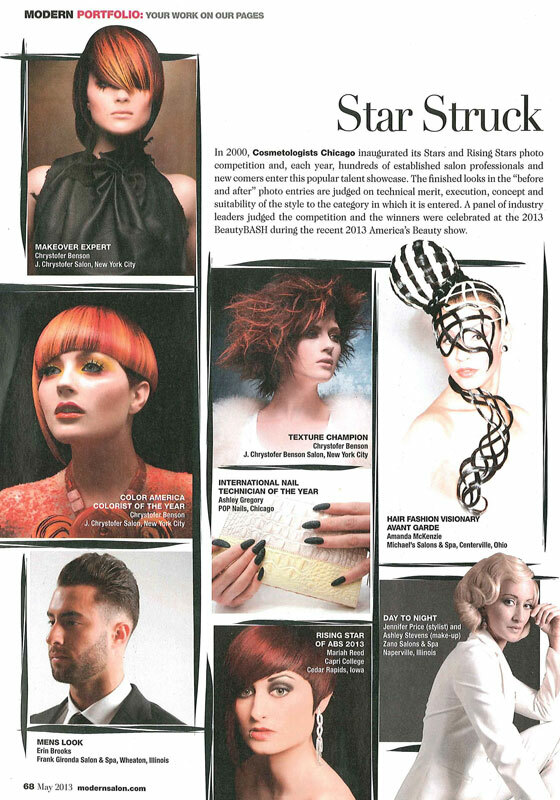 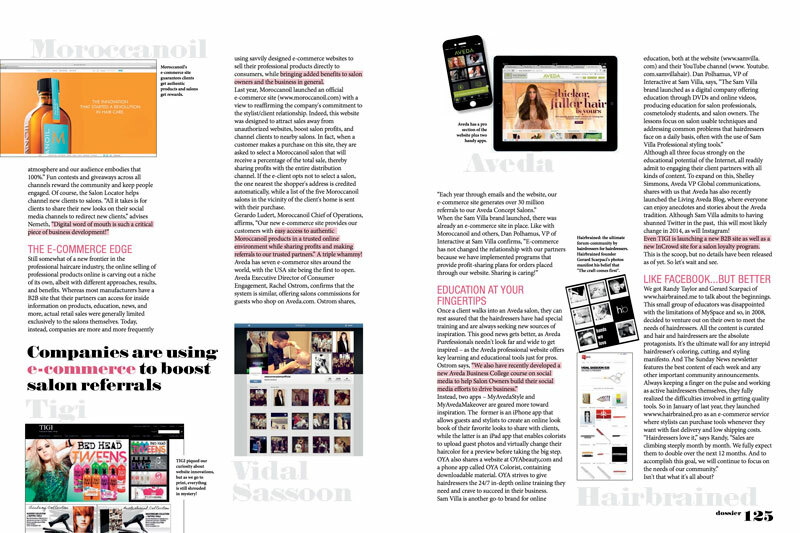 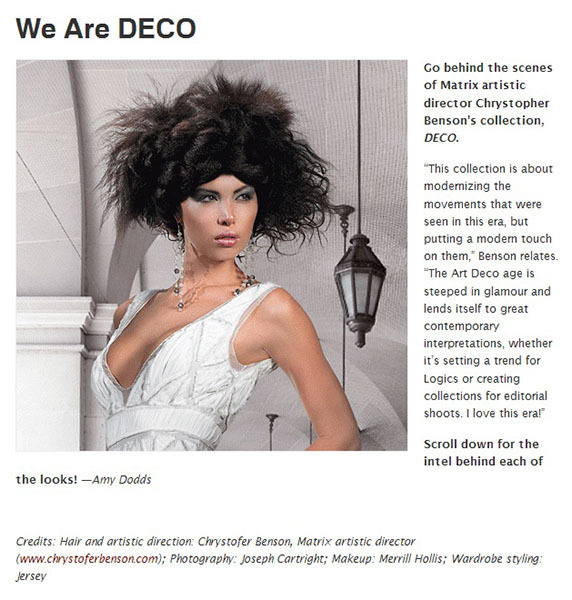 We are so honored to have his editorial to NAHA winning collections on our Website and App. 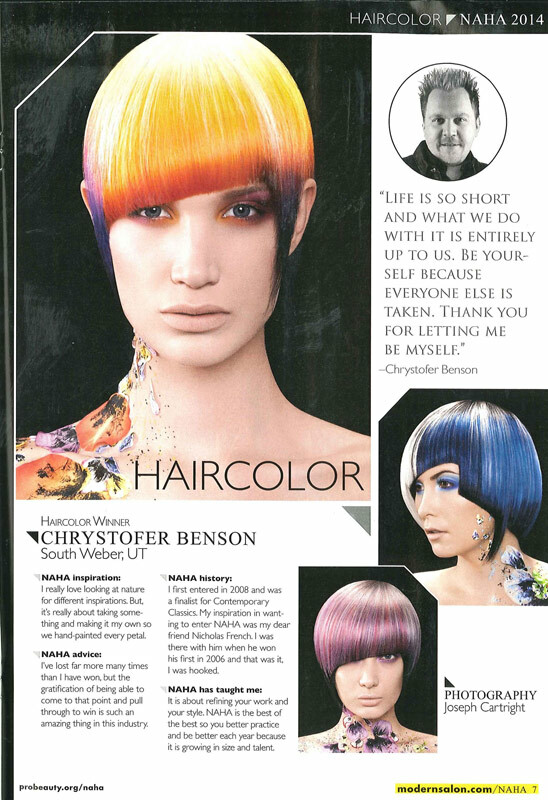 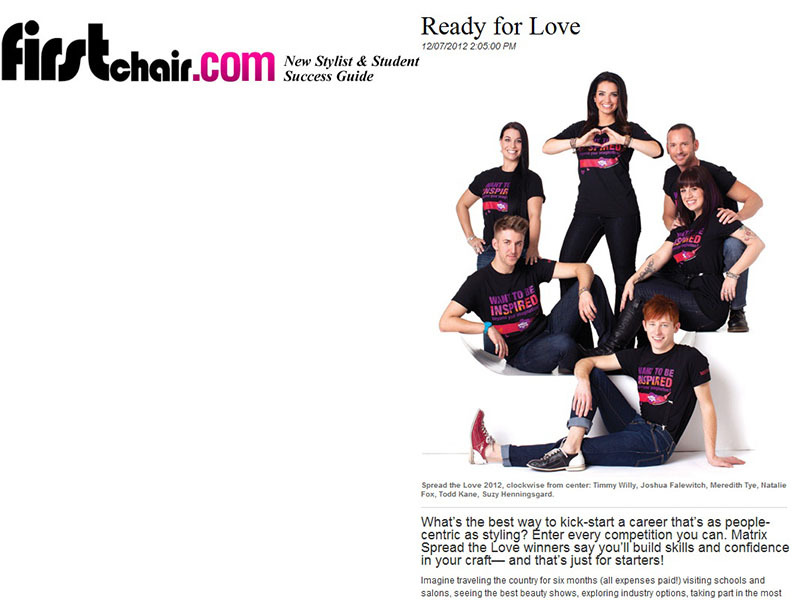 We love and adore working with Chrys, can’t wait to see what incredible hair art he has in store for all of us! 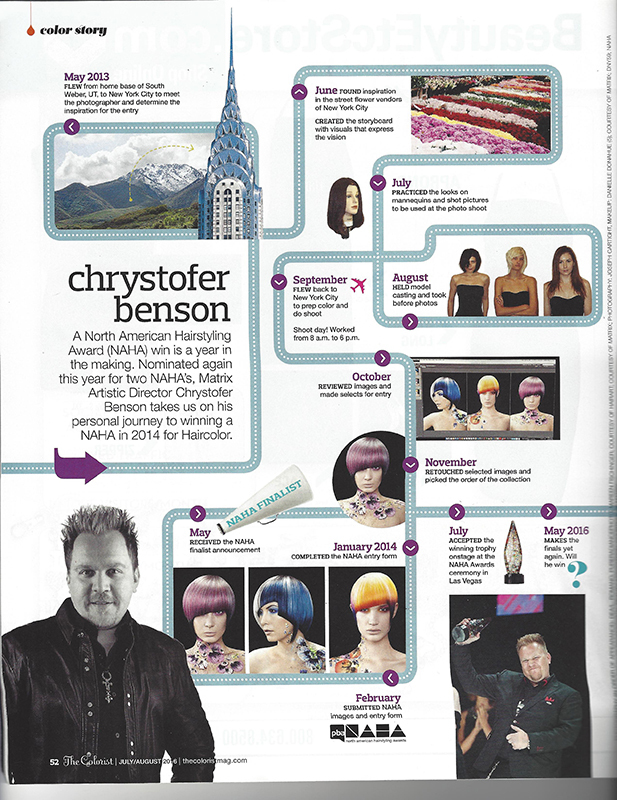 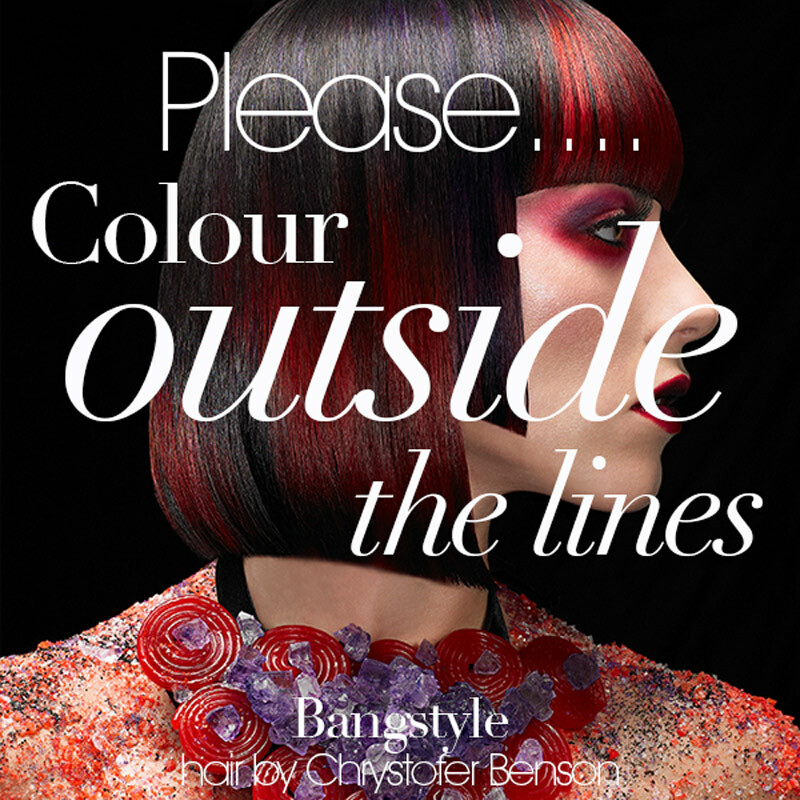 Chrystofer Benson’s imagination and skills never fail to delight and inspire stylists all over the world. 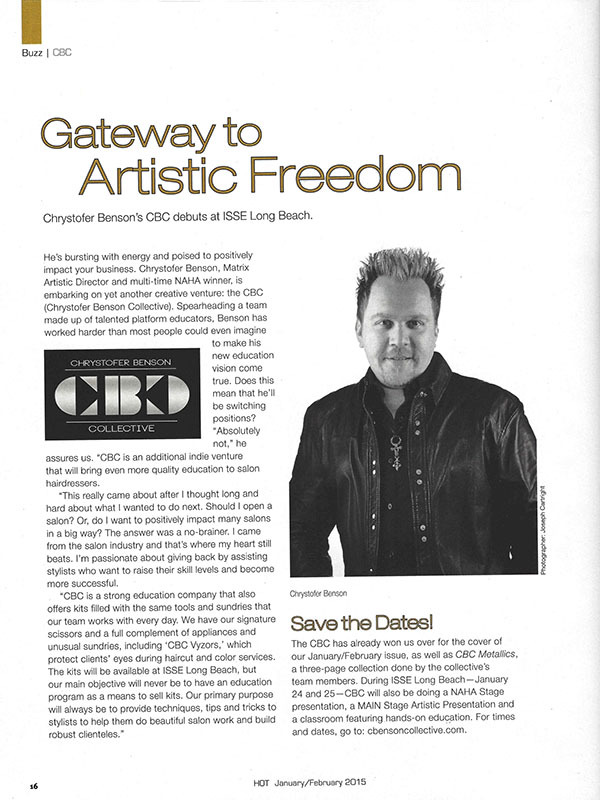 He’s a consummate artist who devotes himself to his craft. 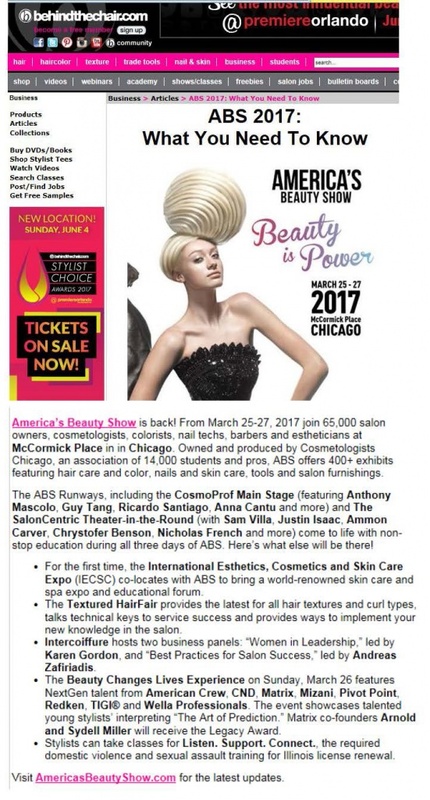 It definitely shows! 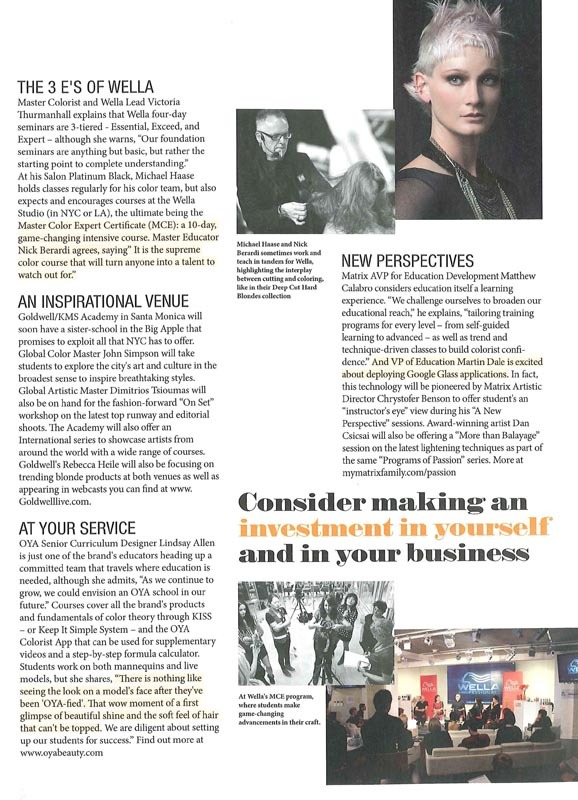 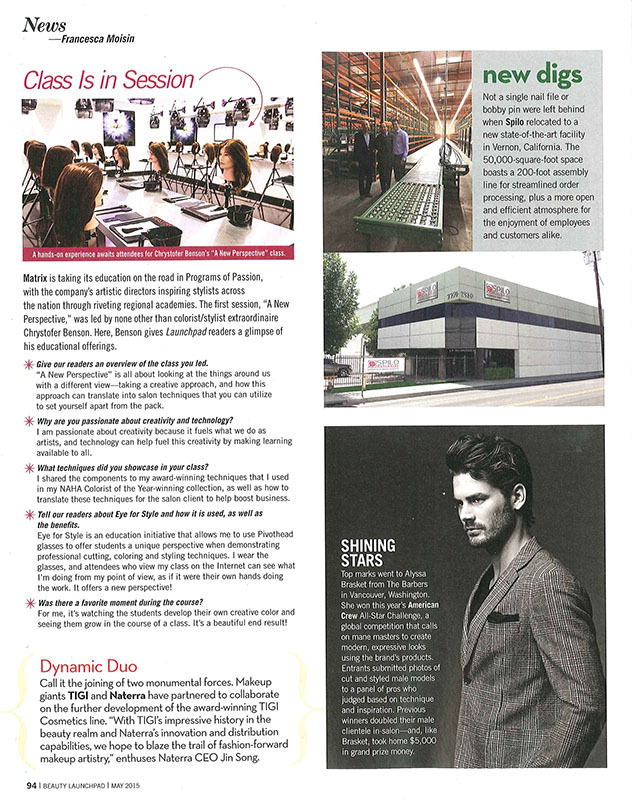 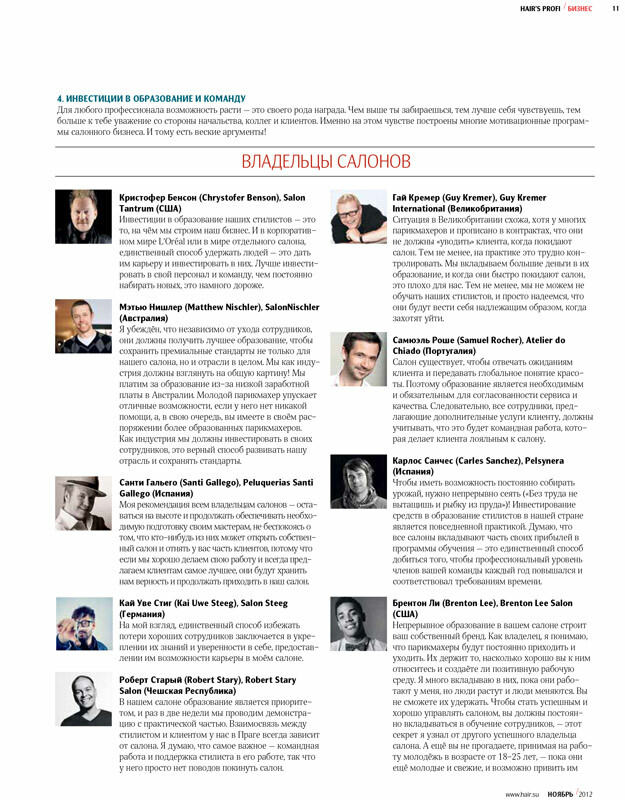 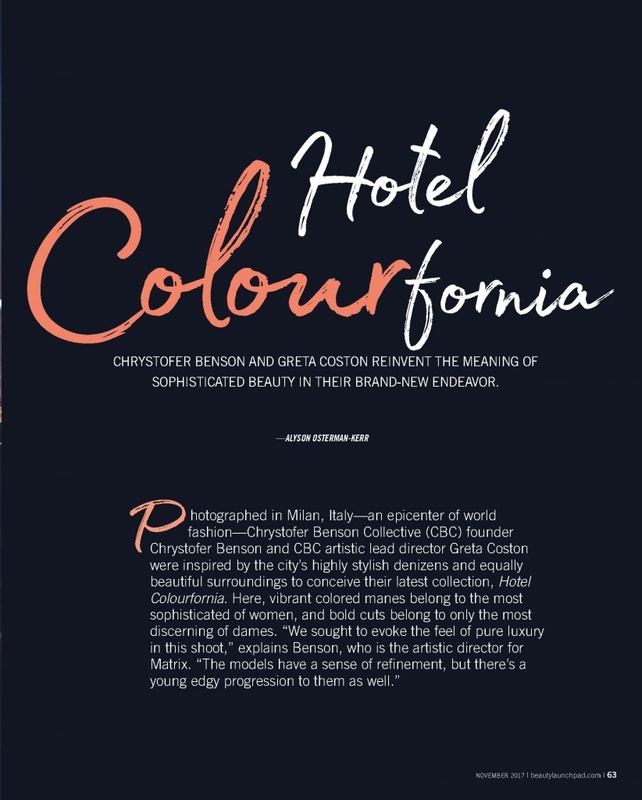 We have featured Chrystofer numerous times in our magazine – including no less than three covers – and look forward to working with him on a multitude of projects in the future. 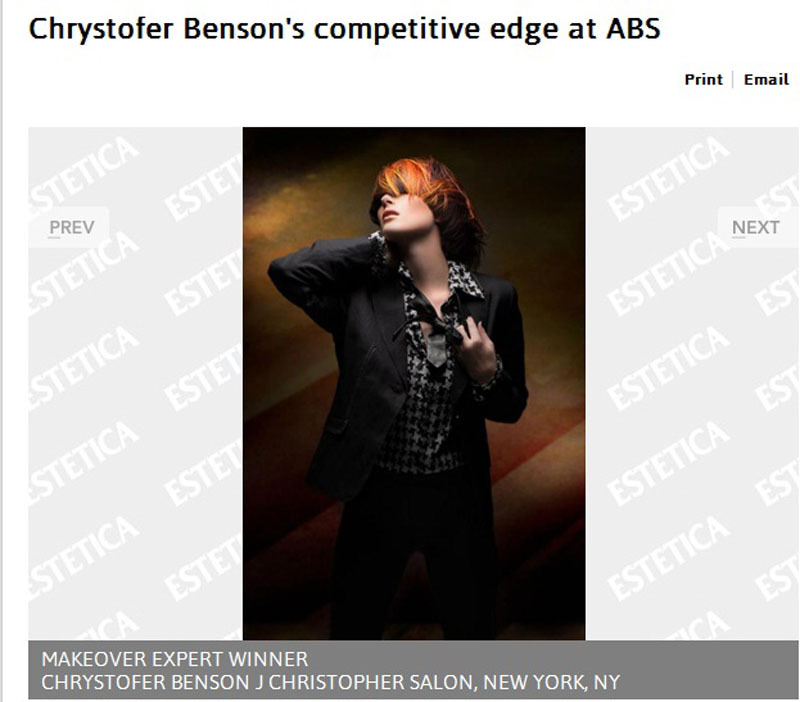 Chrystofer Benson comes alive when on set at a photoshoot—the professionalism, the focus, the excitement and positive energy is contagious. 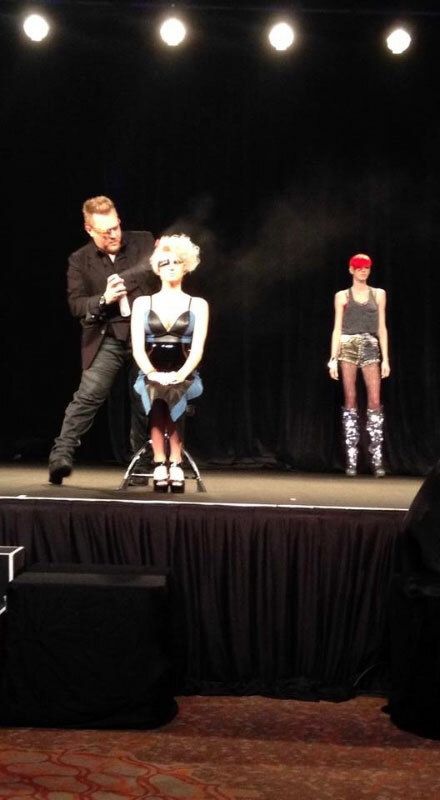 Chrystofer is a machine while presenting on stage—a true performer, he captures any audience. 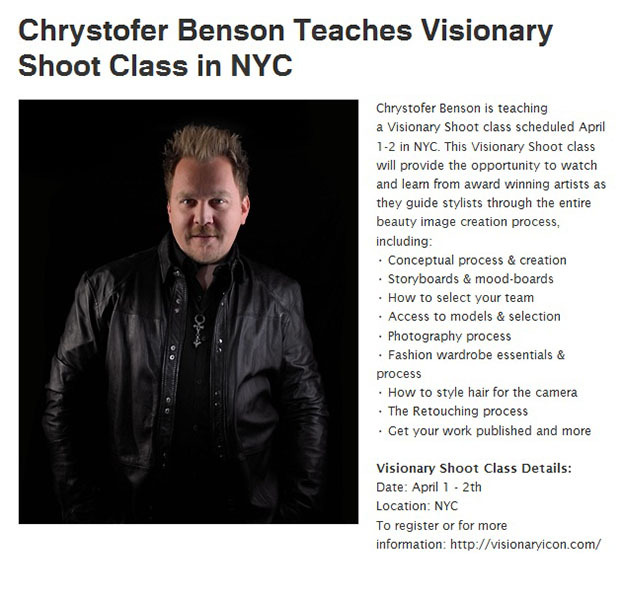 When in the classroom, he’s known for his thoroughness and ability to break down difficult concepts into digestible material. 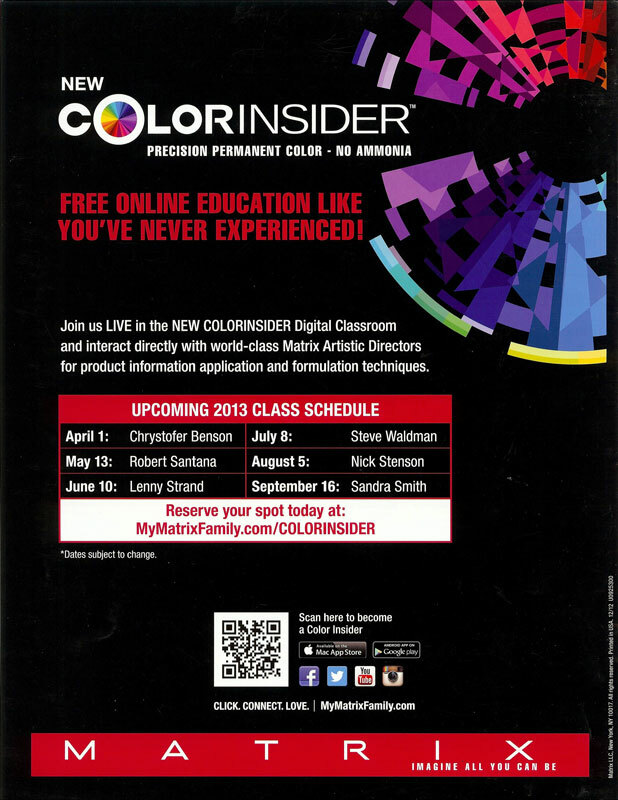 In person? 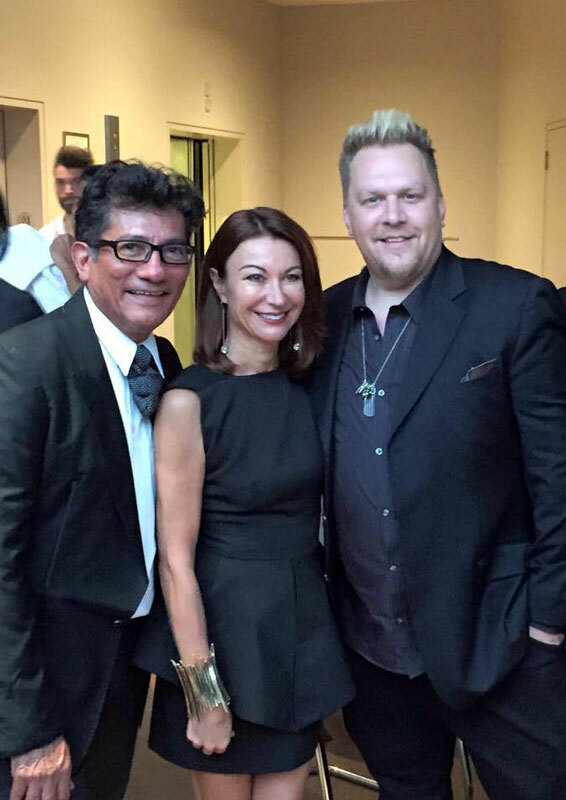 He’s a wonderful person to spend time with—kind, funny, and full of life and laughter. 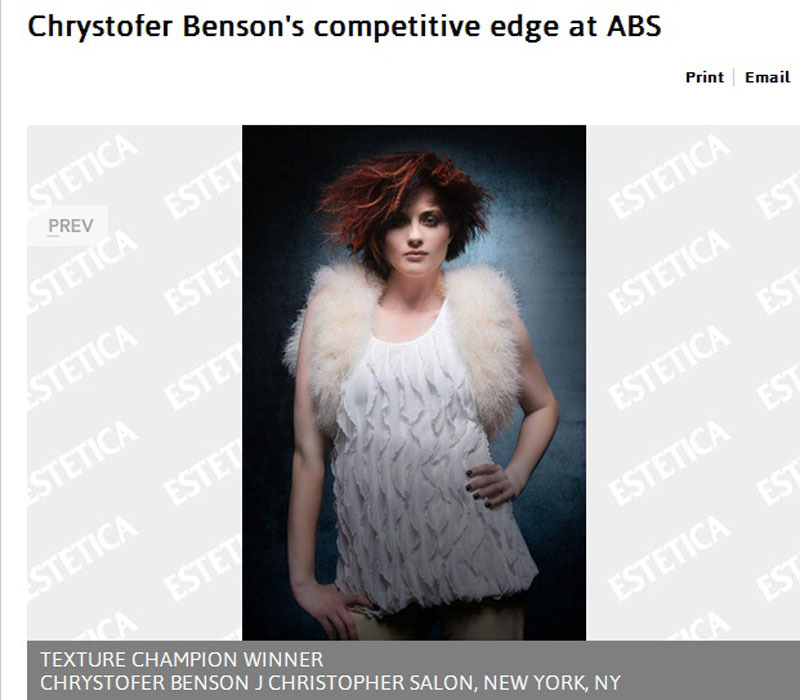 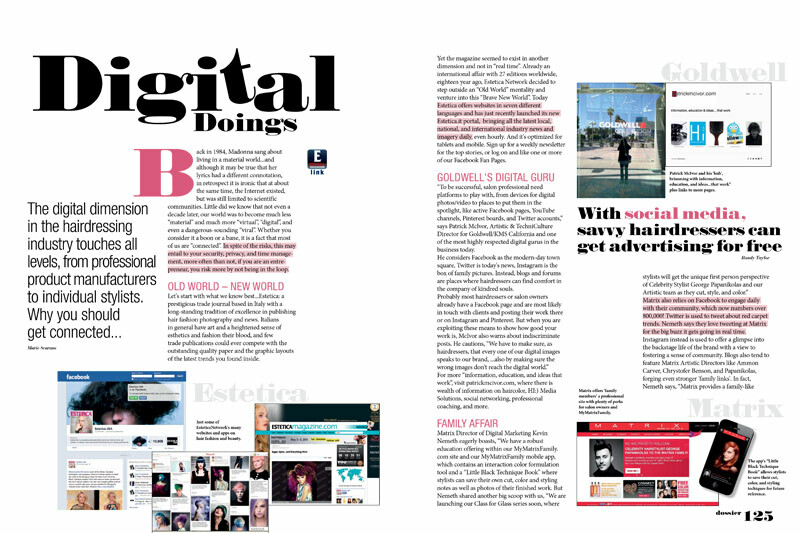 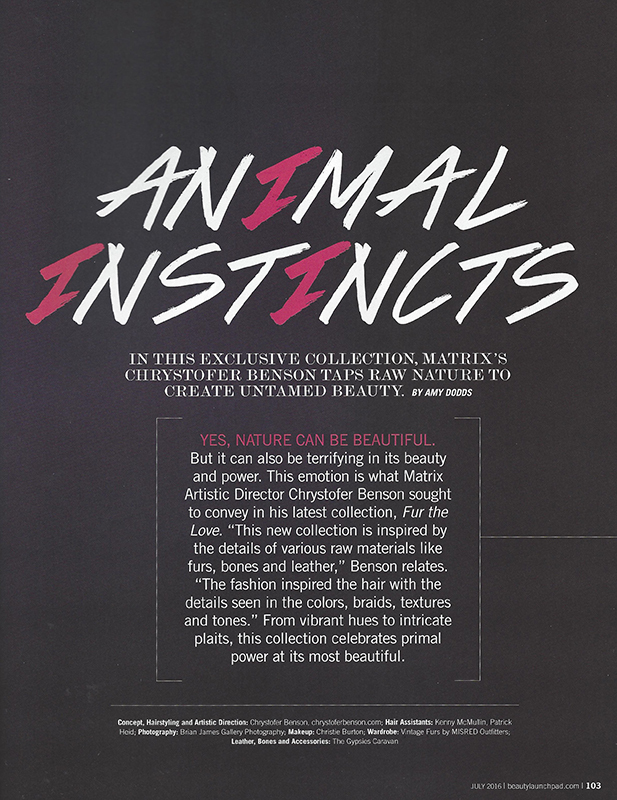 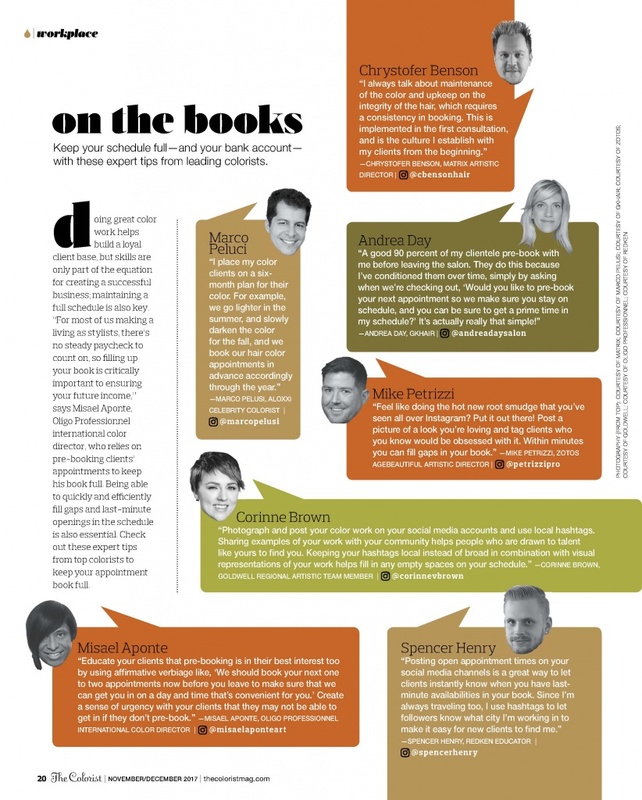 Chrystofer Benson has it all and is a major creative force in our Industry. 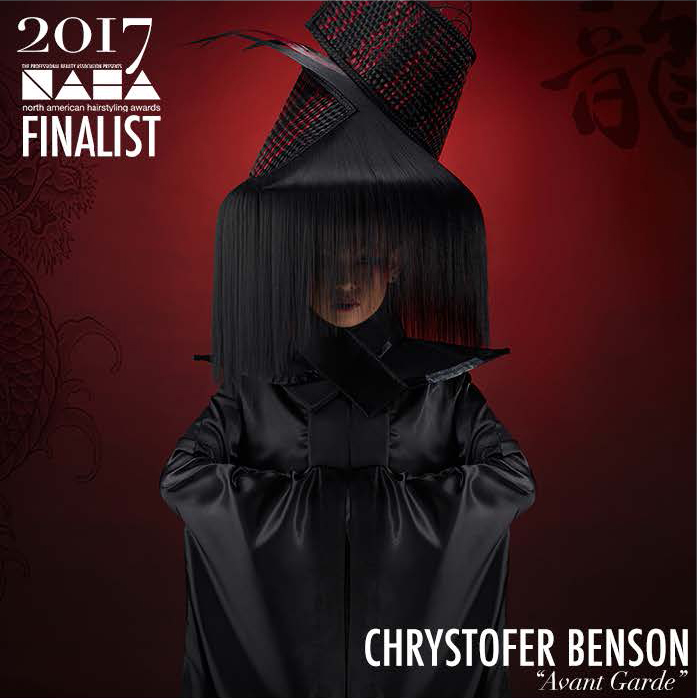 He has already made his mark creatively with constant recognition over the last few years as a regular finalist and winner at NAHA. 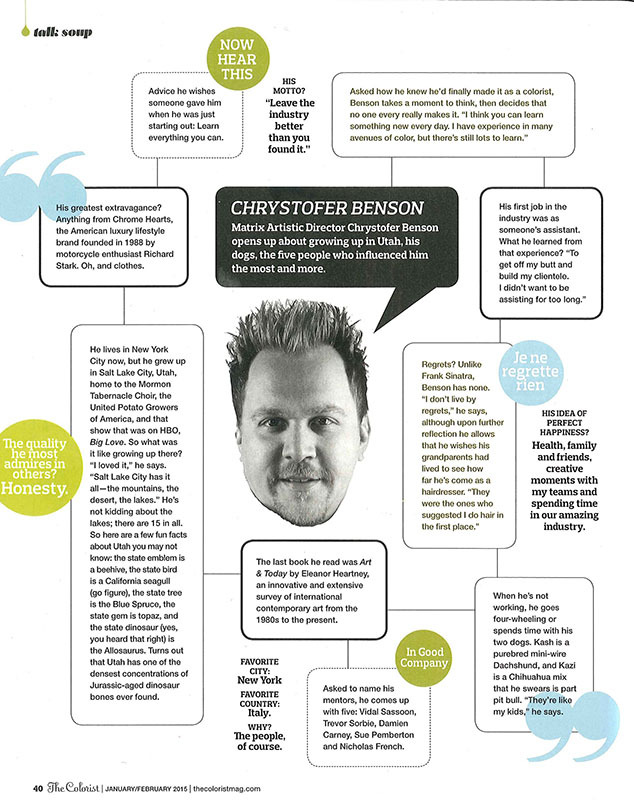 This is only the tip of the iceberg. 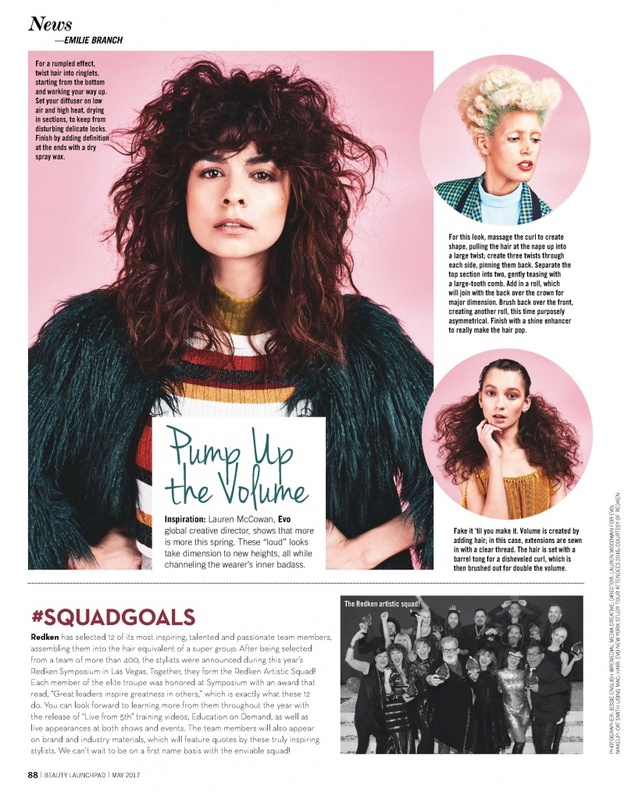 His real strength and point of difference is his loyalty to his team, his refusal to lower his standards, his constant search for new areas of growth personally. 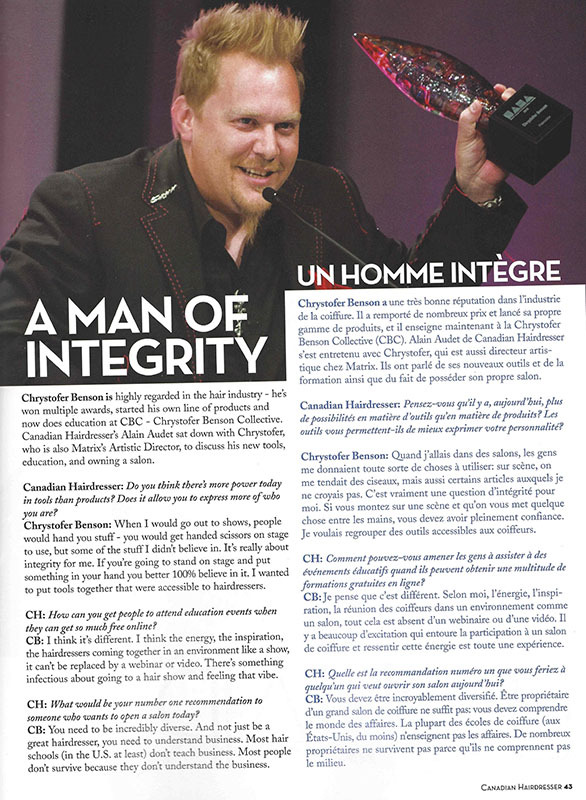 Above all is his ability to selflessly take young talent and support, inspire and nurture it – while still allowing the young talent to retain their own unique identity. 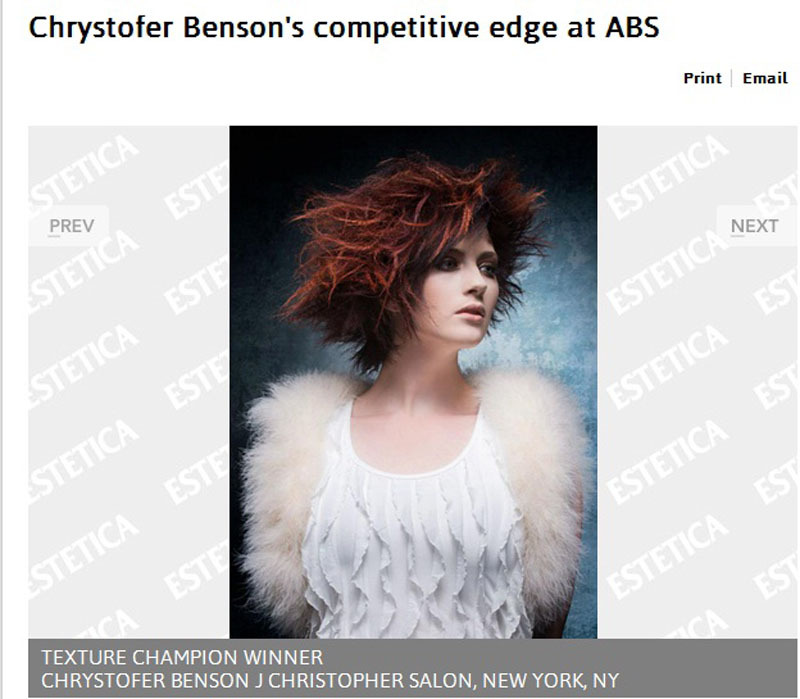 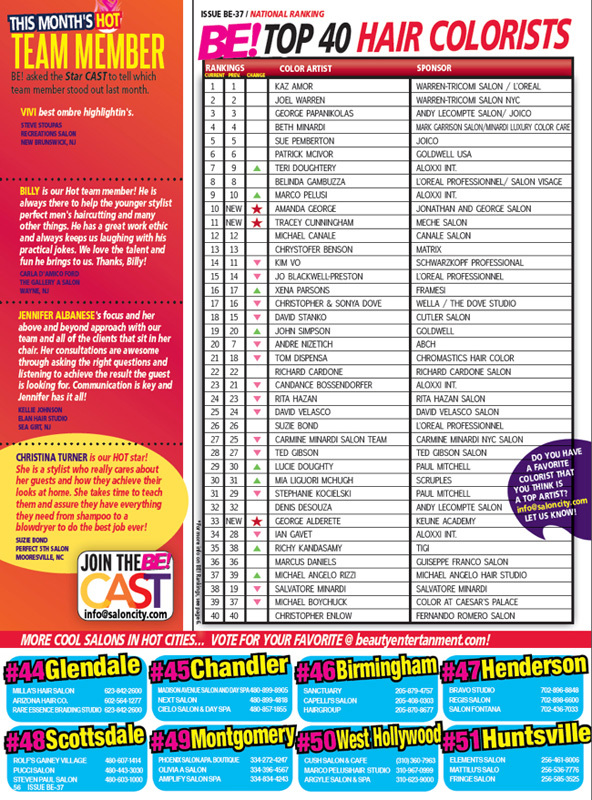 Chrystofer Benson is truly a remarkable talent in our industry. 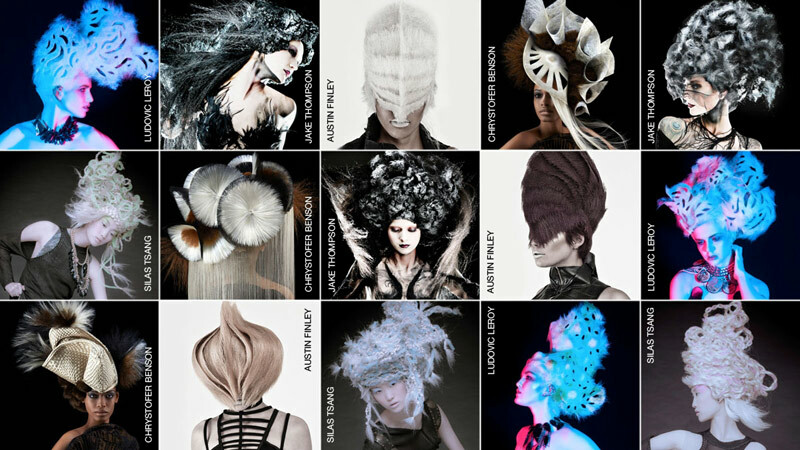 He magically combines artistic inspiration, passionate conviction and unmatched technical talent to transform every look into a stunning masterpiece. 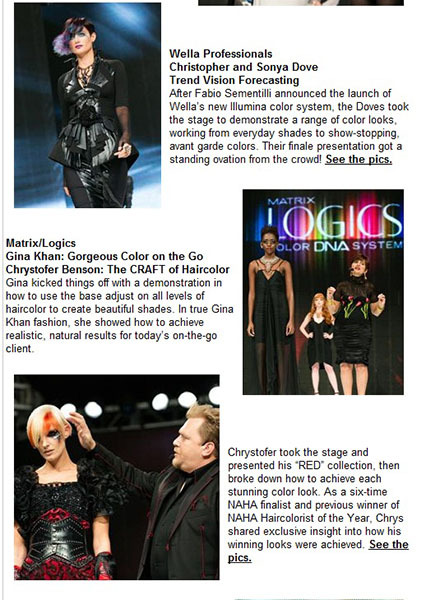 He is the epitome of a master stylist! 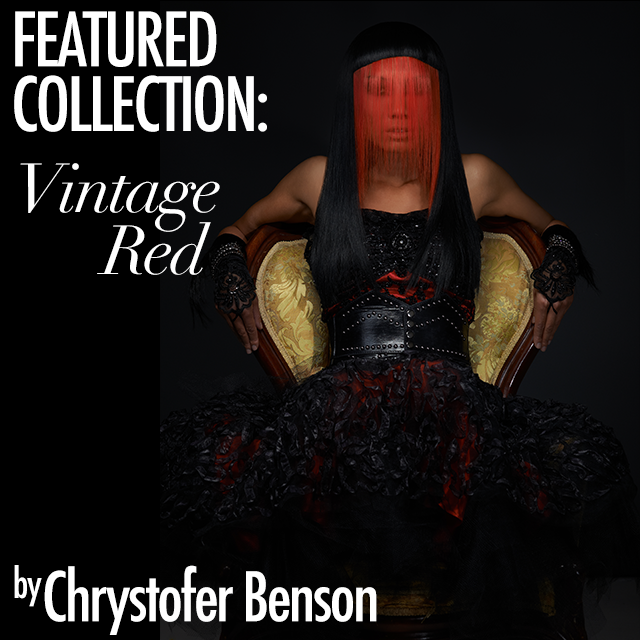 Chrystofer Benson is one the most creatively driven and talented artists I know. 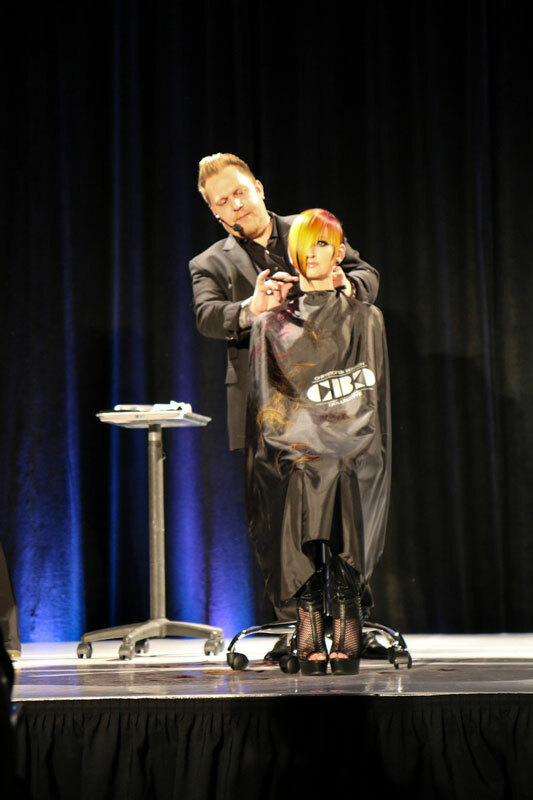 His pursuit for excellence is visible in his career and creative endeavors. 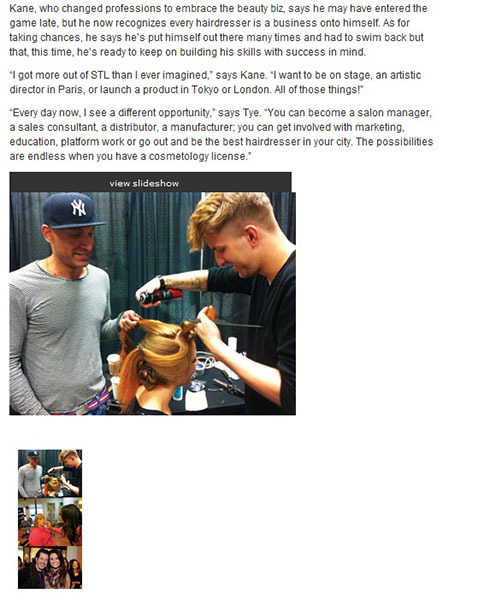 I admire his constant push to grow, and not just for himself but for the people around him as well. 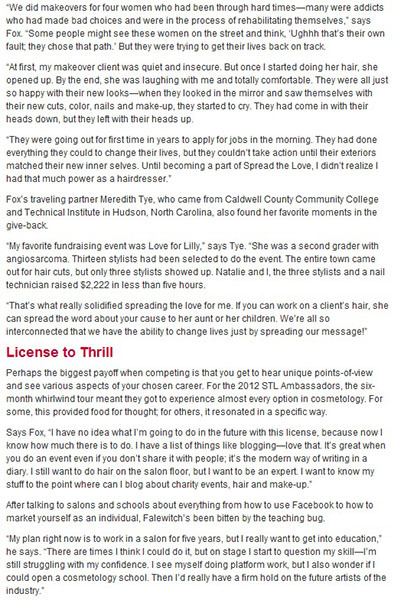 I could not ask for a better person and friend. 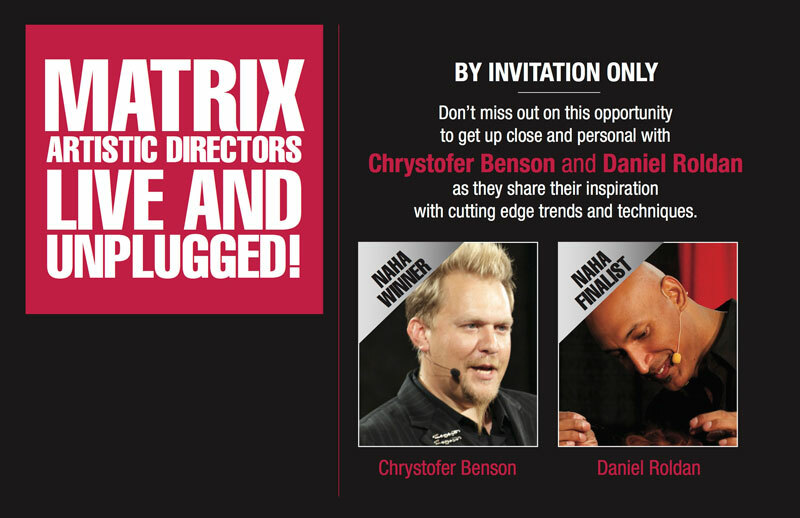 Several years ago I met Chrystofer at the MATRIX Global Academy in NYC. 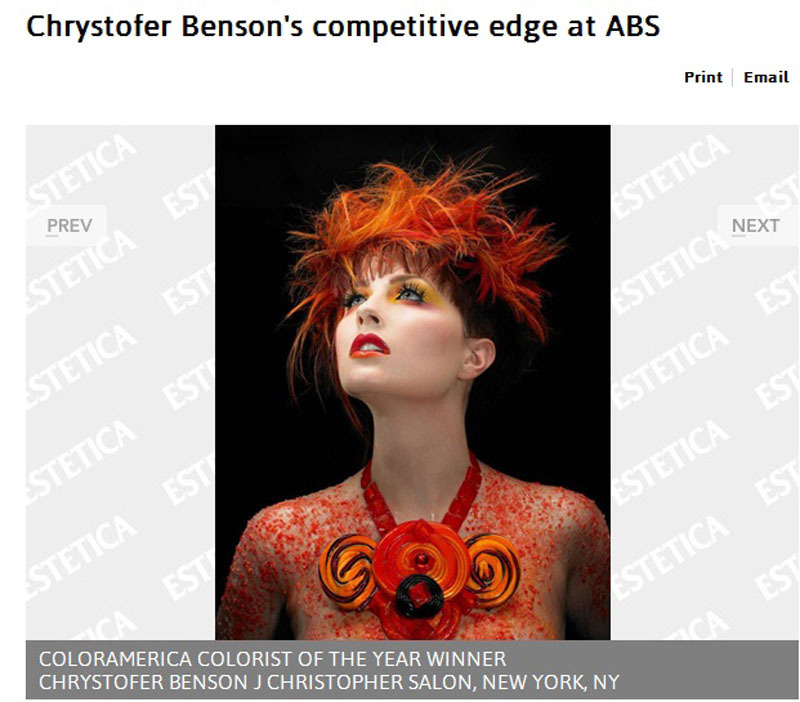 It has been a pleasure following Chrystofer’s development and artistry. 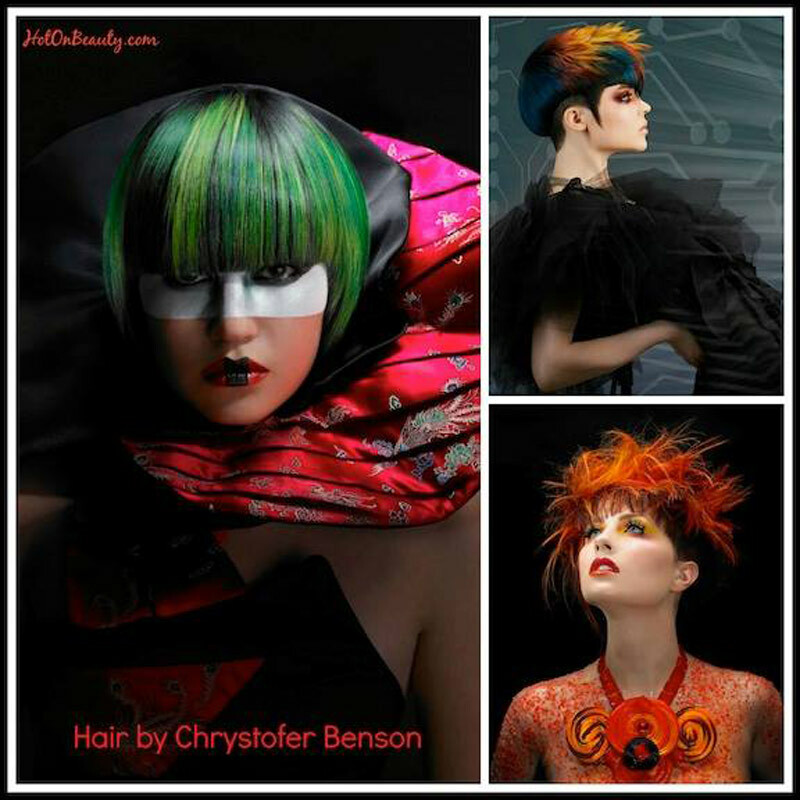 Whether in a classroom setting, on stage, or simply conversing with a stylist one on one, Chrystofer creates his own energy charged environment. 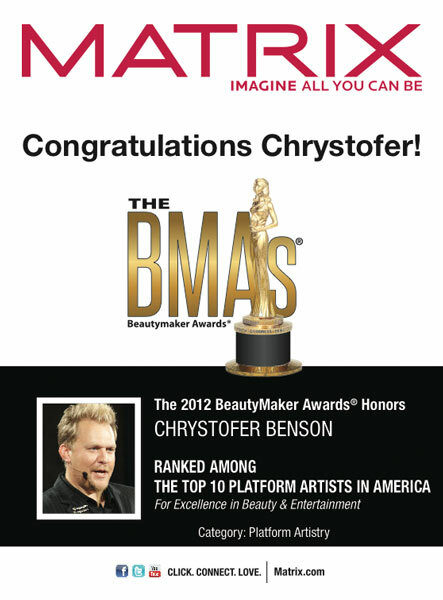 I believe with my whole heart that Chrystofer sees himself as a servant to the hairdresser. 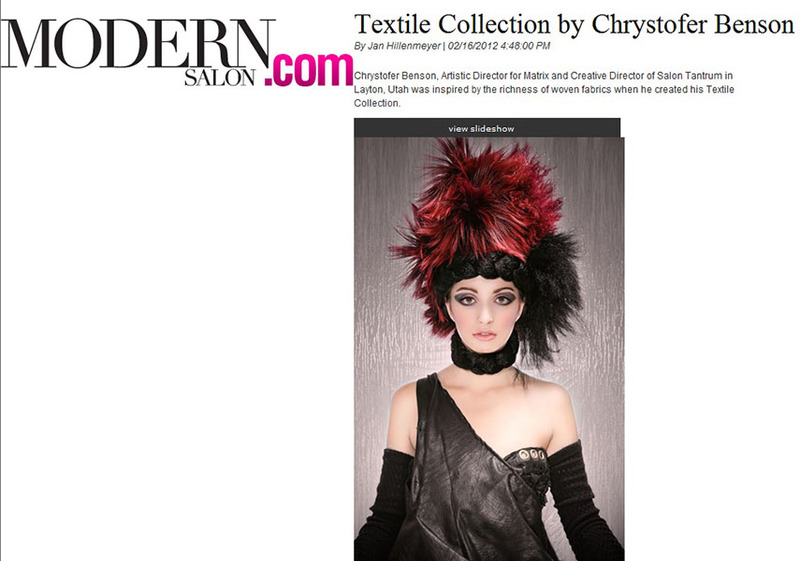 What Chrystofer has passionately created and continues to create is inspired, original, and truly incredible. 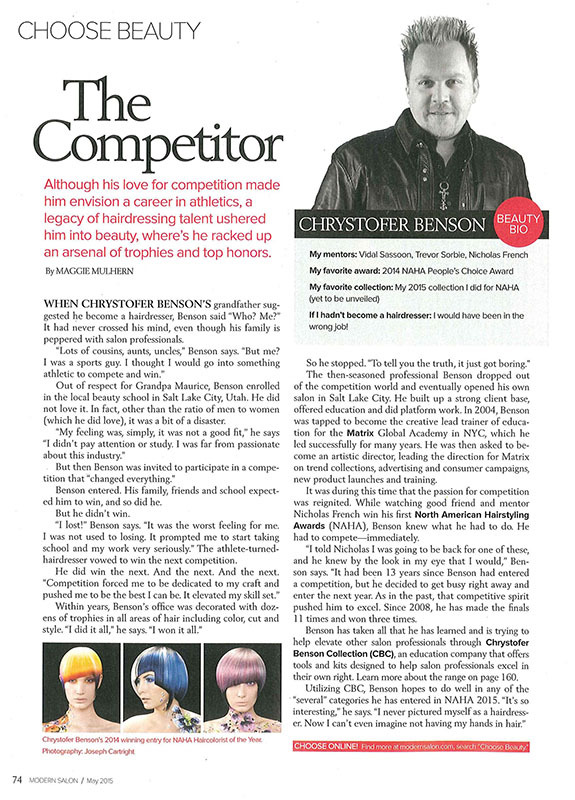 Chrystofer Benson , without question, is a true gift to our industry. 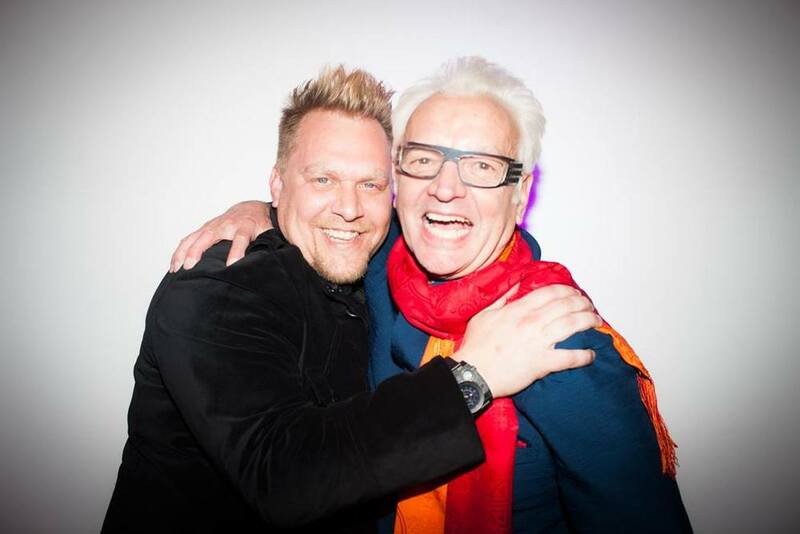 I am honored to call him my friend. 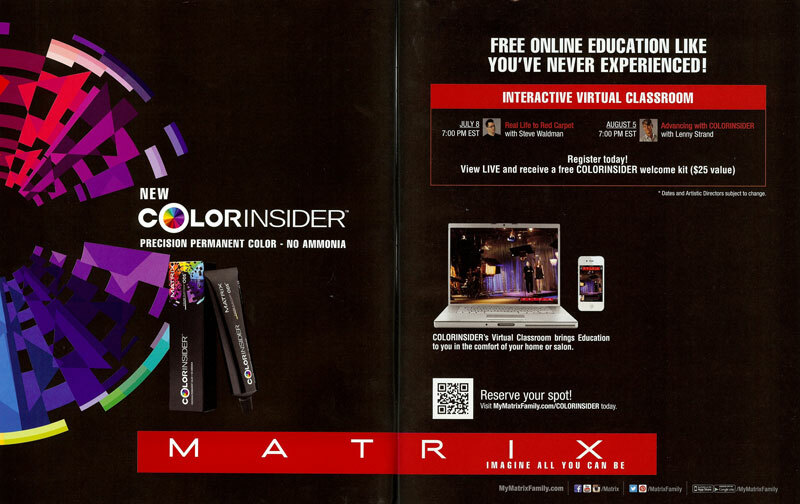 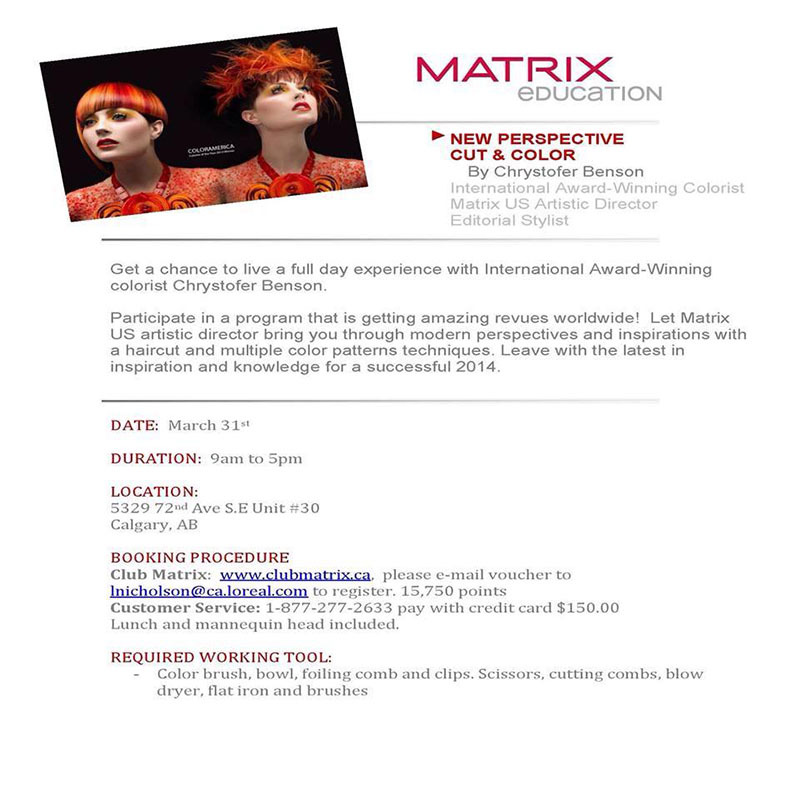 Matrix Imagination: And the Experience Gets Better and Better! 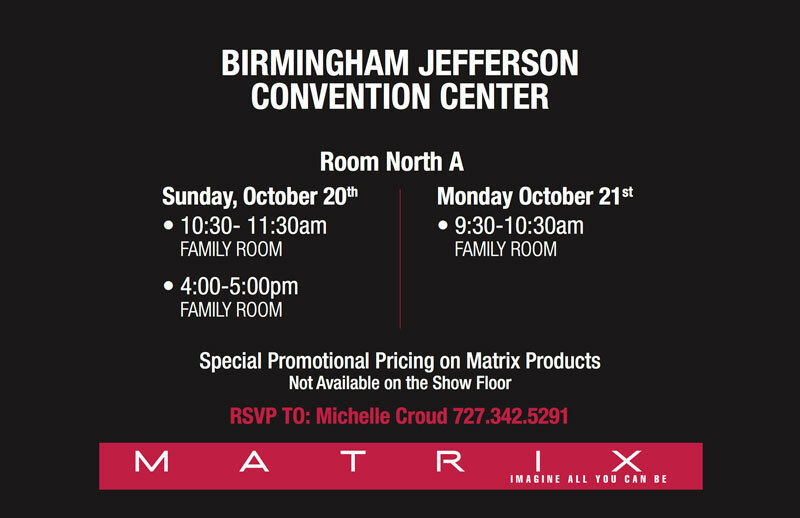 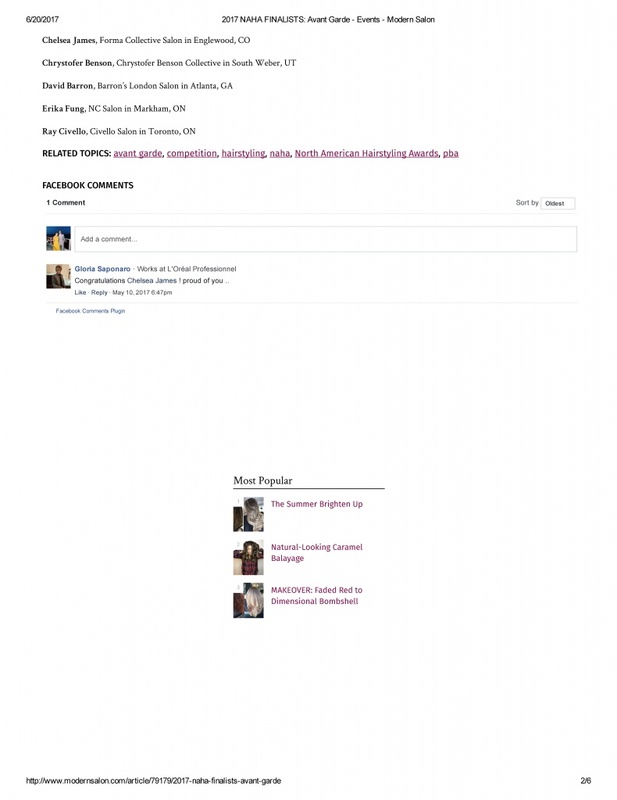 When I wrote the subject line of this blog about Matrix’s 2011 Imagination, ‘And it gets better and better,’ I meant it… This show was unlike any other manufacturer show. 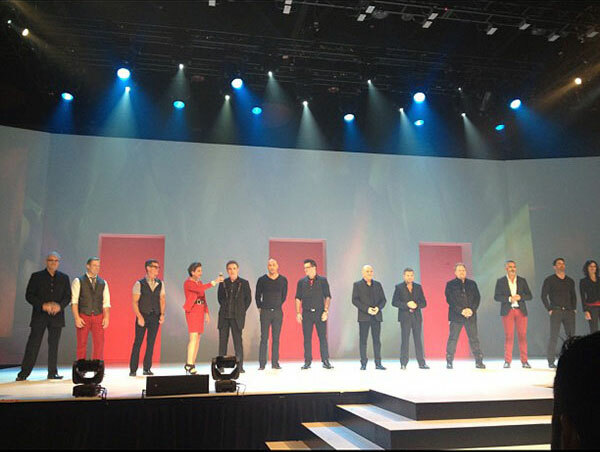 The General Session began with an incredible performance by the Matrix Artistic Directors Team! 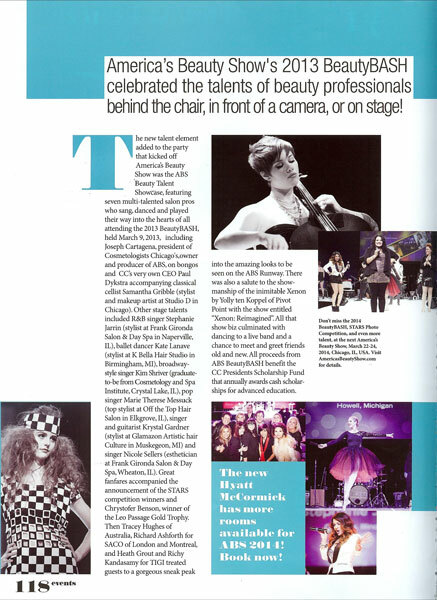 Sometimes, I see something so beautiful that it brings a huge smile to my face – but with the amazing looks executed and performed on stage, I had butterflies in my stomach, goosebumps on my arms and tears in my eyes. 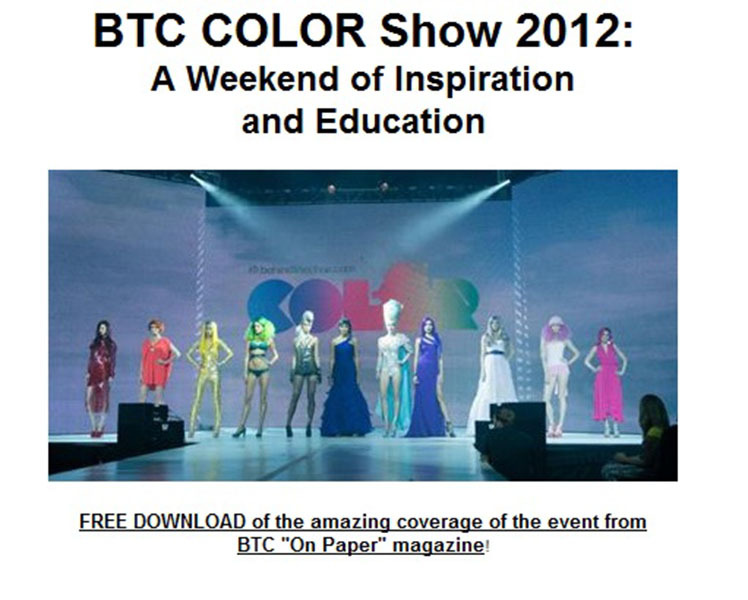 Those who attended Color America 2010 were in for a treat! 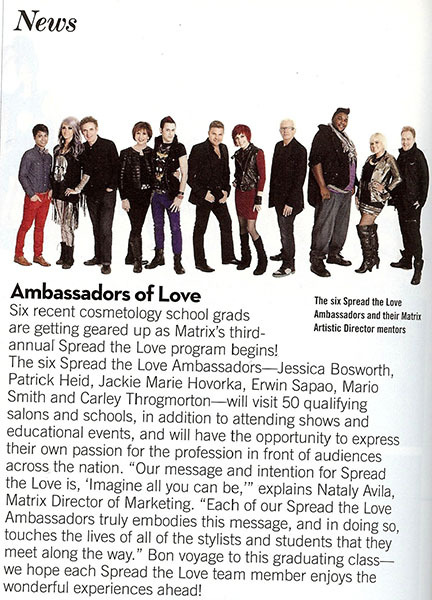 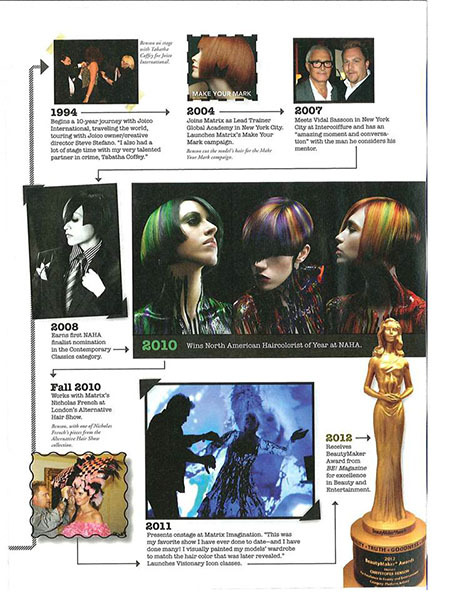 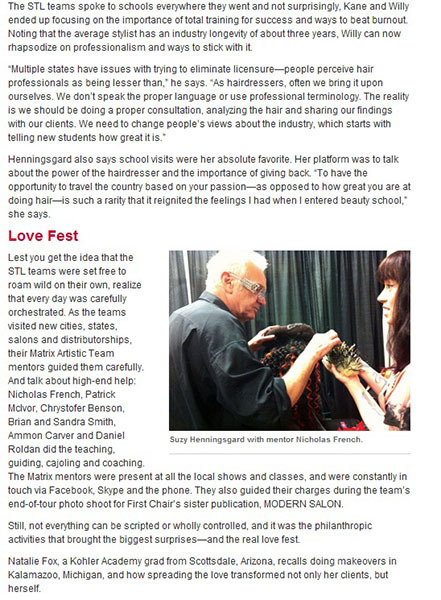 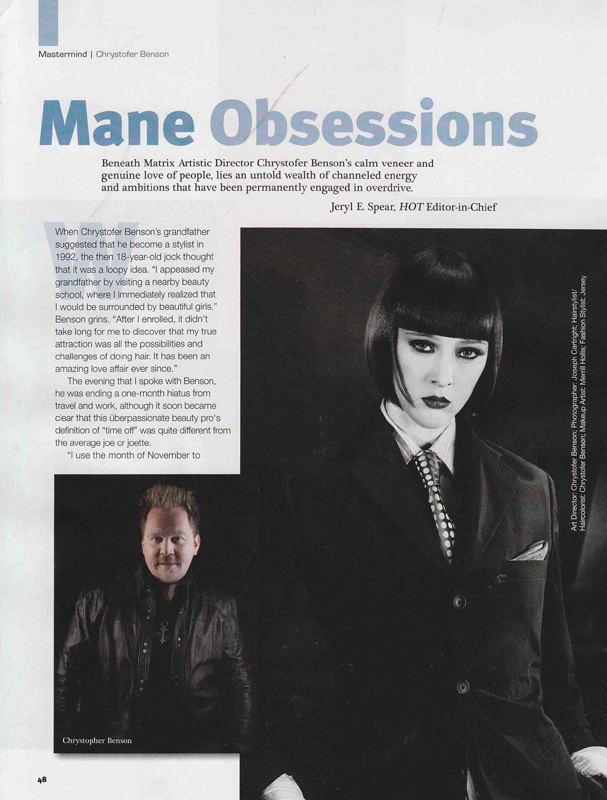 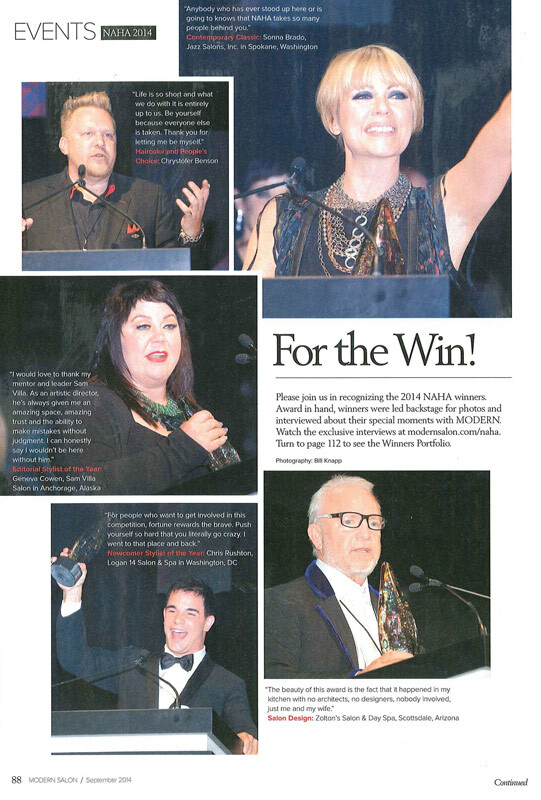 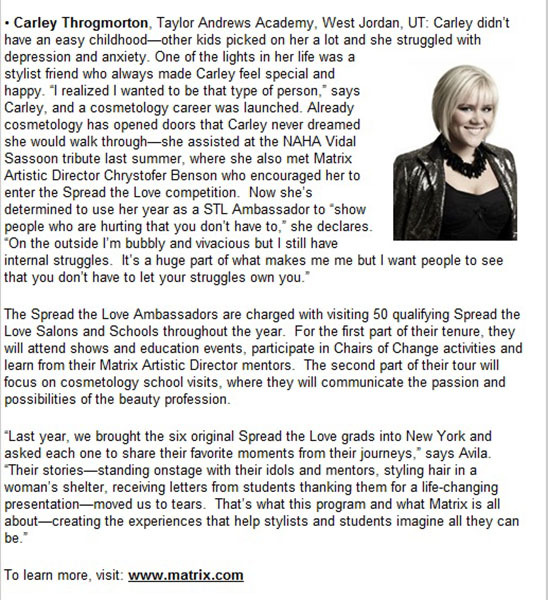 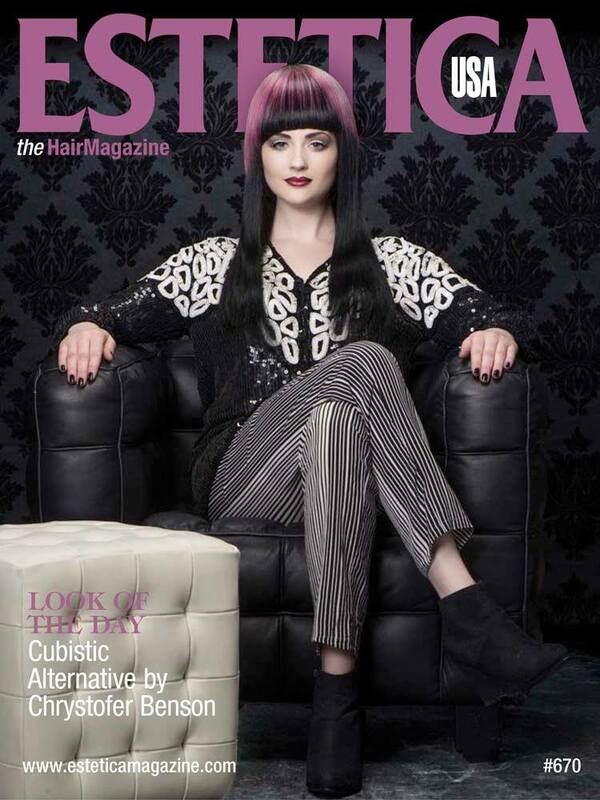 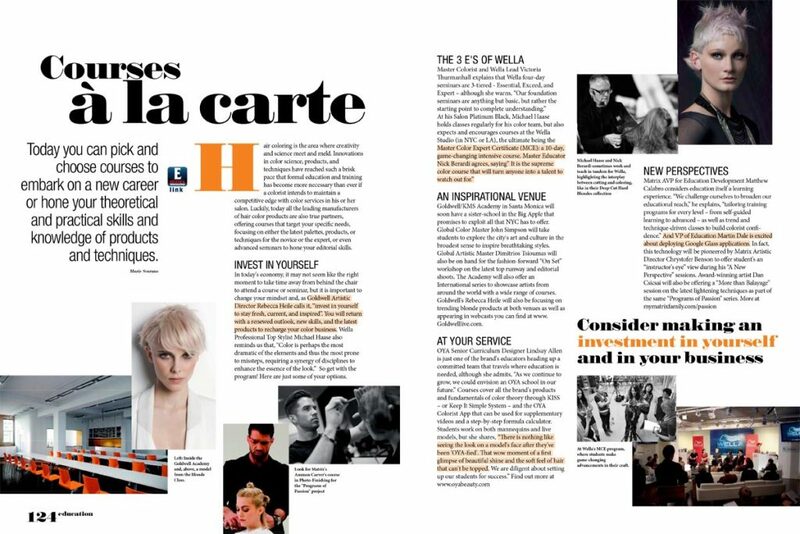 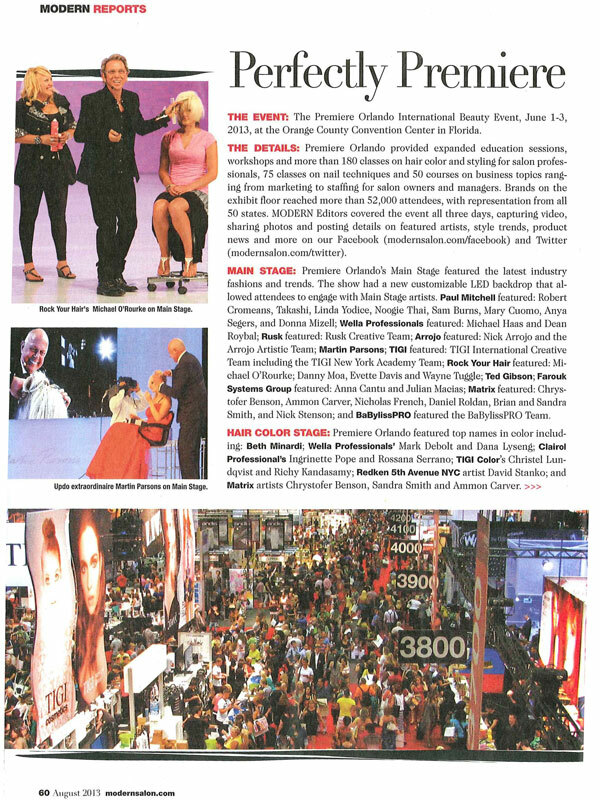 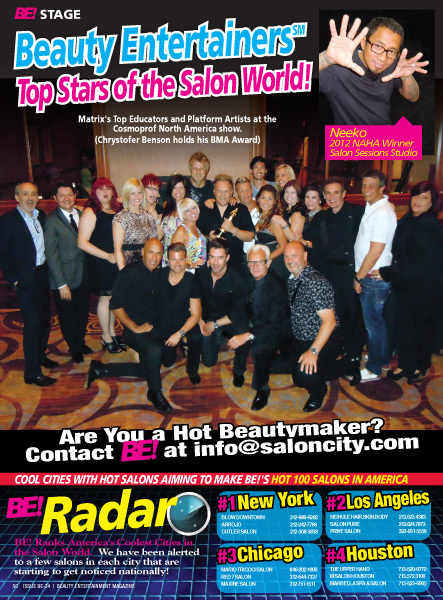 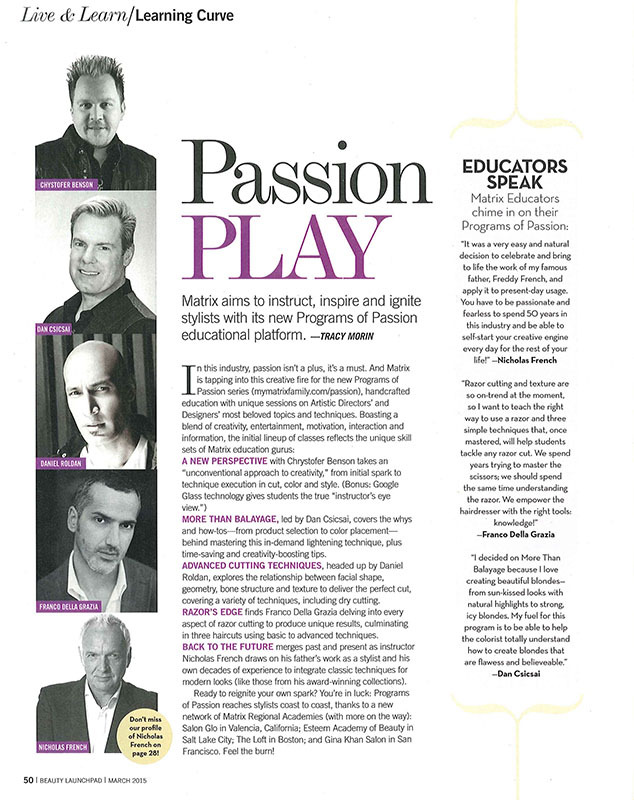 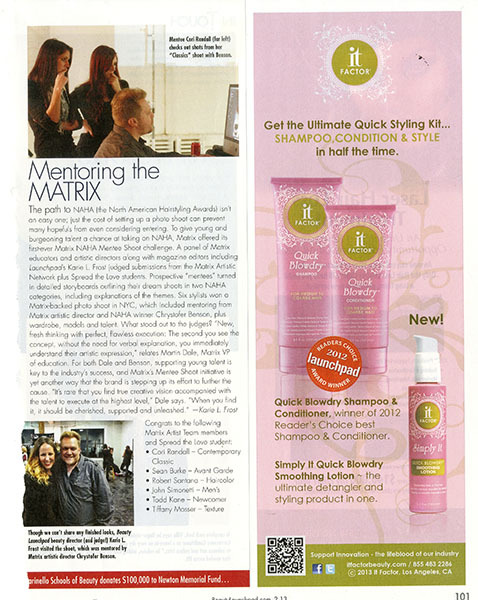 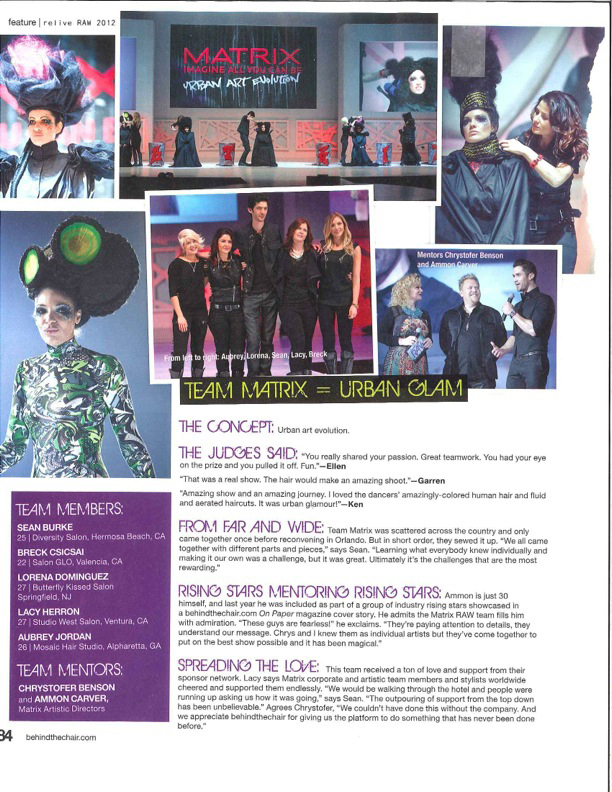 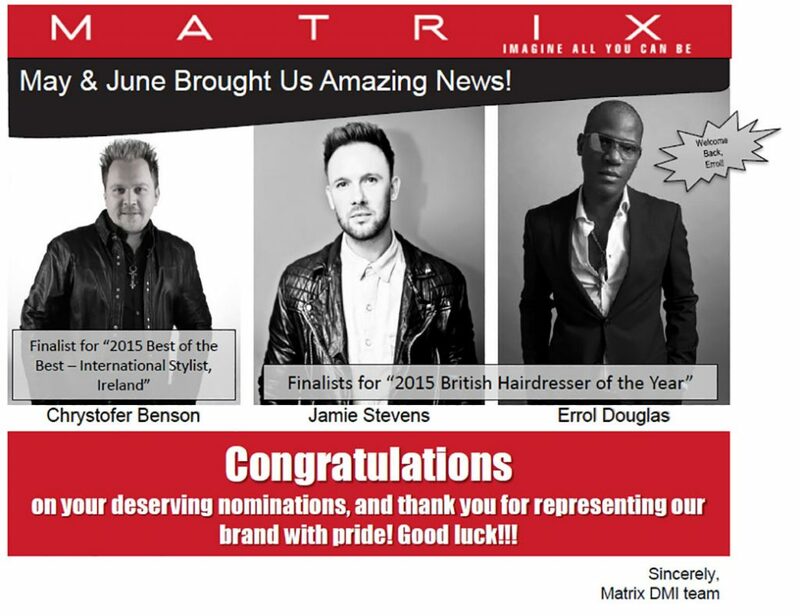 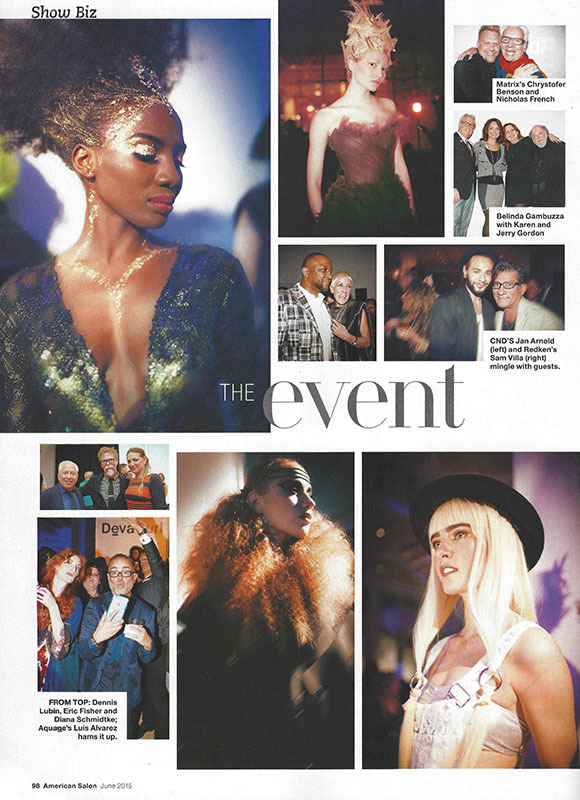 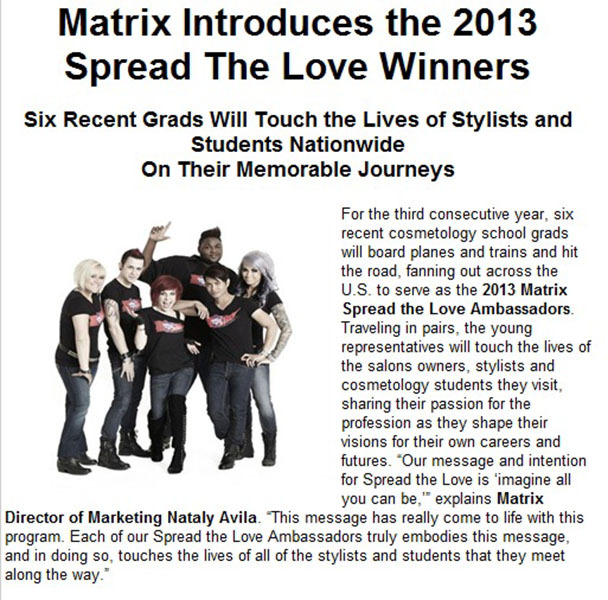 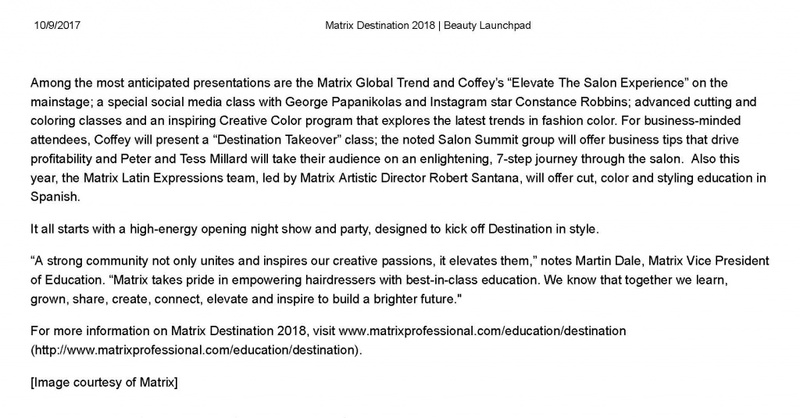 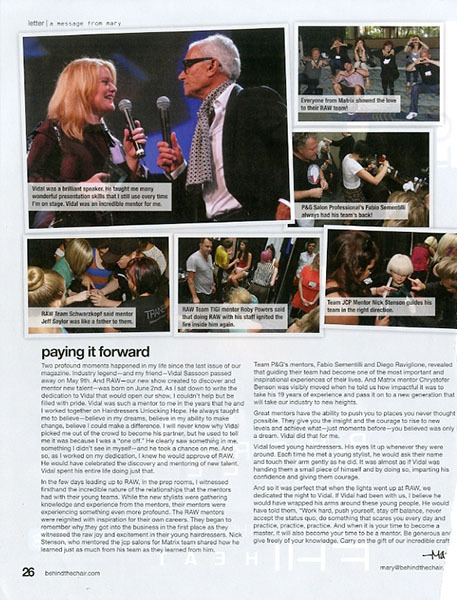 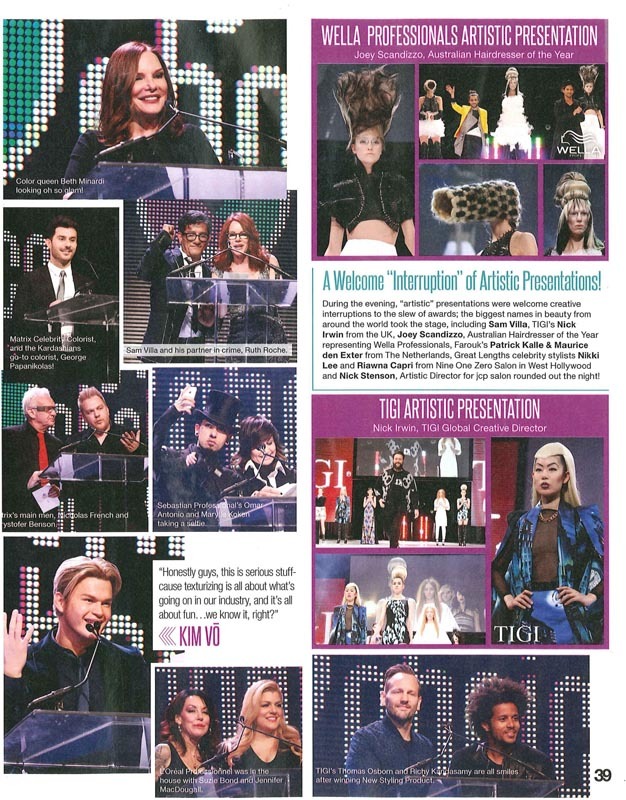 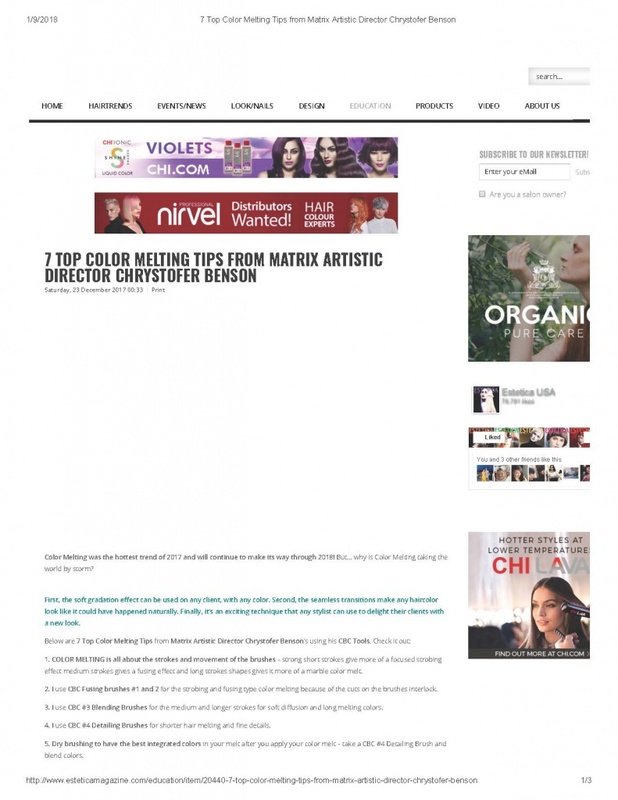 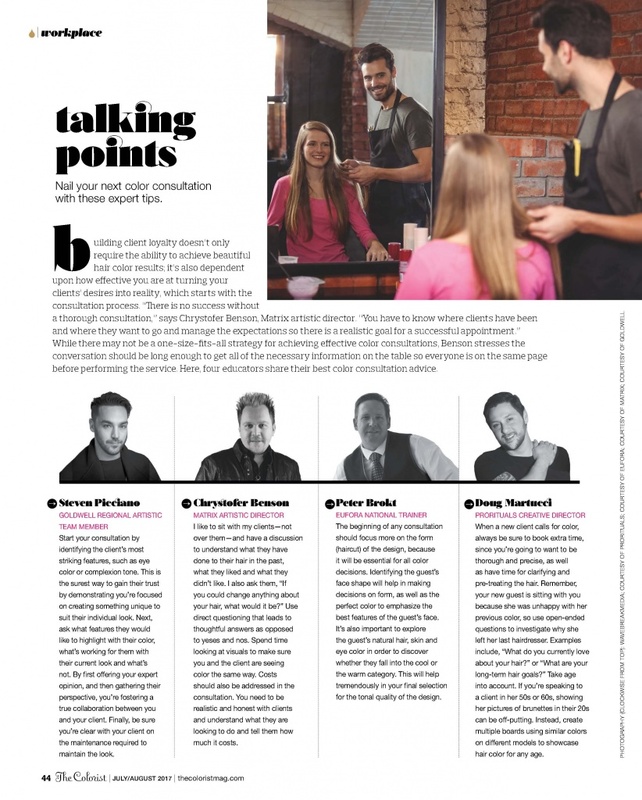 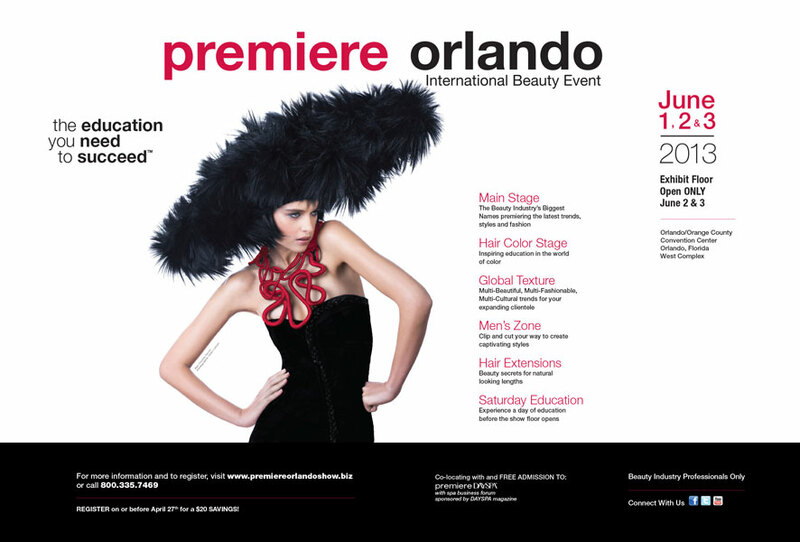 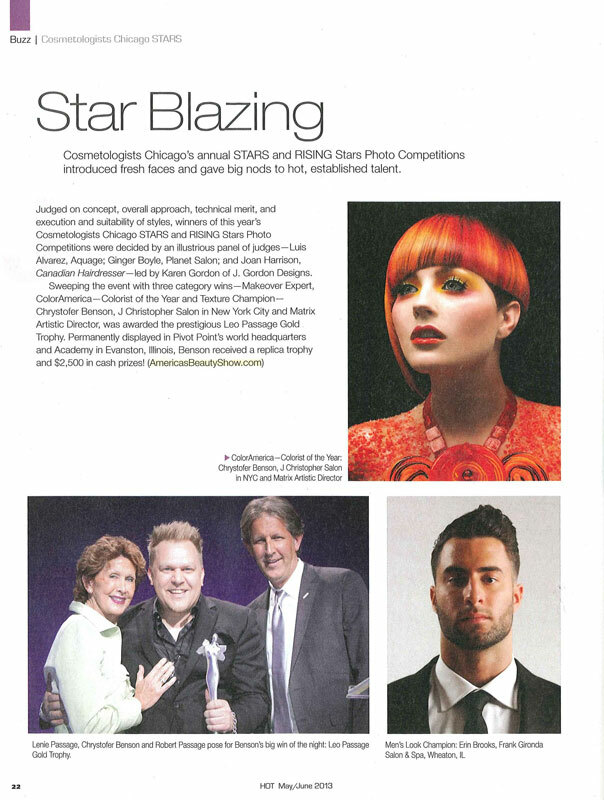 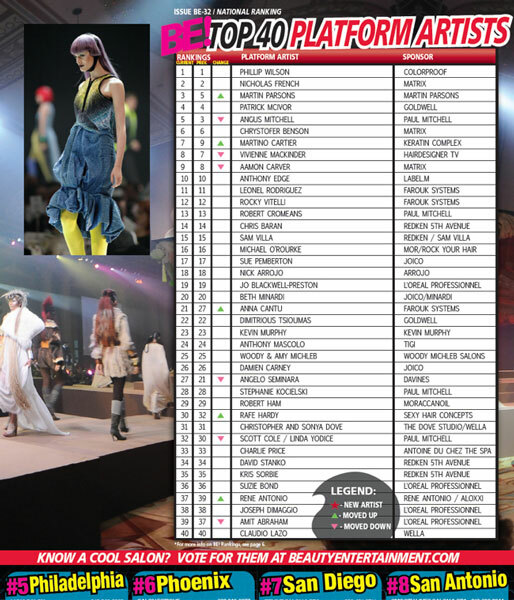 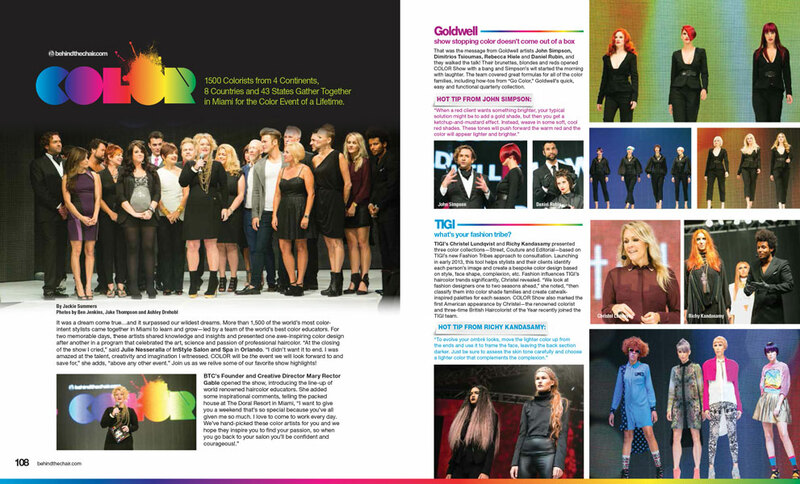 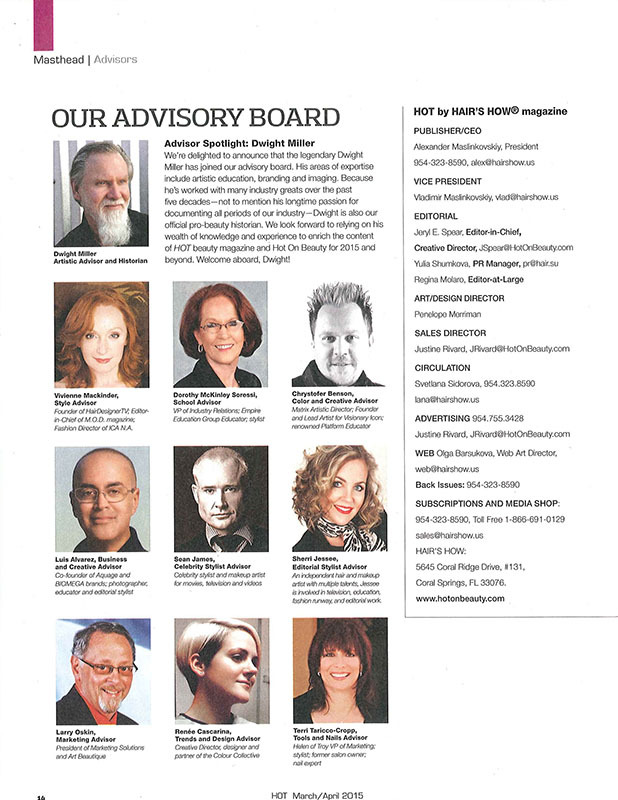 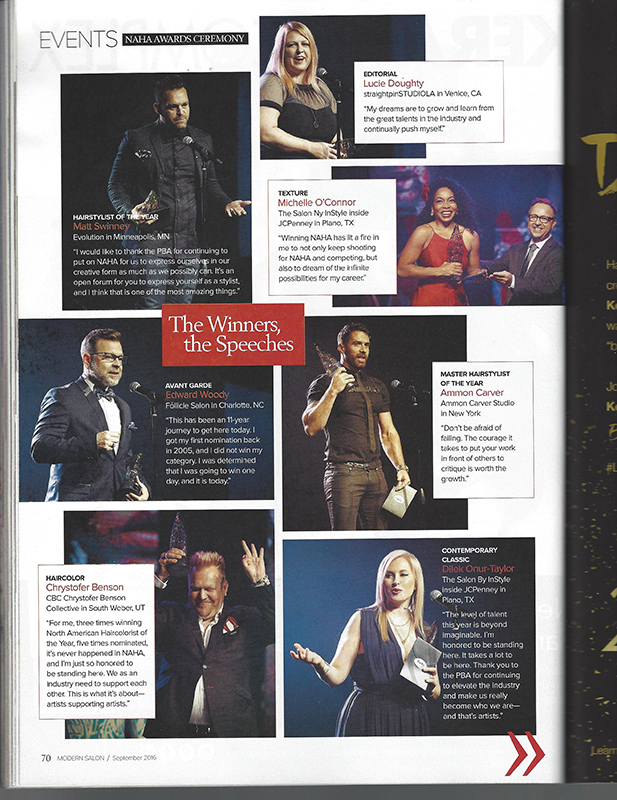 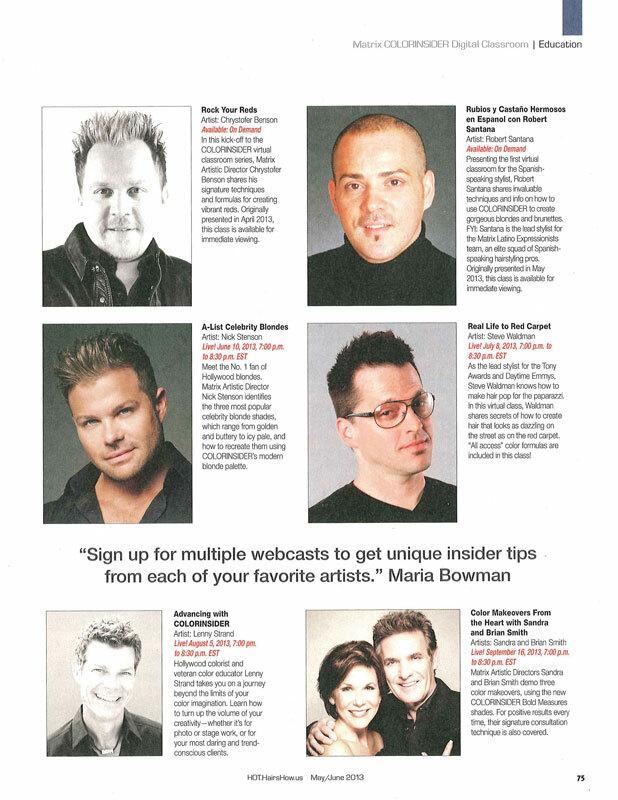 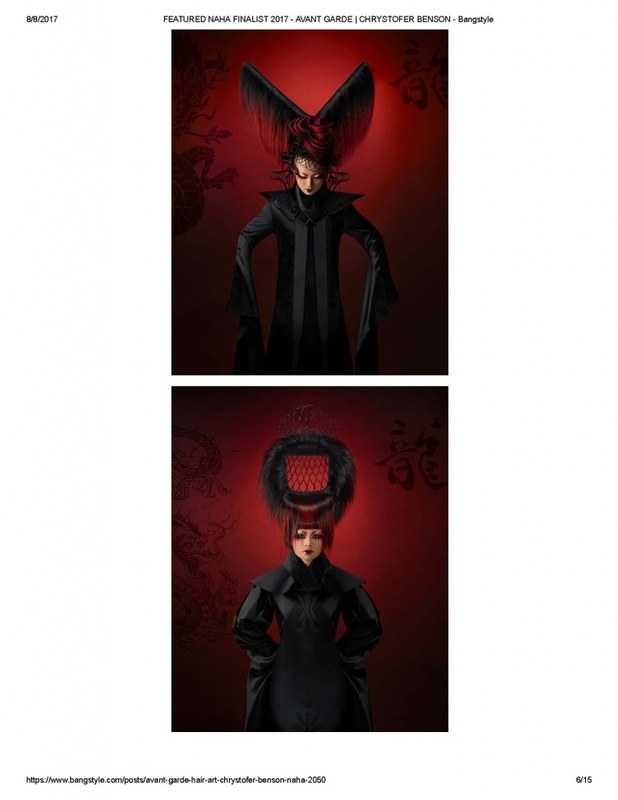 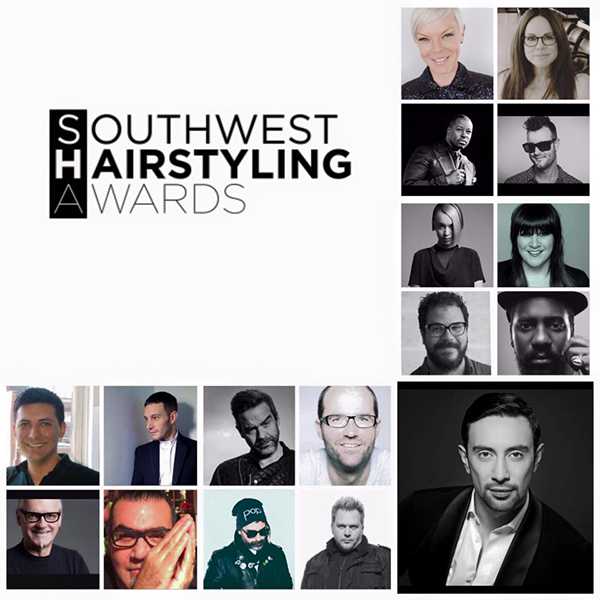 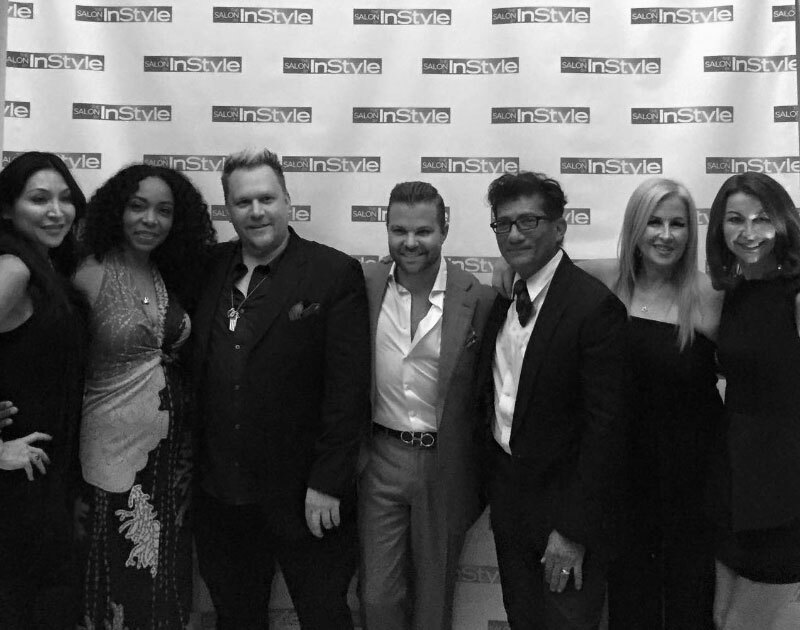 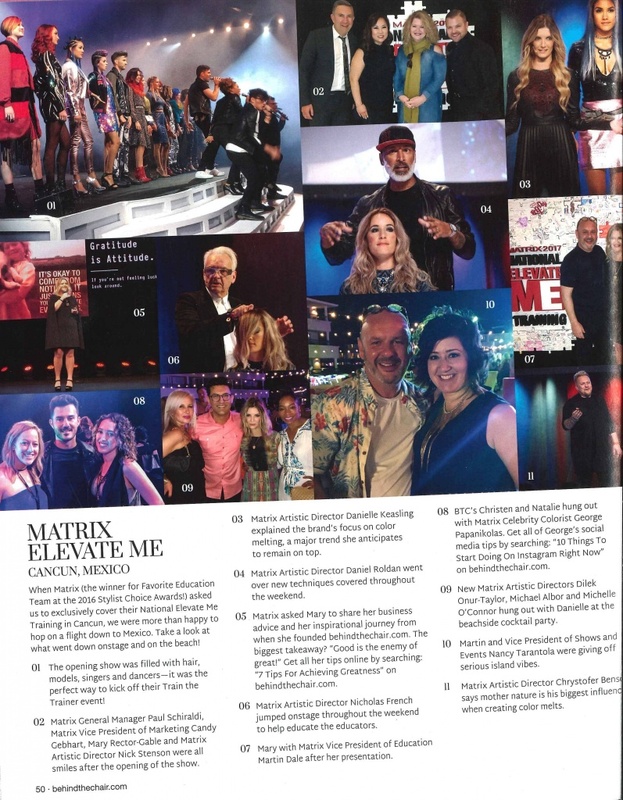 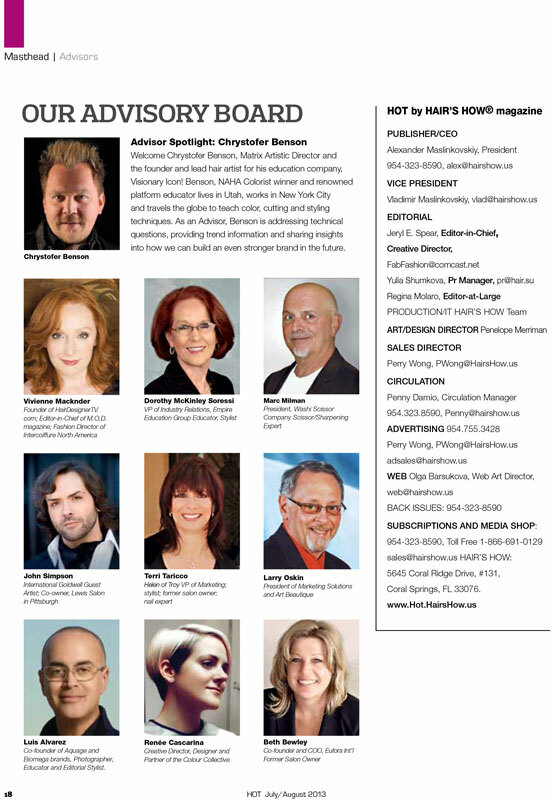 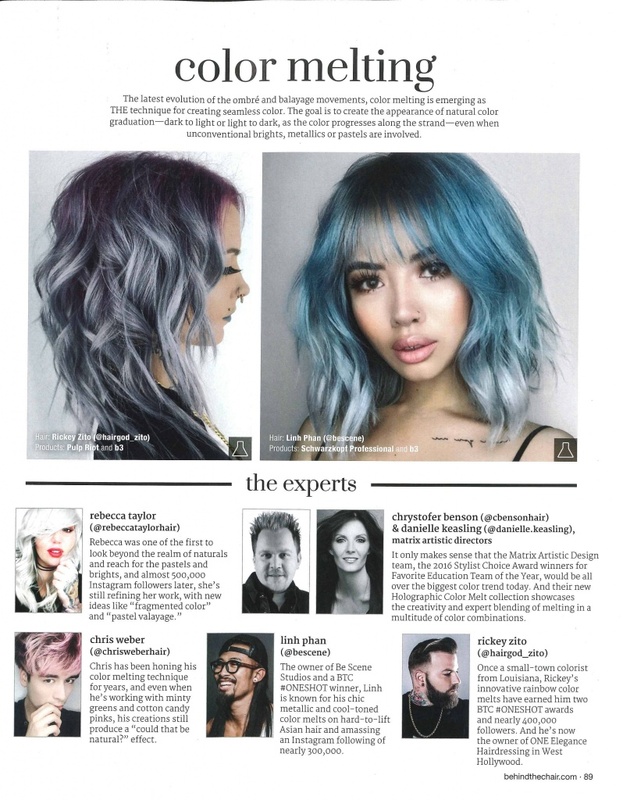 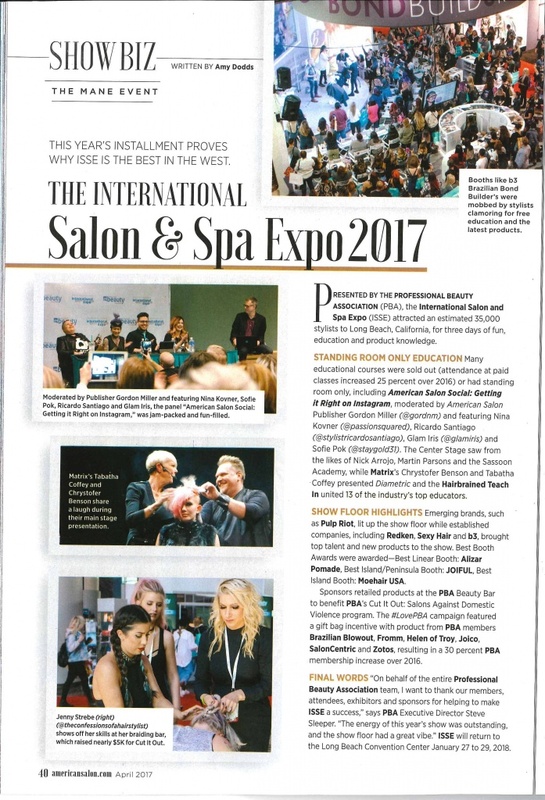 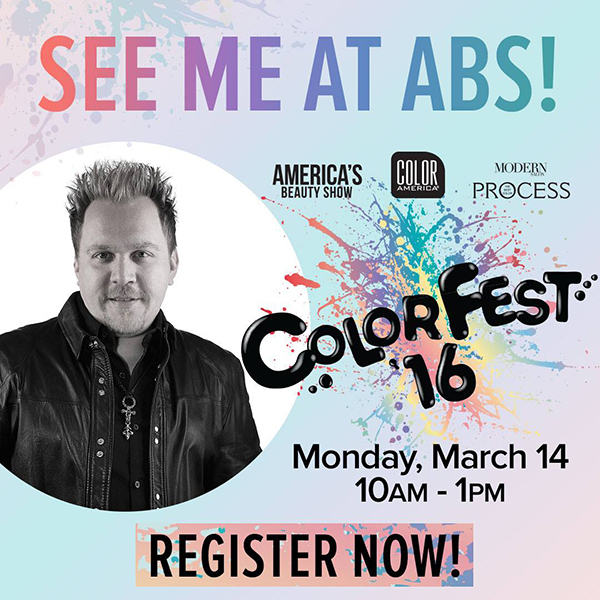 It featured MATRIX Artistic Director – Chrystofer Benson (2010 NAHA Colorist of the year); ARROJO Color Director – James Edick; International Goldwell Guest Artist – John C. Simpson; John Paul Mitchell’s Kelly Cardenas; and Master of Ceremonies Patrick McIvor. 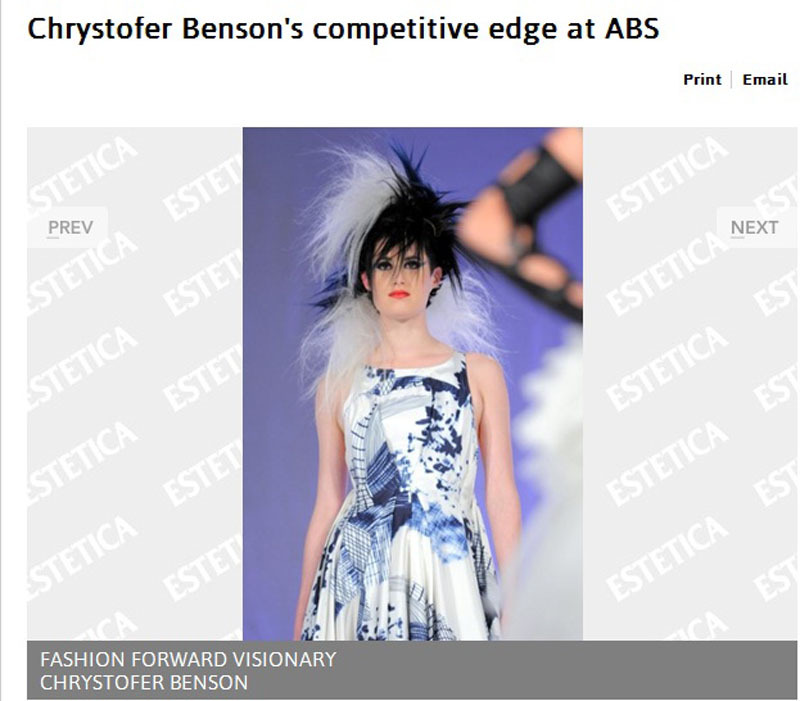 Chrystofer Benson’s show was the most colorful presentation out of the bunch. 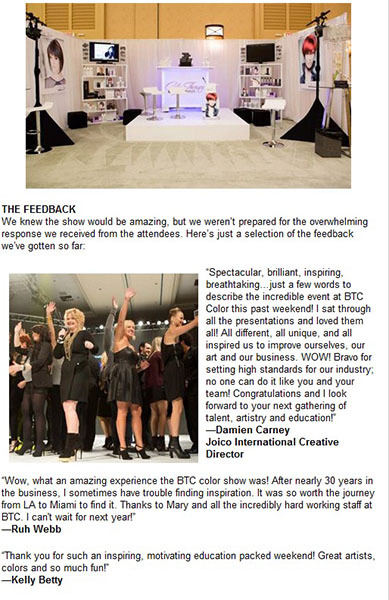 I knew something BIG was going to happen when the mix of Justice’s Genesisstarted playing and the stage/runway lit up. 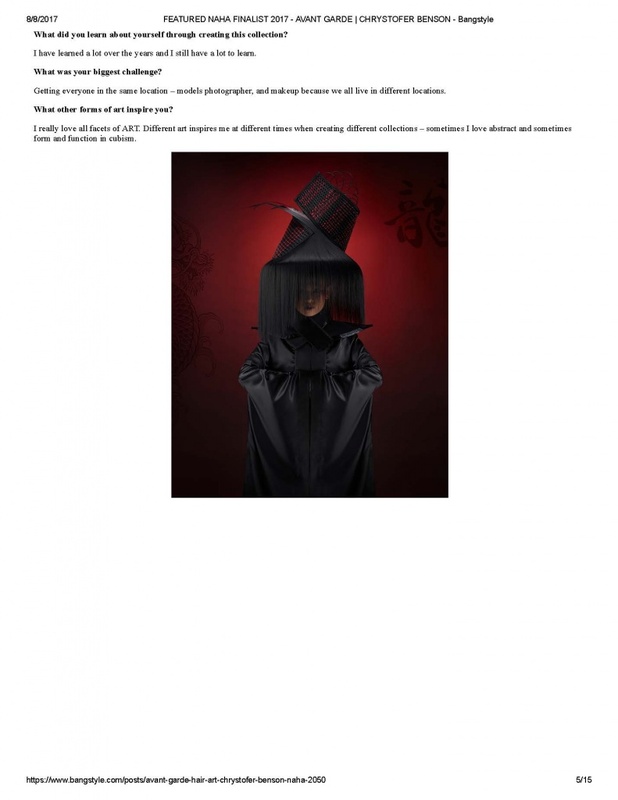 Suddenly, three models draped in heavy robes walked onto the runway. 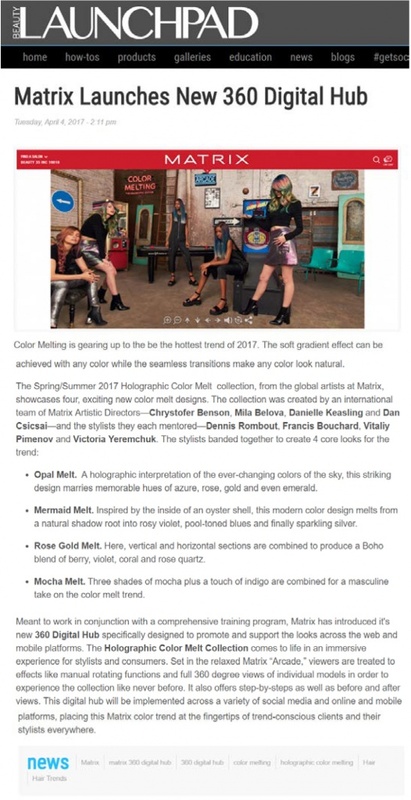 The coolest moment was when they unveiled the models. 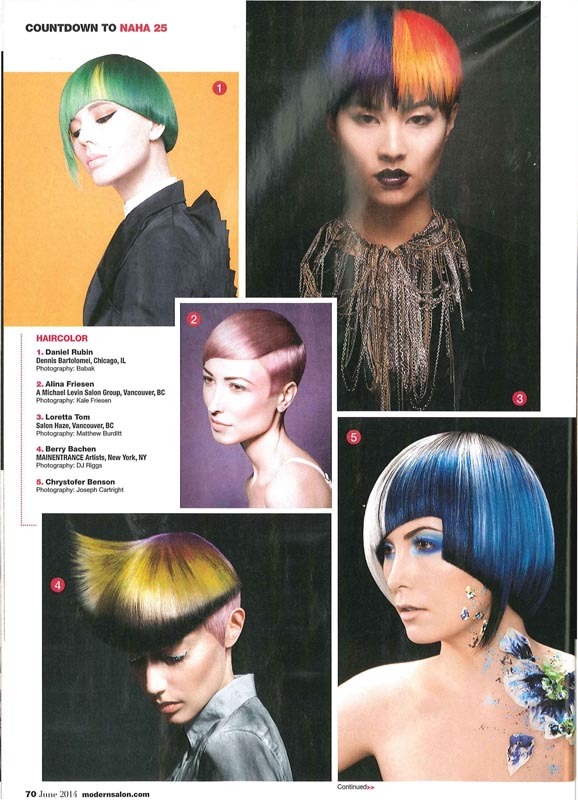 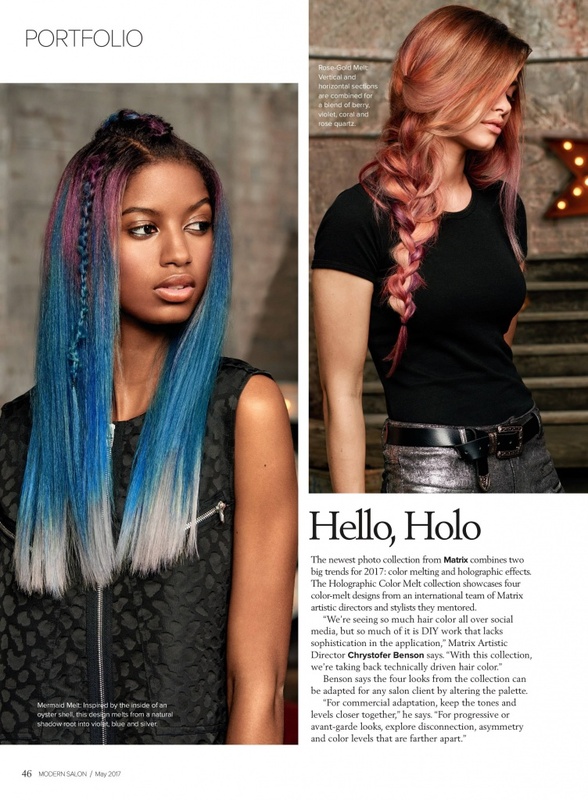 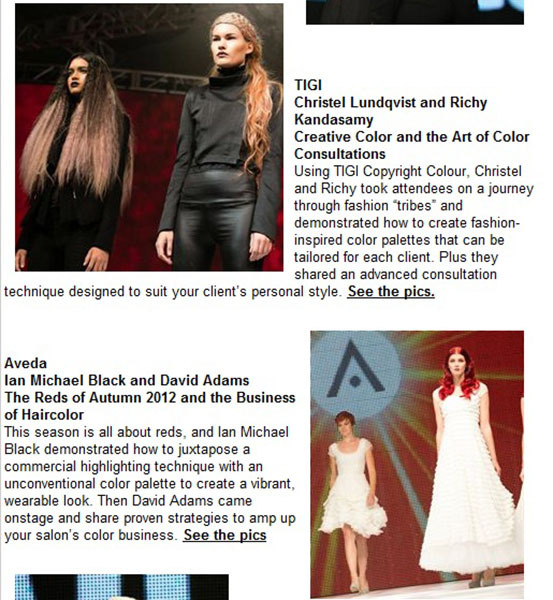 The “Fusion Collection models” were masterpieces fusing color from the hair onto wardrobe. 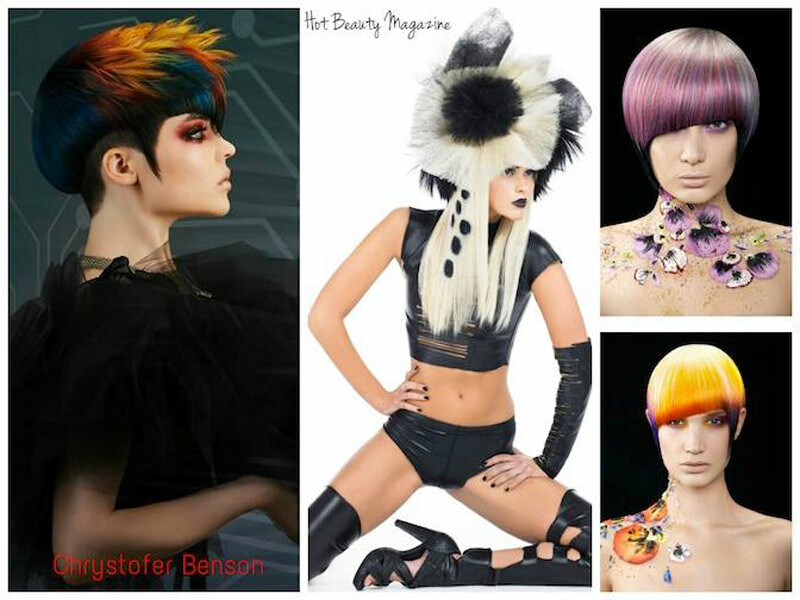 Soon after, Benson showed the crowd the techniques and formulas he used to create each hair design.